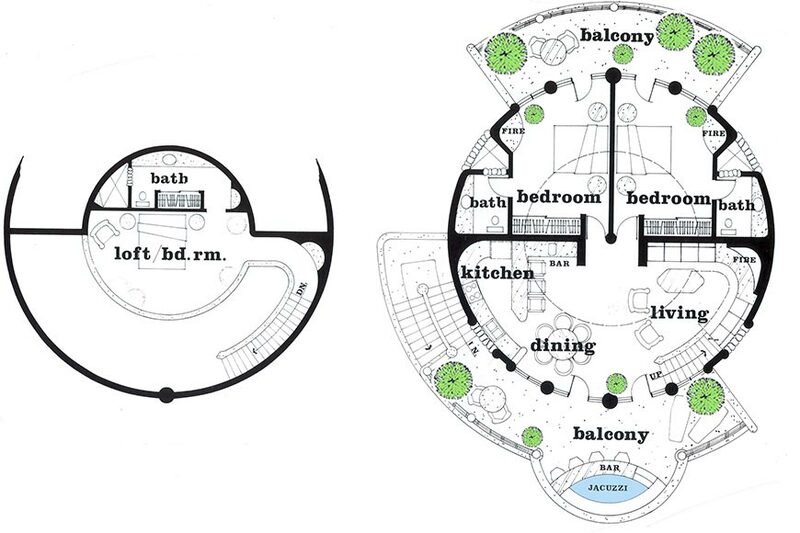 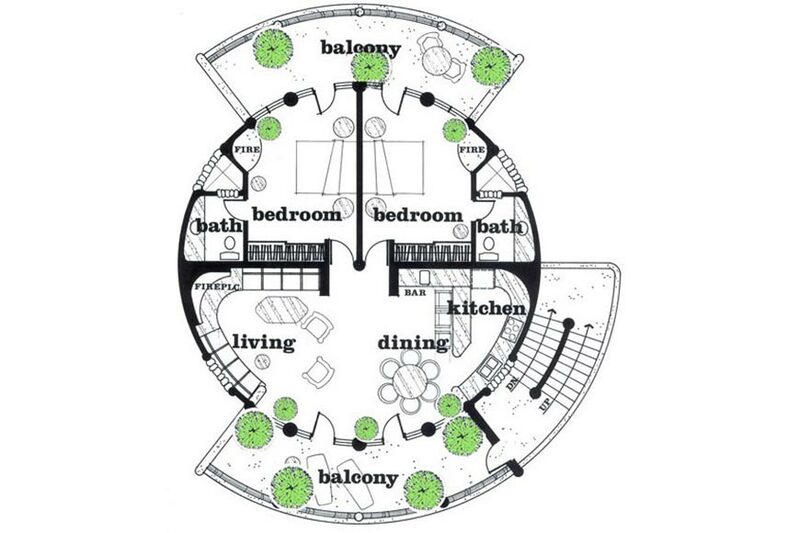 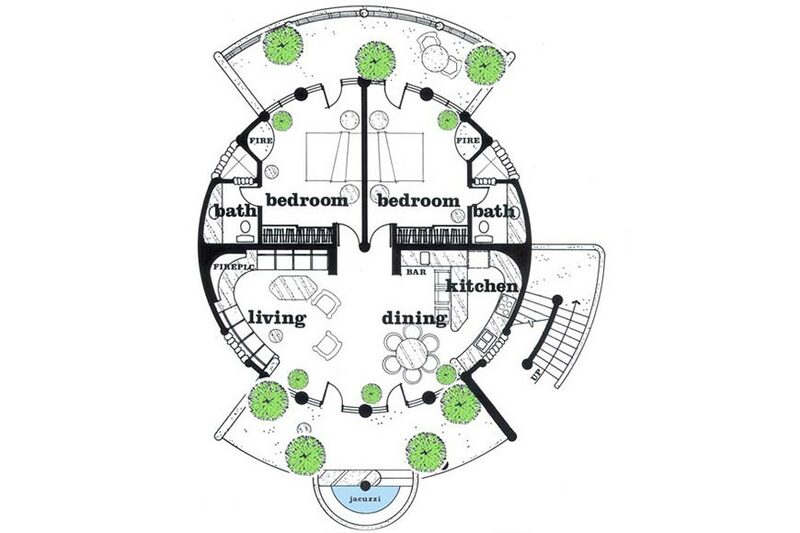 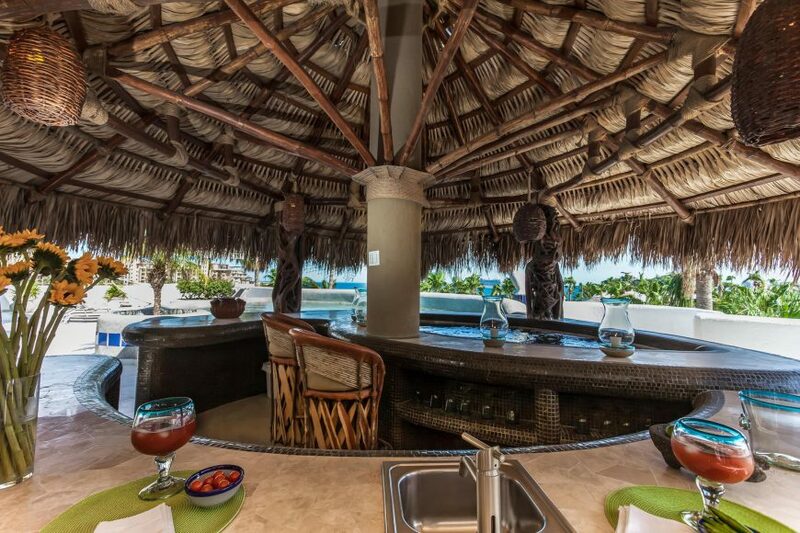 Second-story, two bedroom penthouse unit with a bar and spa. 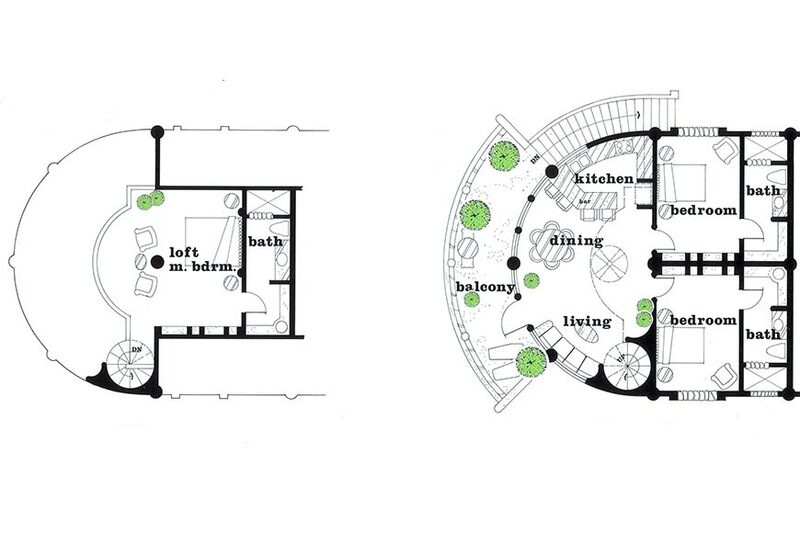 2,139 square feet of total floor area. Second story, two bedroom penthouse unit with a full ocean view. 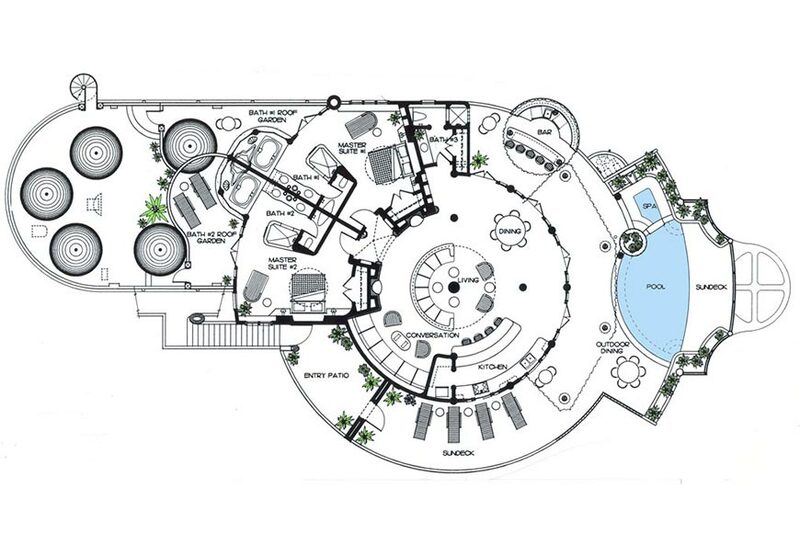 2,777 square feet of total floor area. 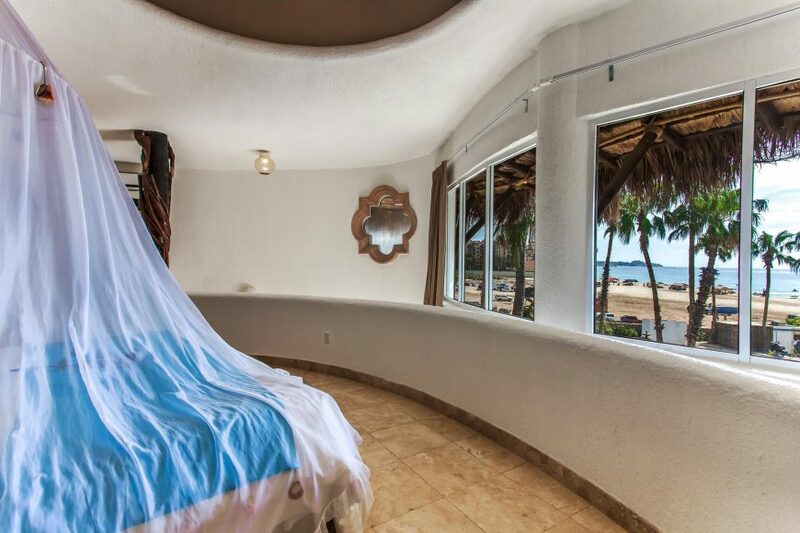 Second story, two bedroom penthouse unit with a full ocean view. 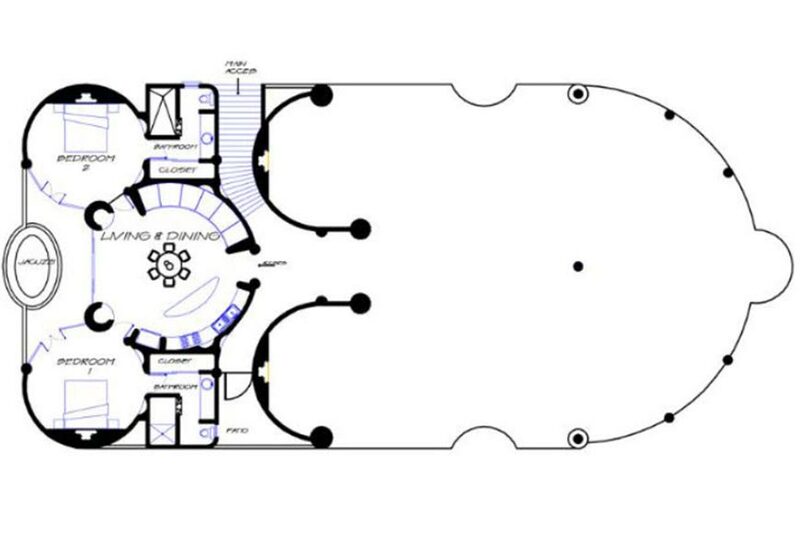 2,657 square feet of total floor area. 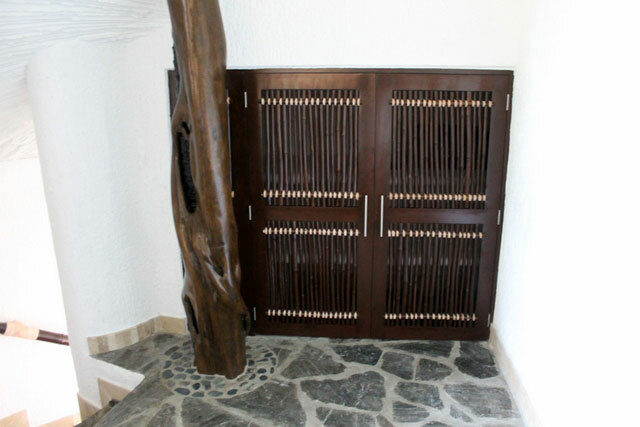 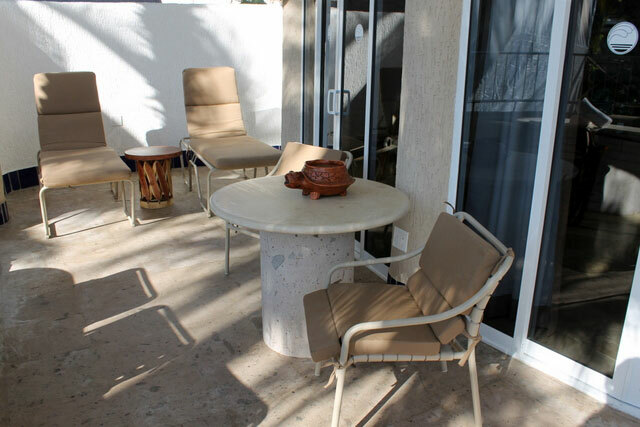 One story, ground-floor unit with two bedrooms located in buildings 6 & 18. 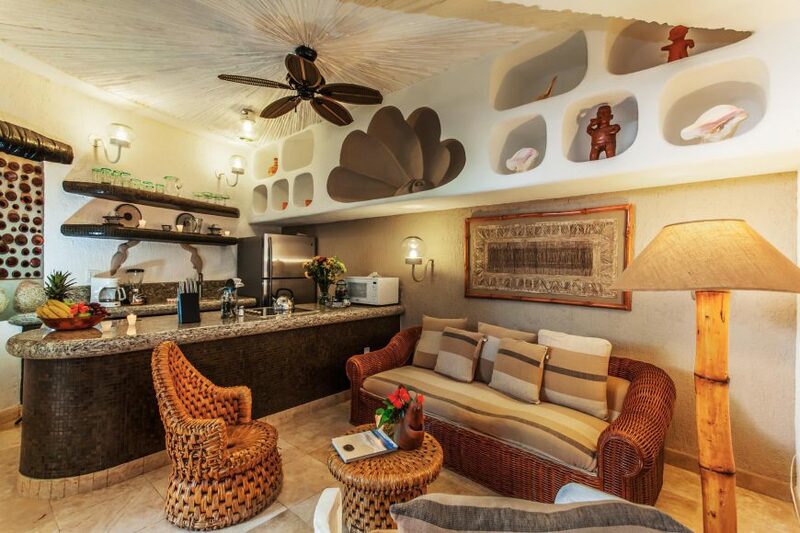 One story unit with one bedroom. 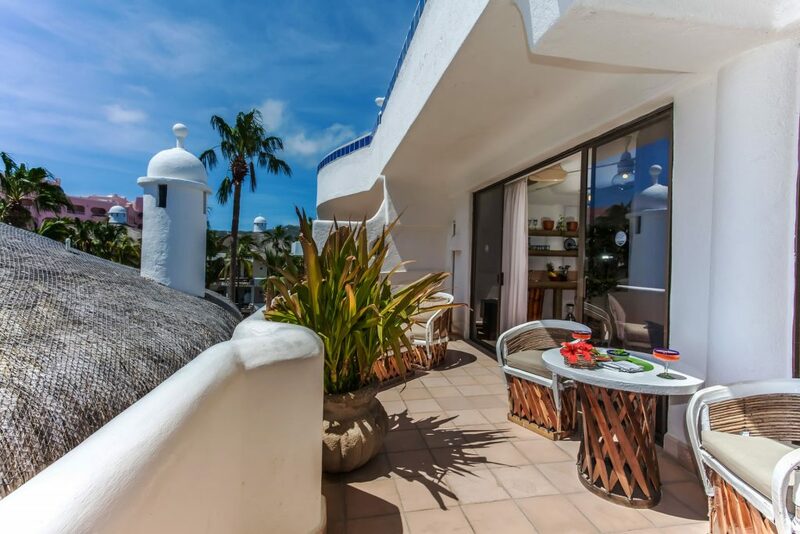 2nd or 3rd-floor villas with elevator access in Las Palmas building. 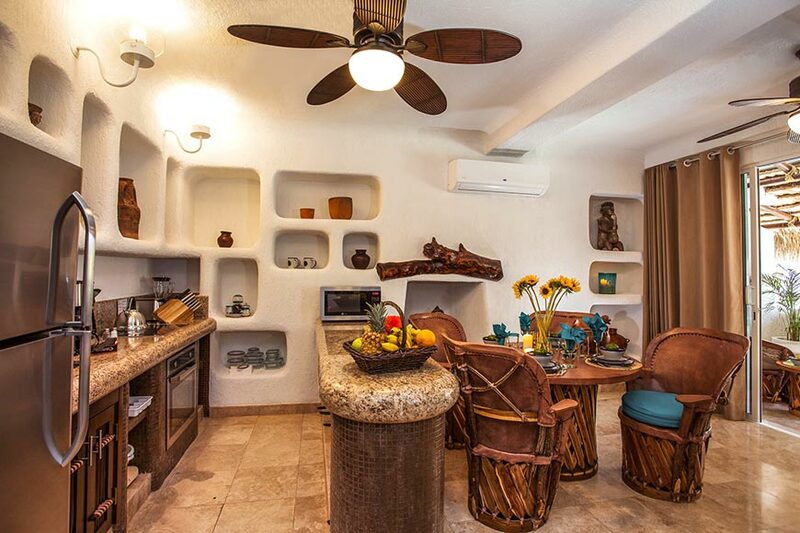 One story unit with two bedrooms and one bathroom. 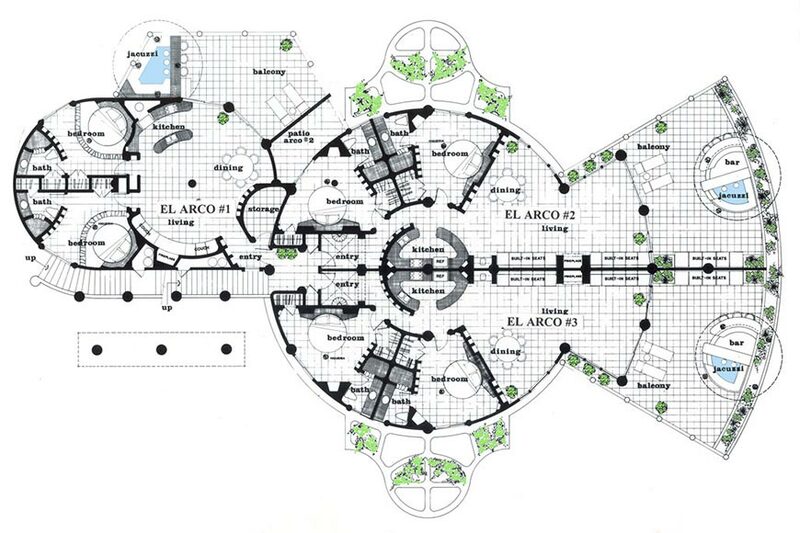 2nd or 3rd-floor villas with elevator access in the Las Palmas building. Interior garden or sunset view. 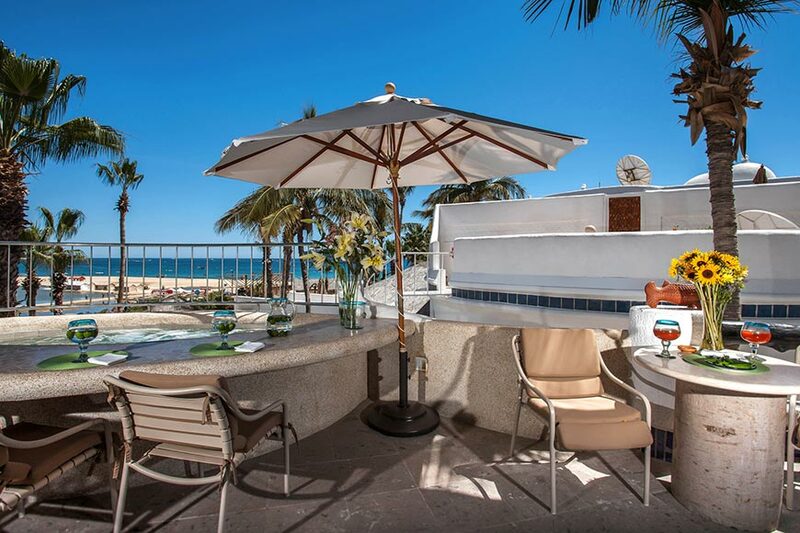 Luxurious oceanfront two-story unit with four bedrooms and five bathrooms, two living and dining areas and two private pools. 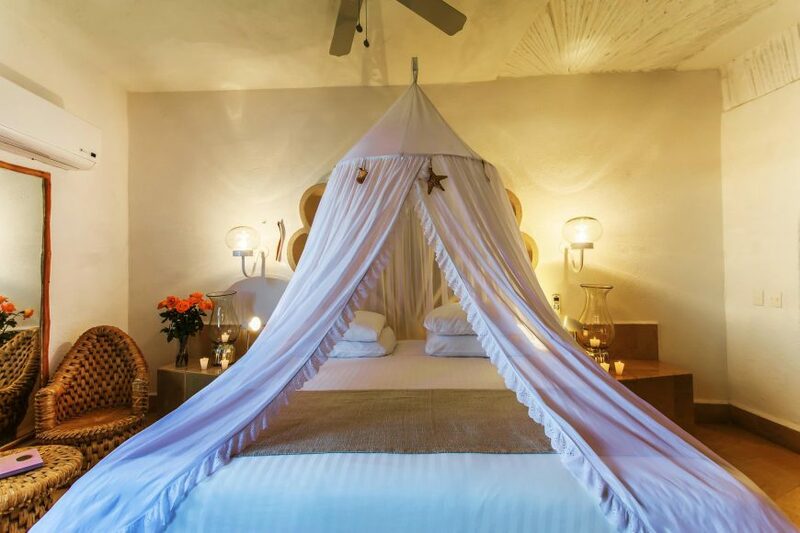 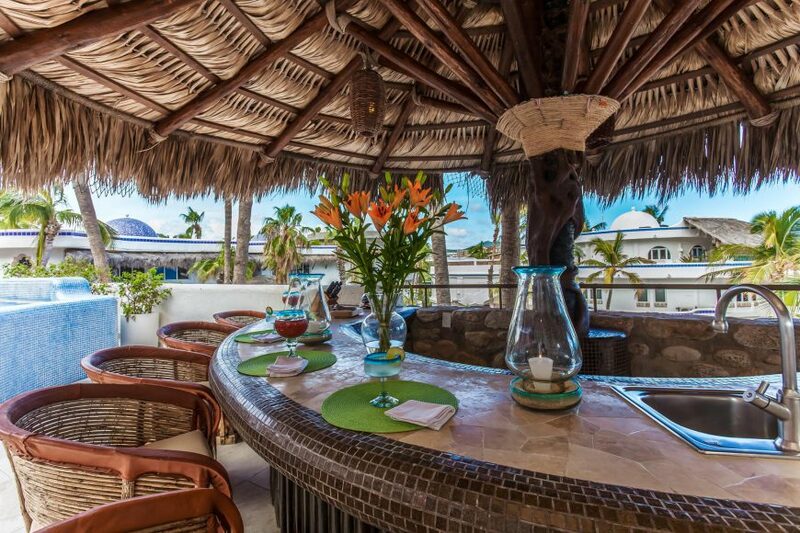 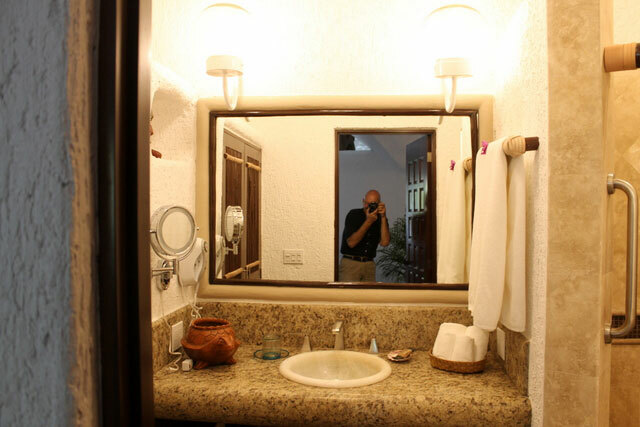 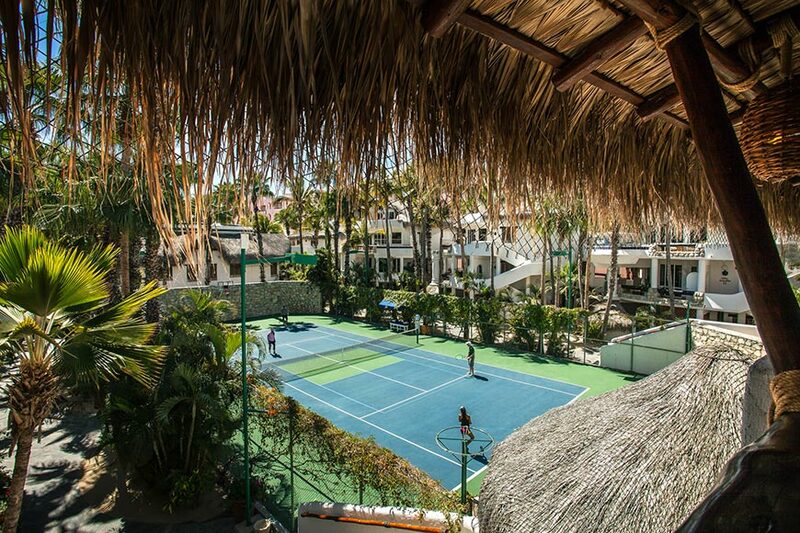 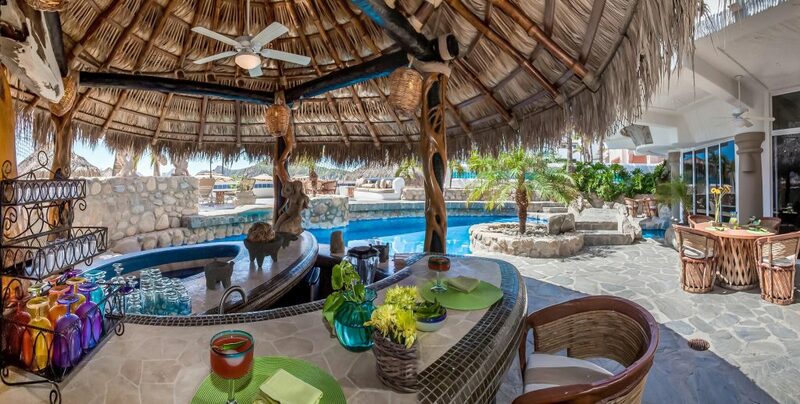 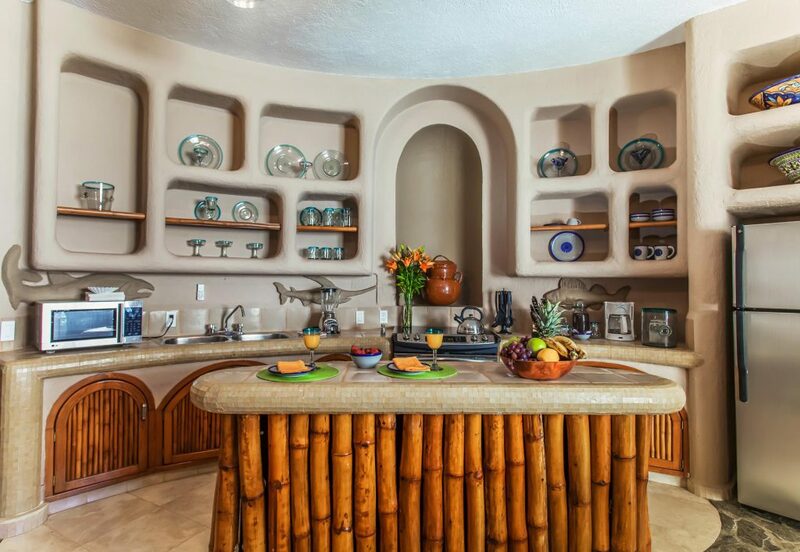 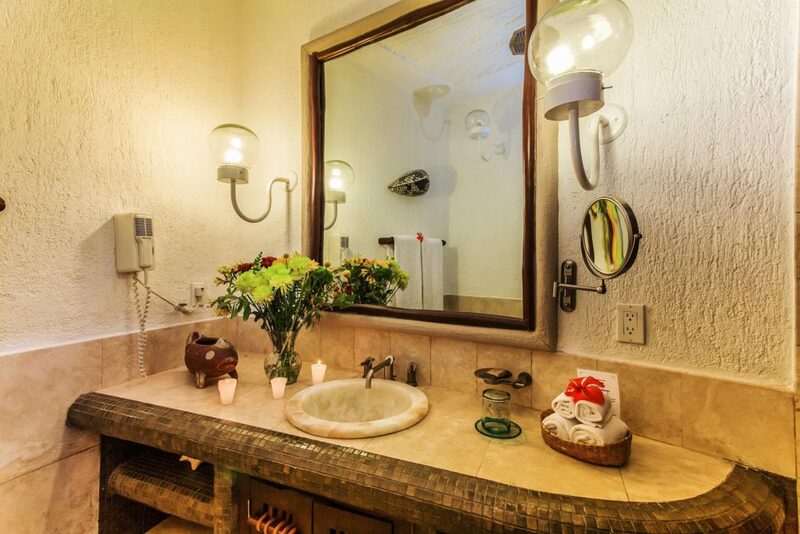 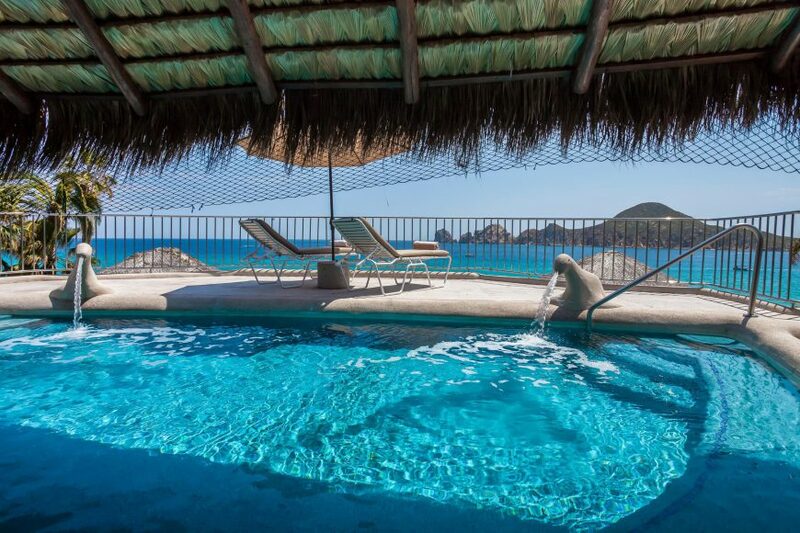 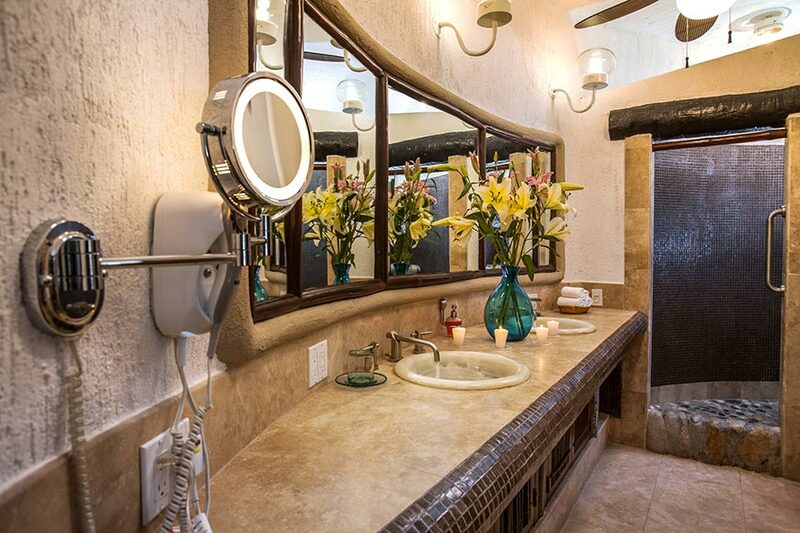 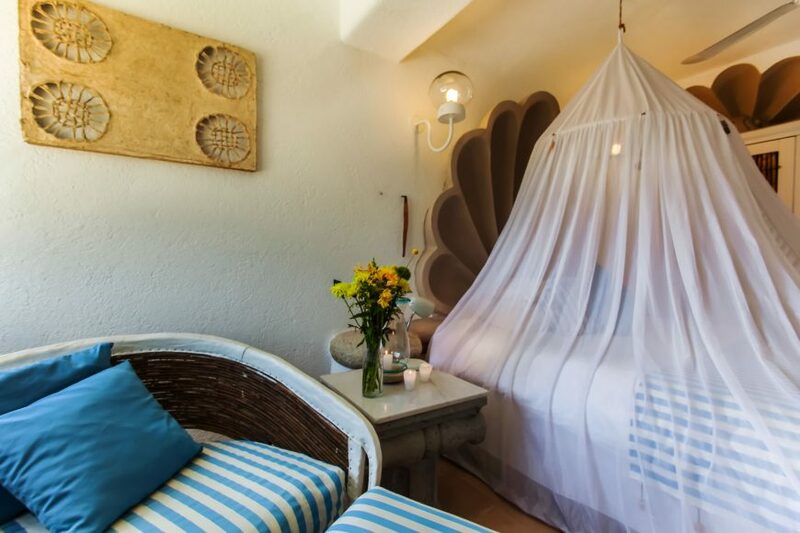 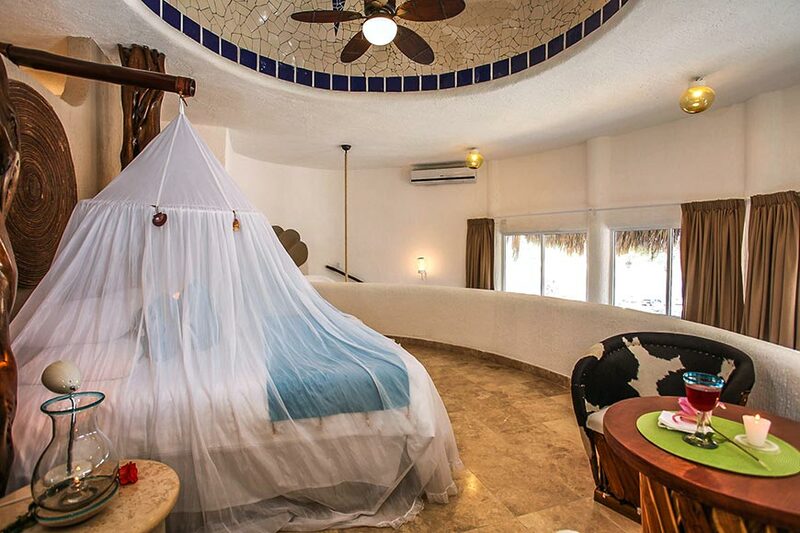 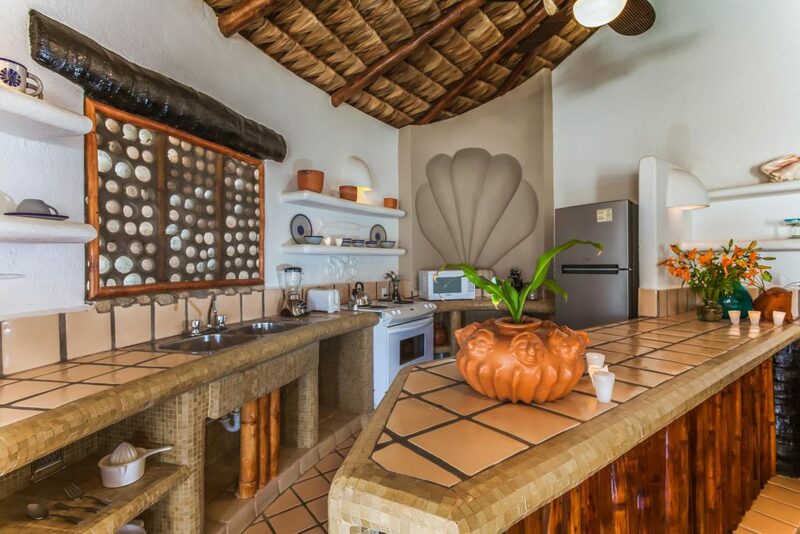 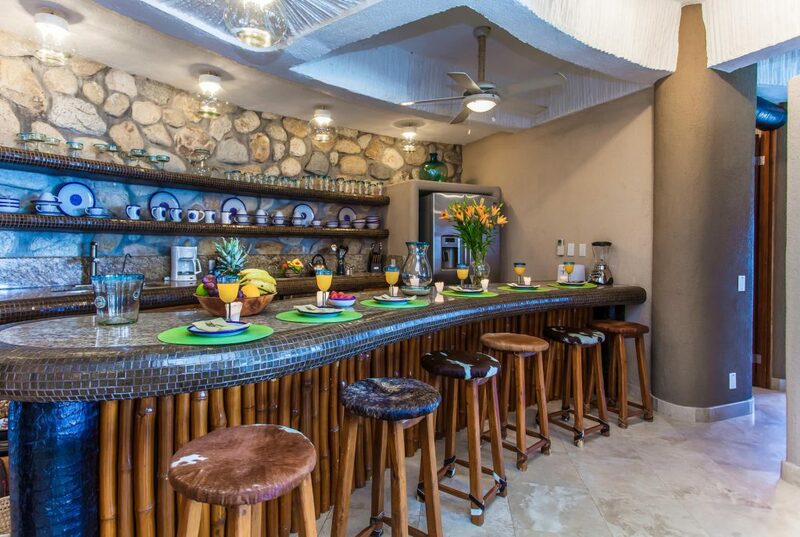 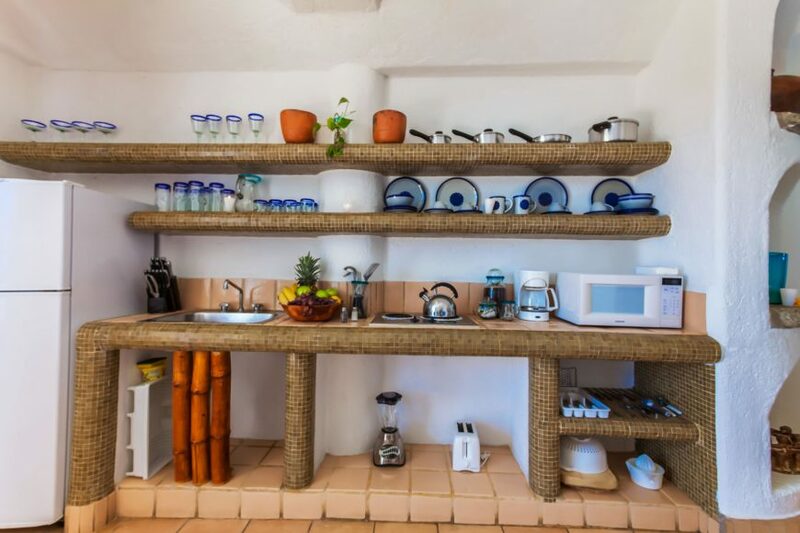 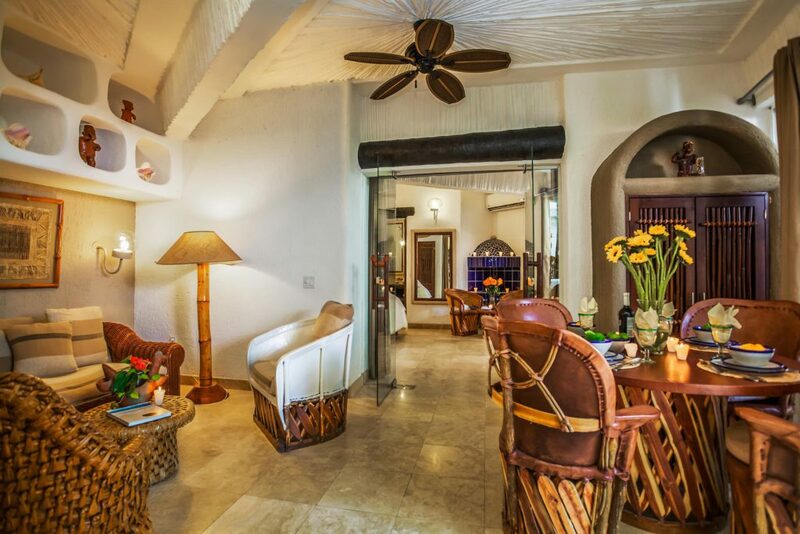 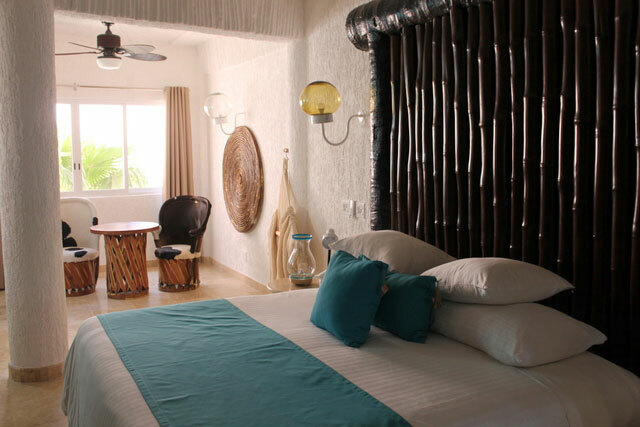 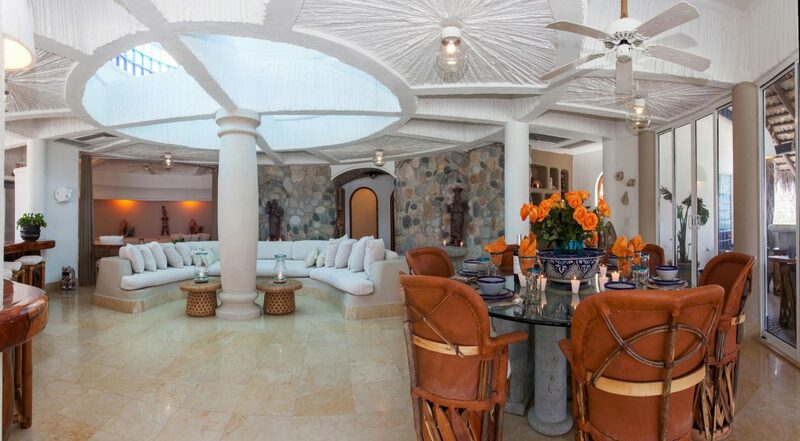 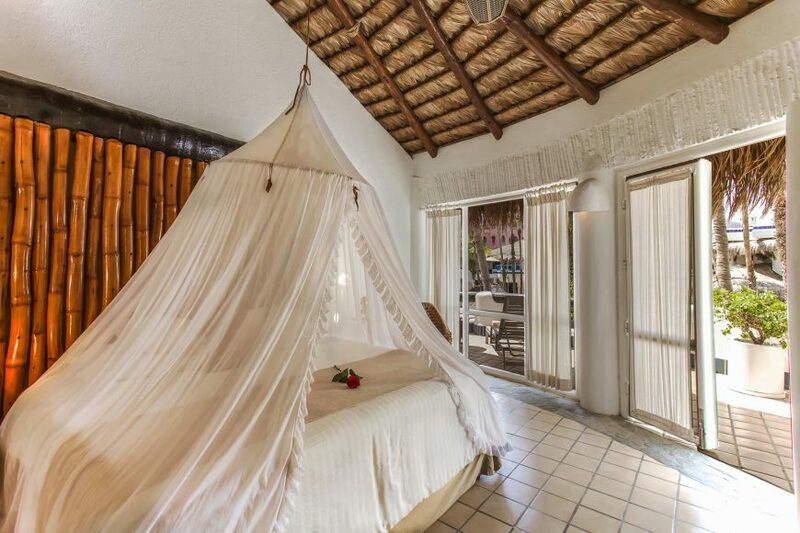 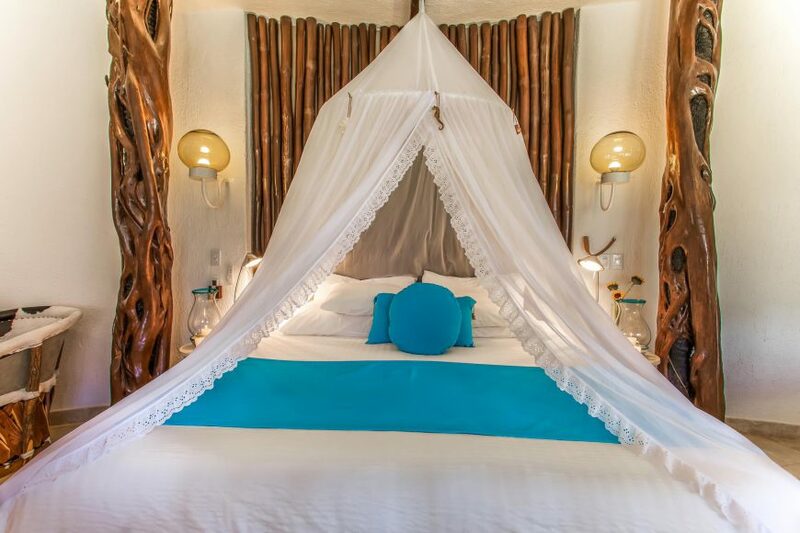 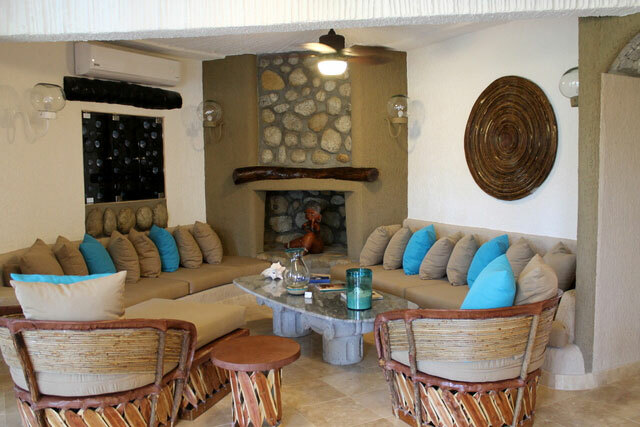 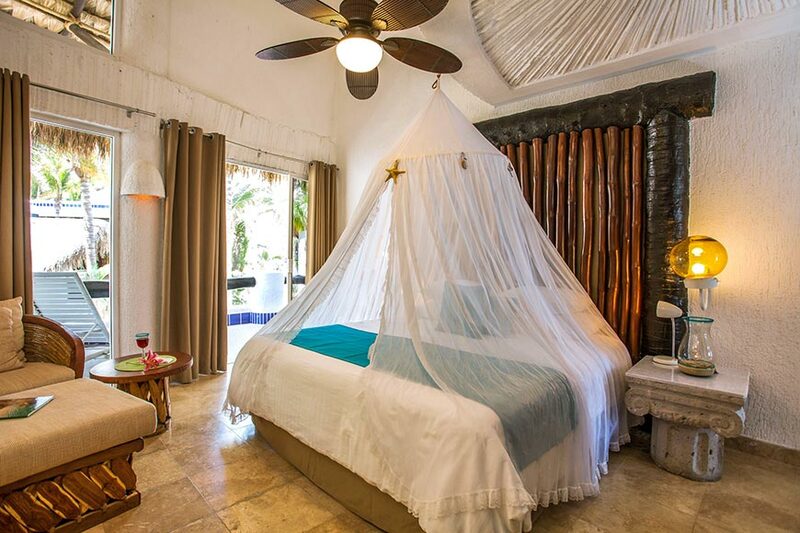 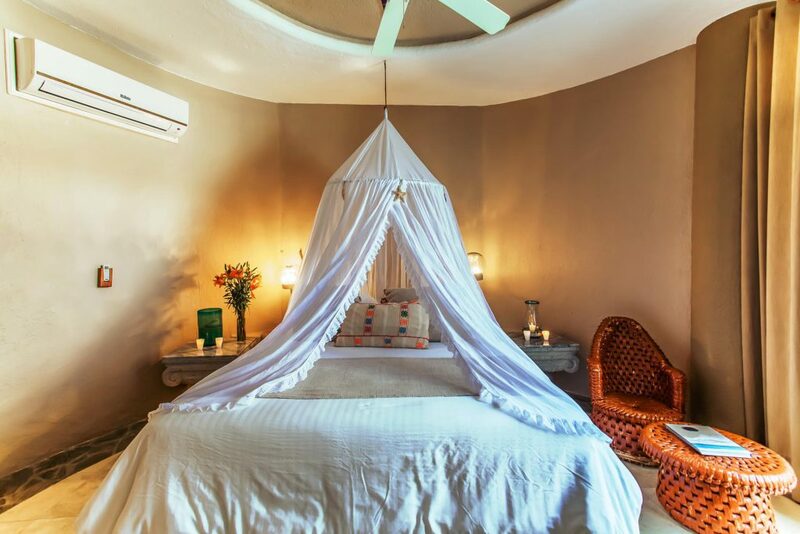 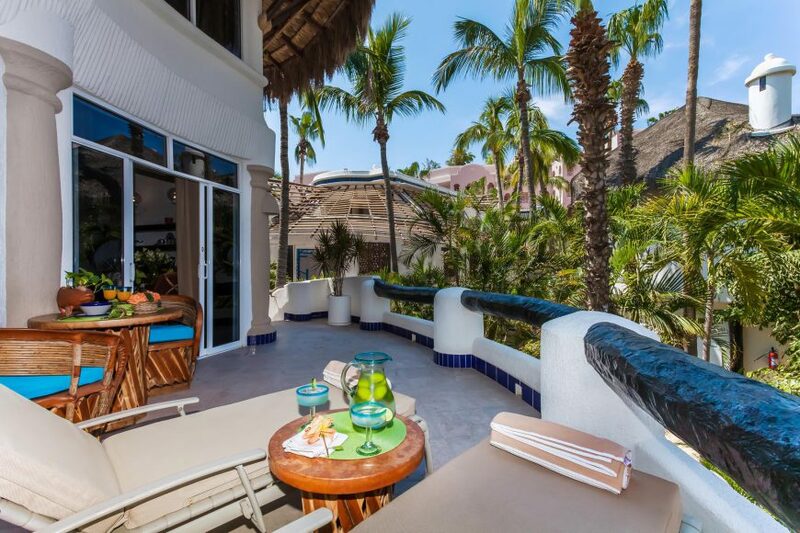 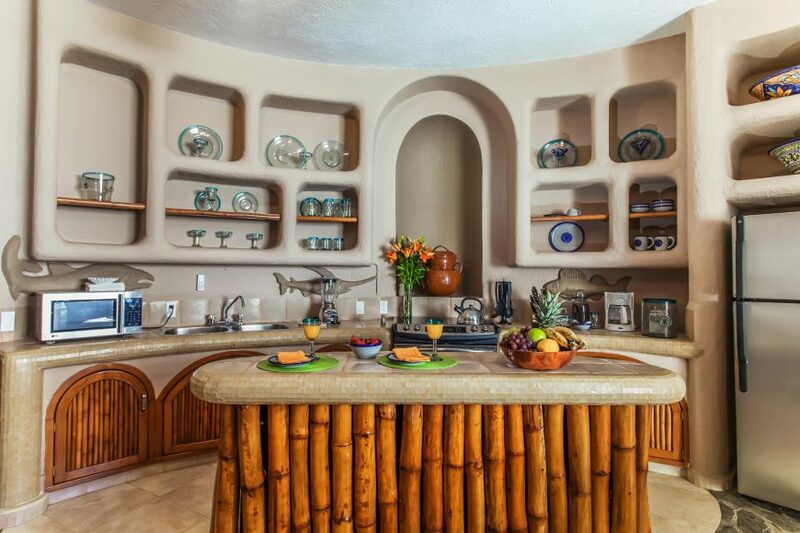 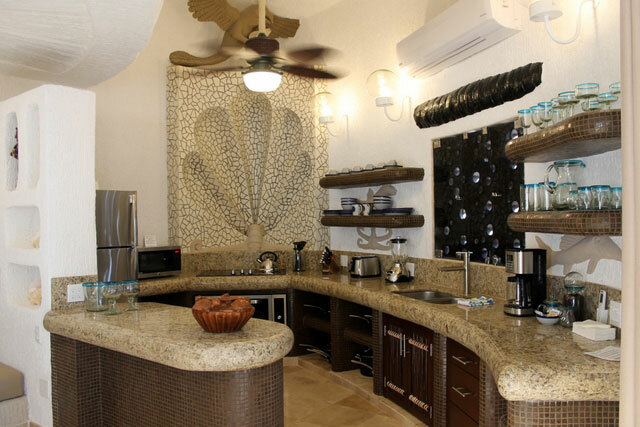 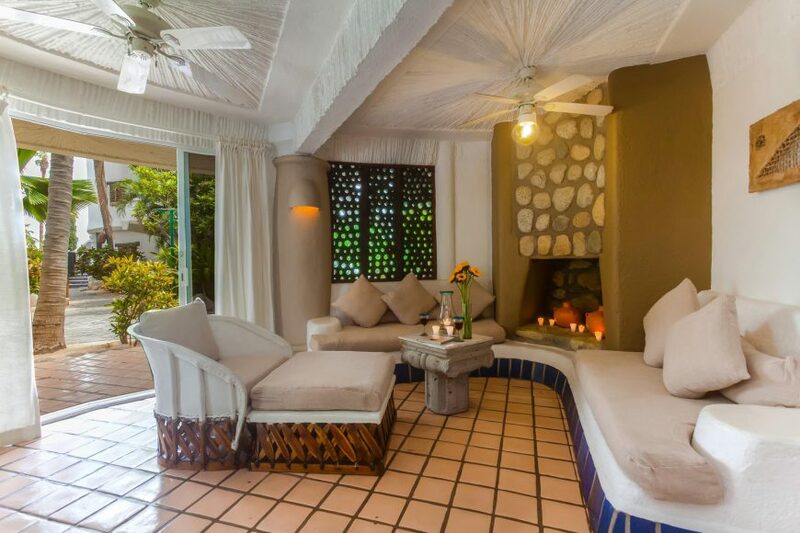 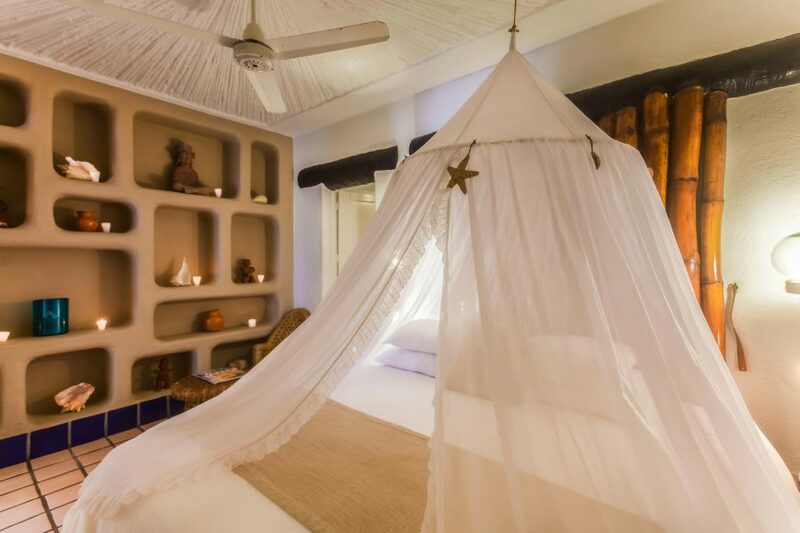 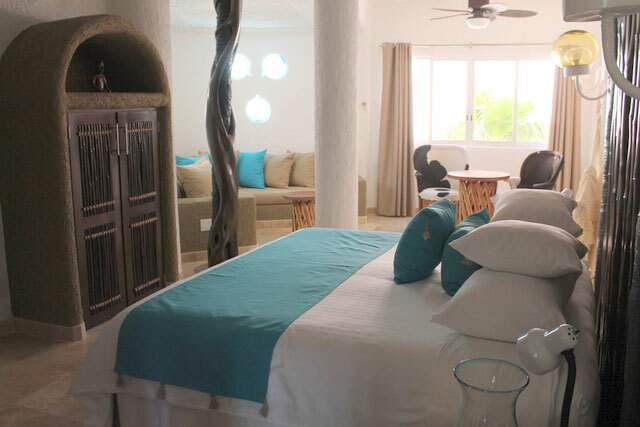 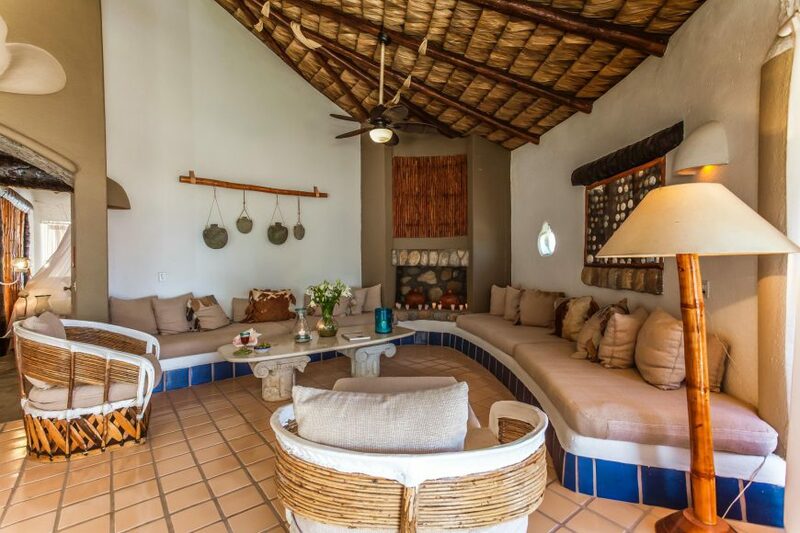 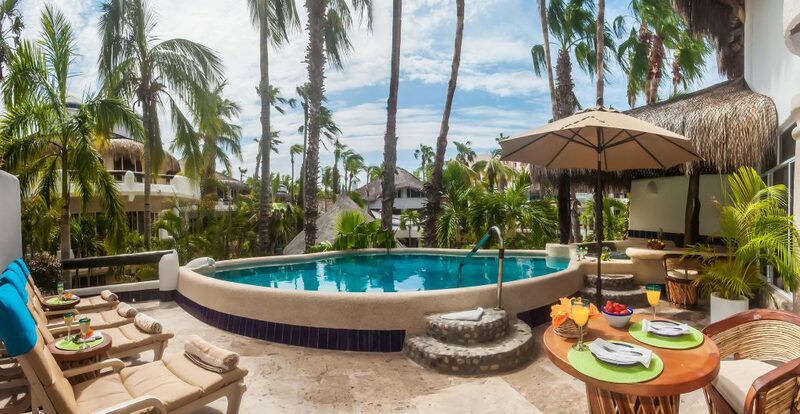 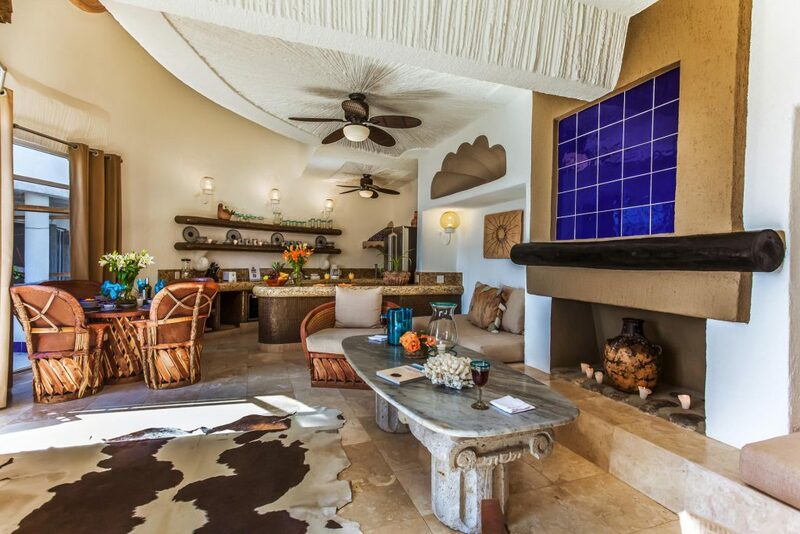 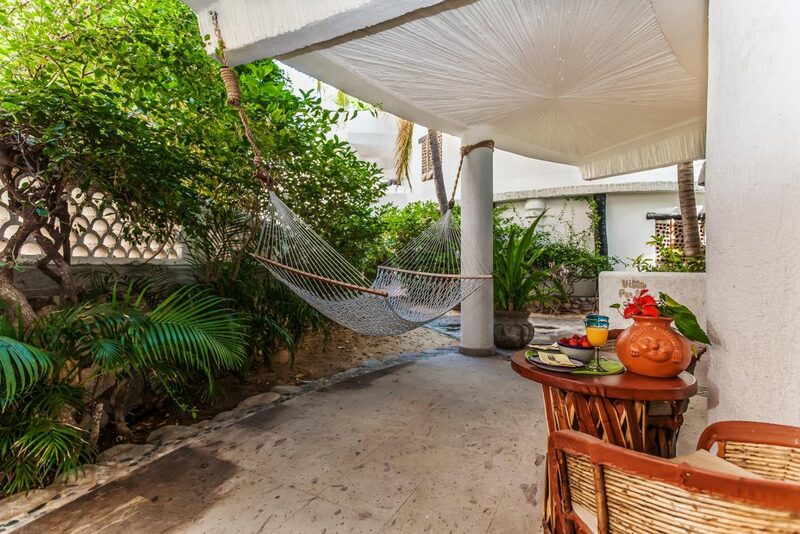 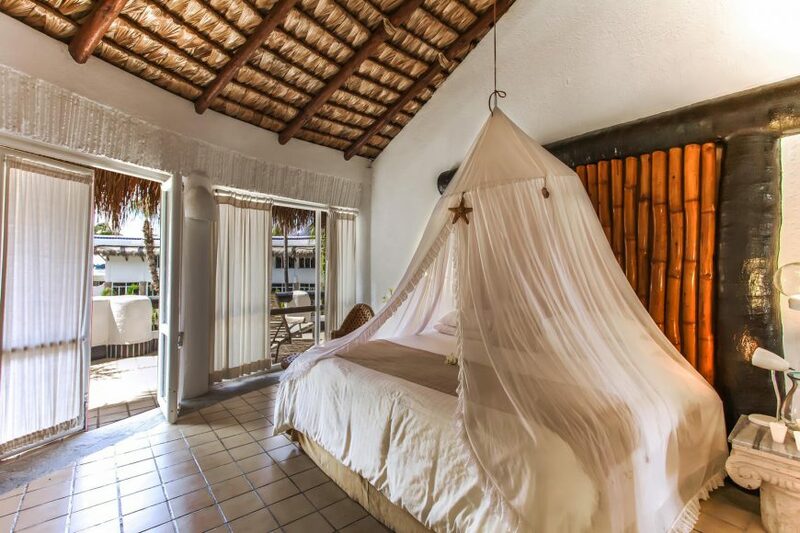 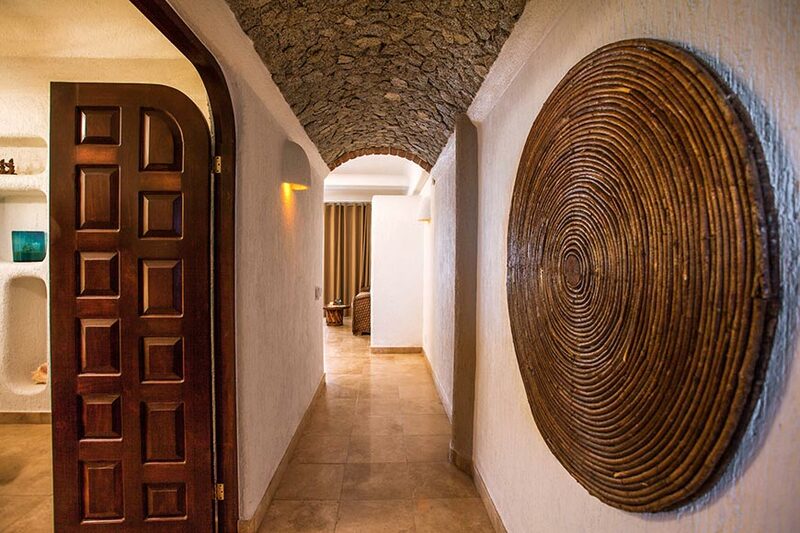 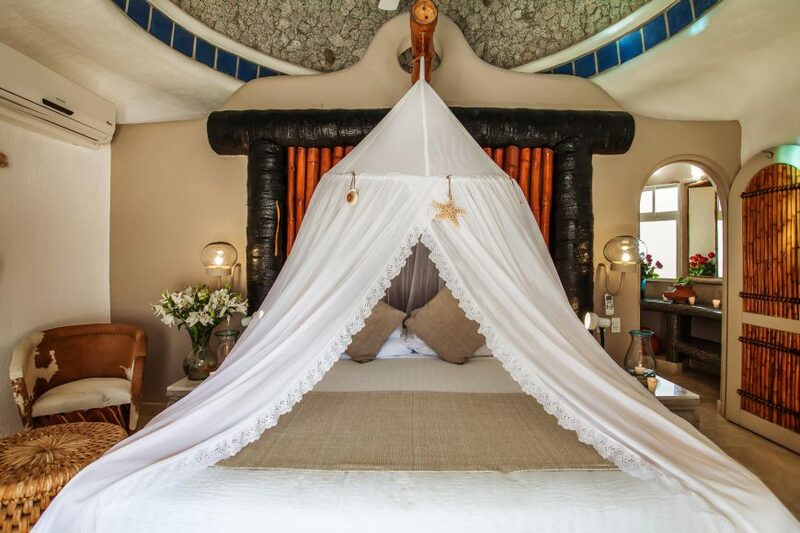 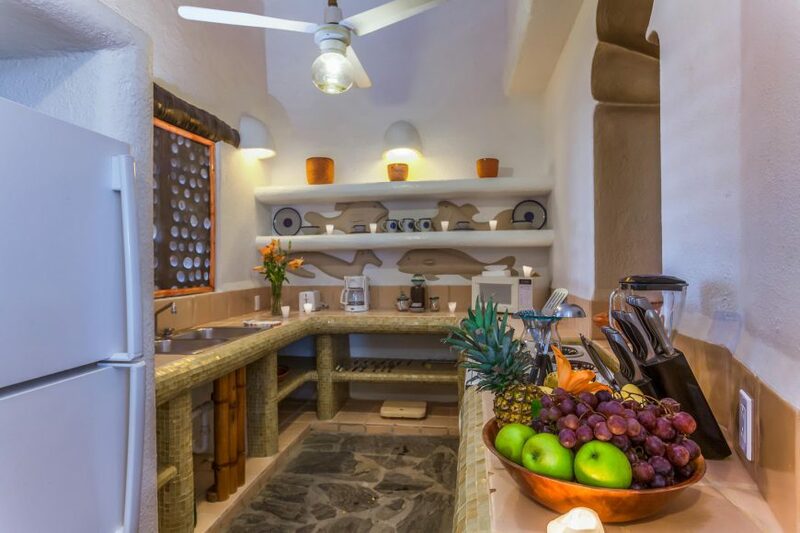 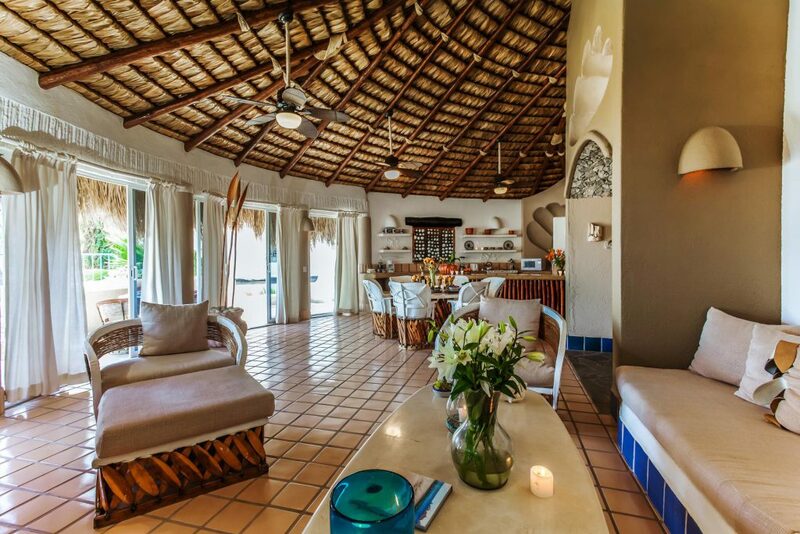 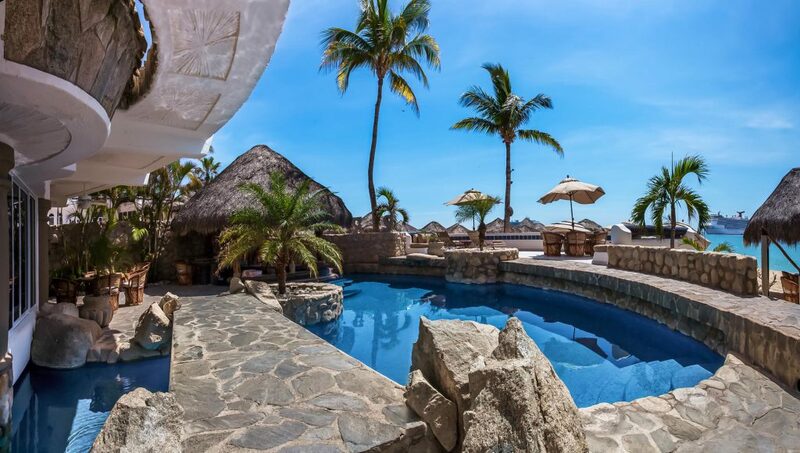 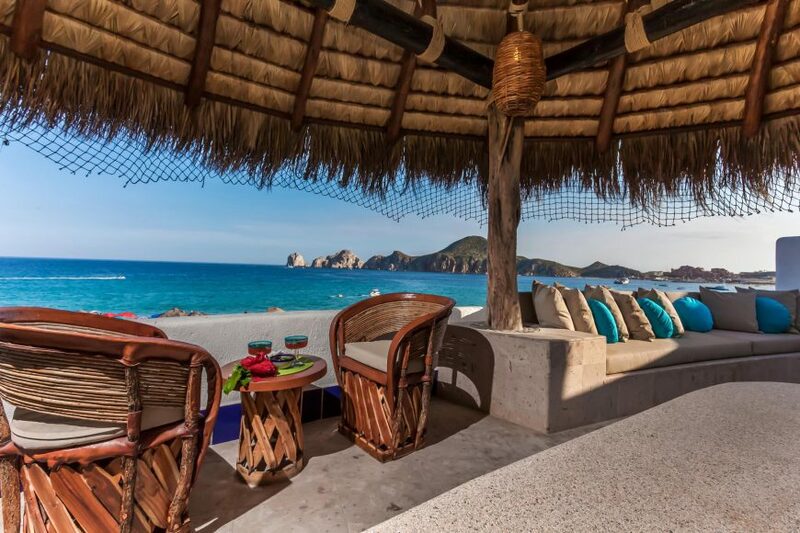 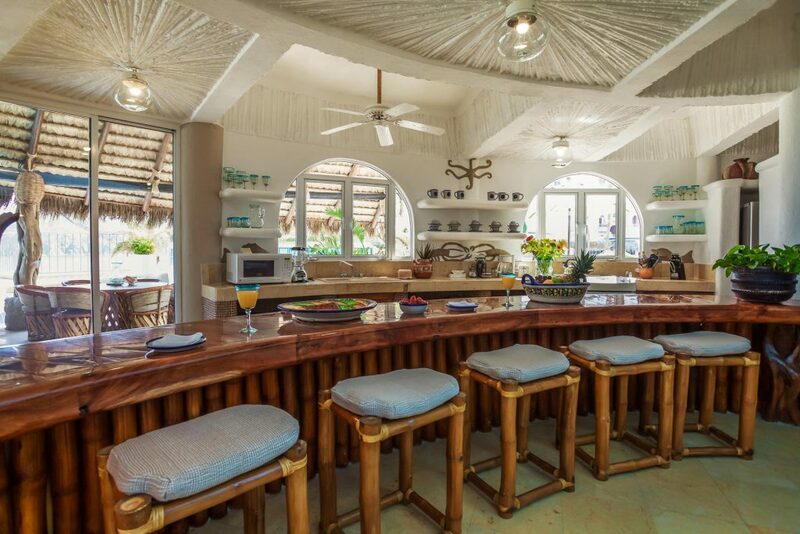 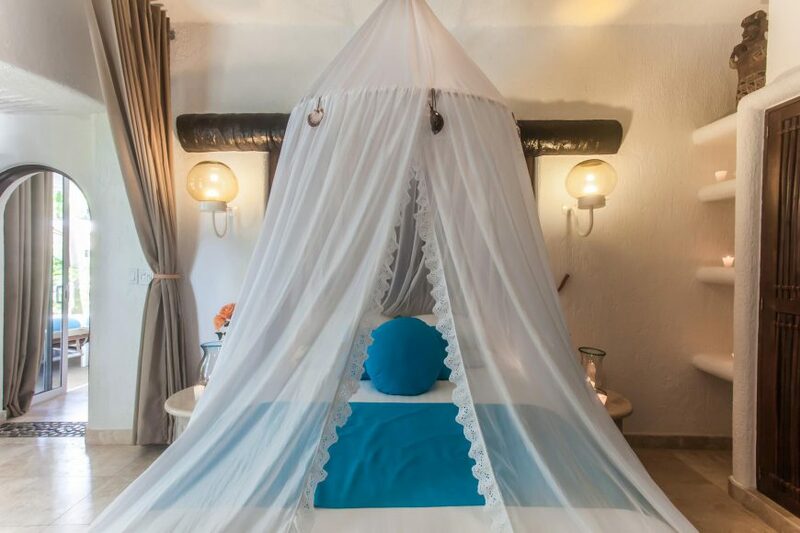 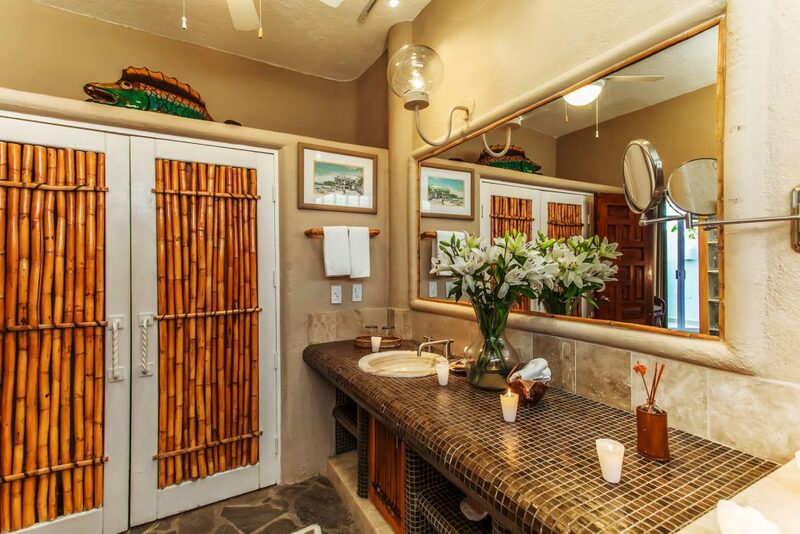 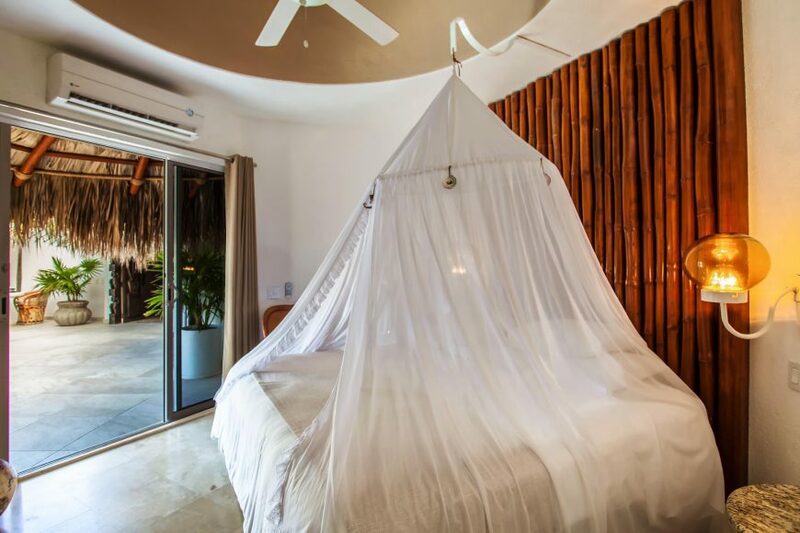 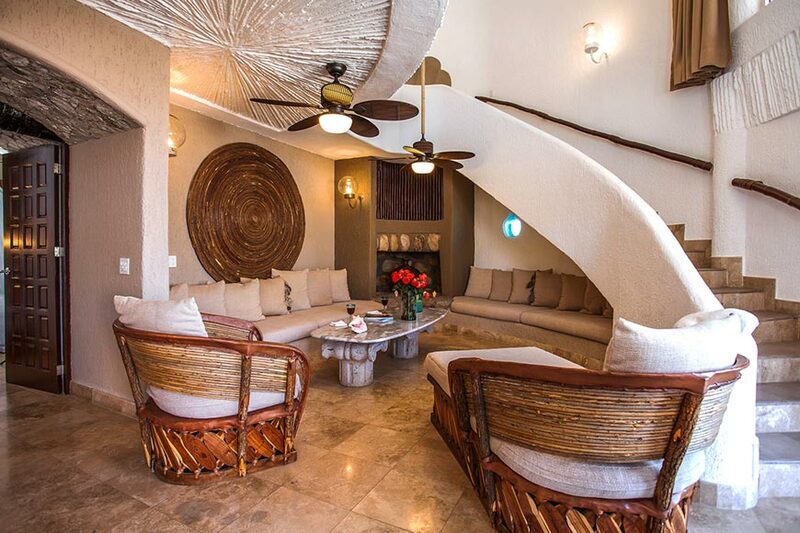 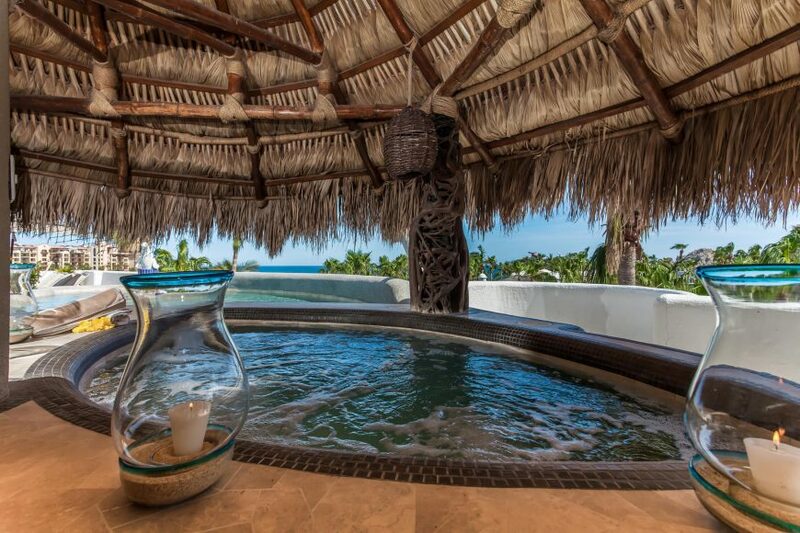 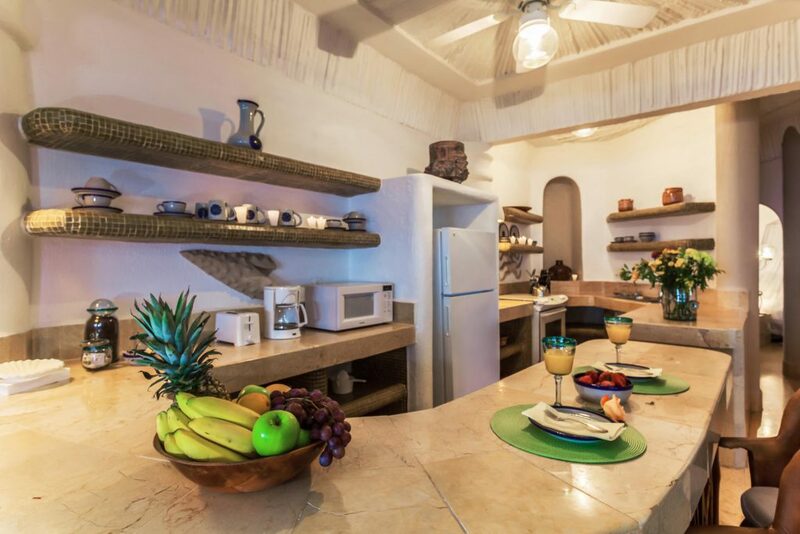 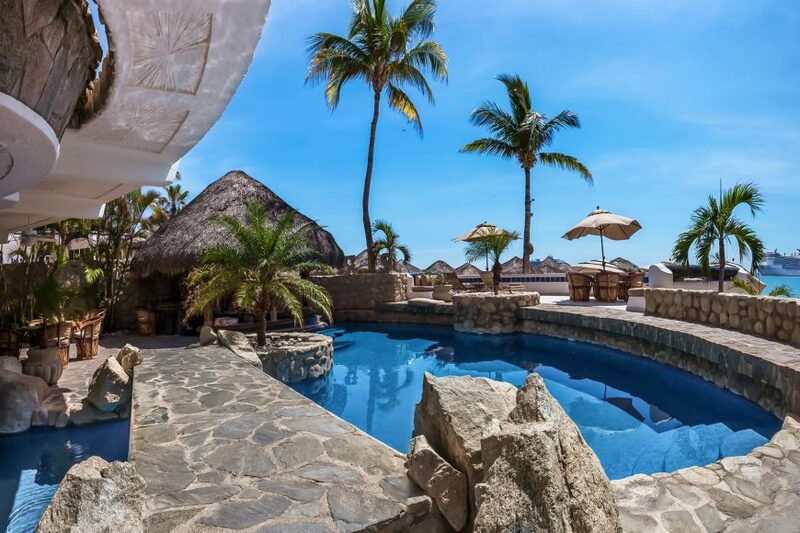 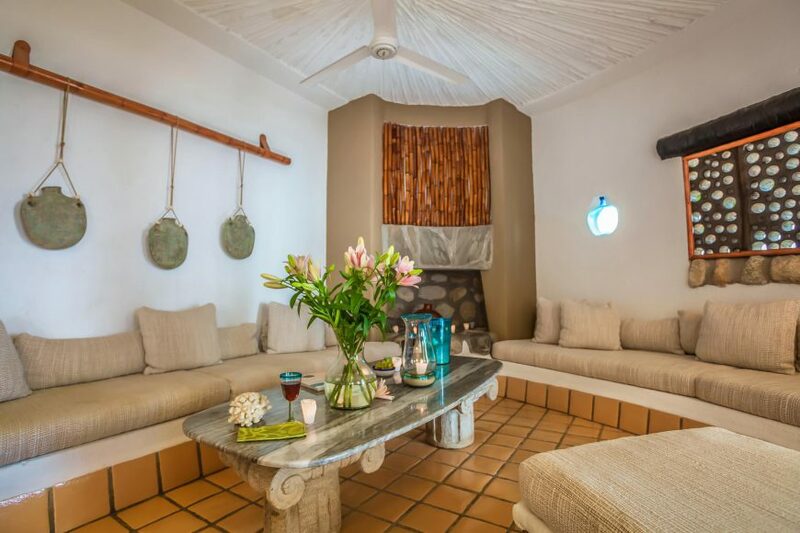 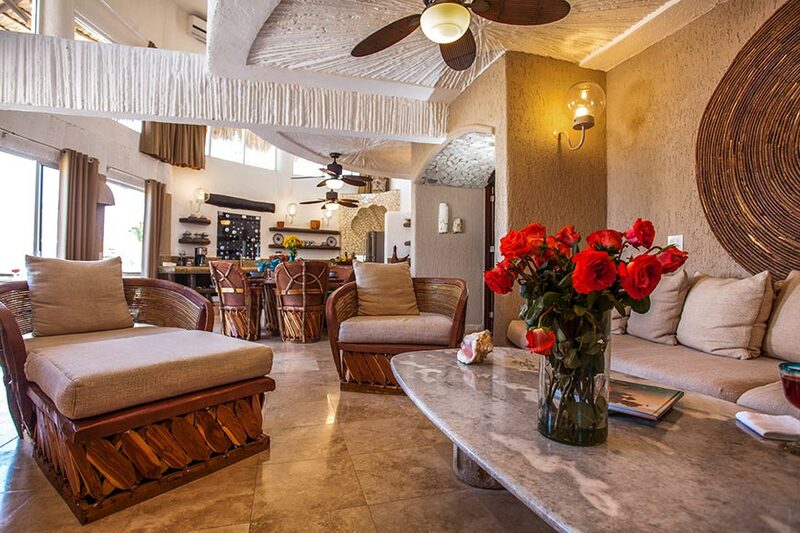 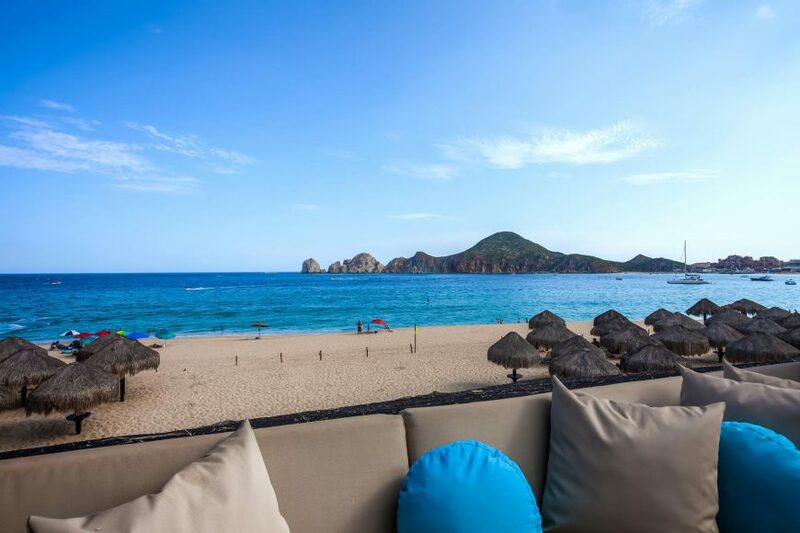 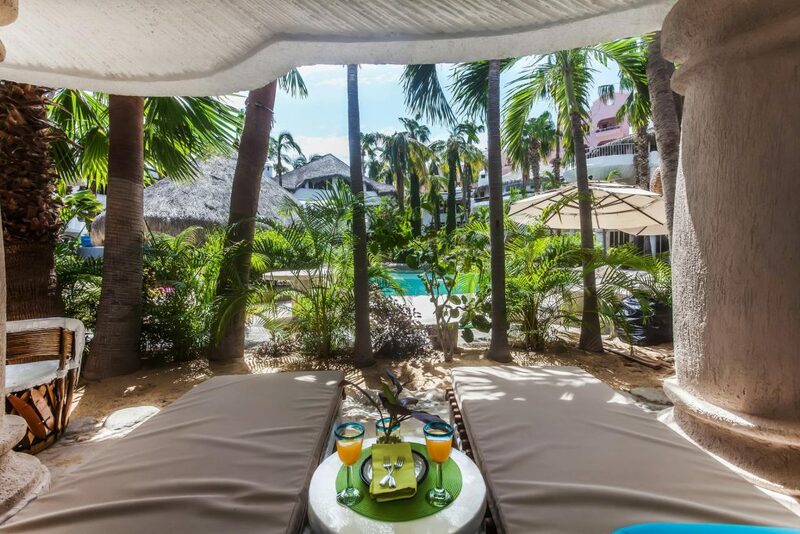 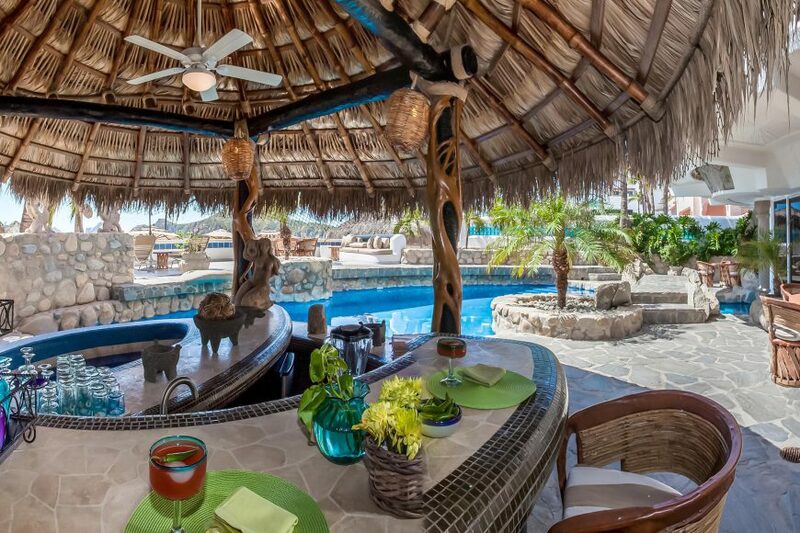 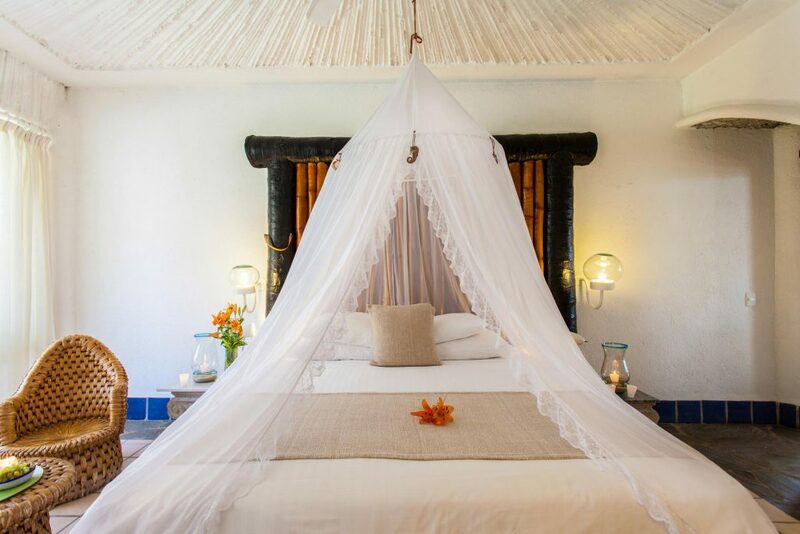 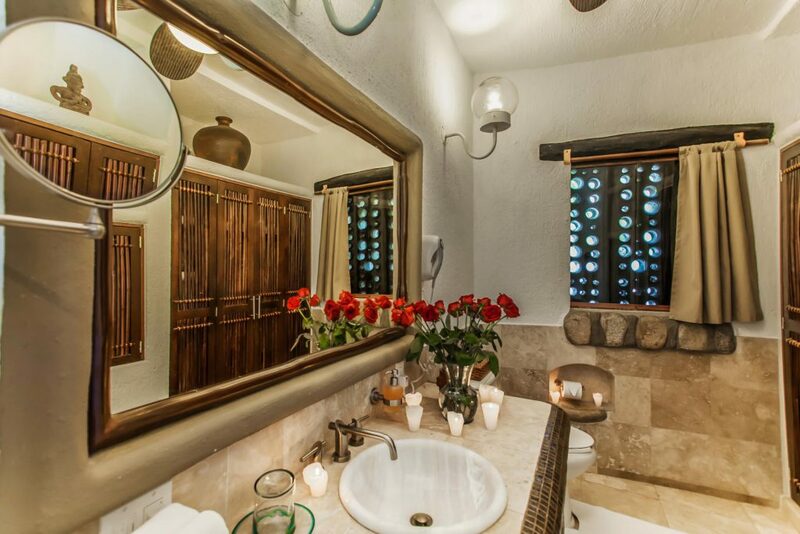 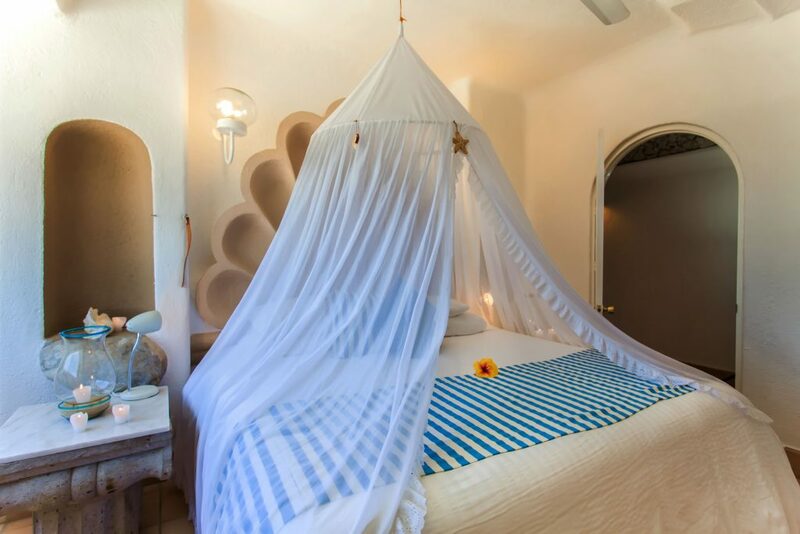 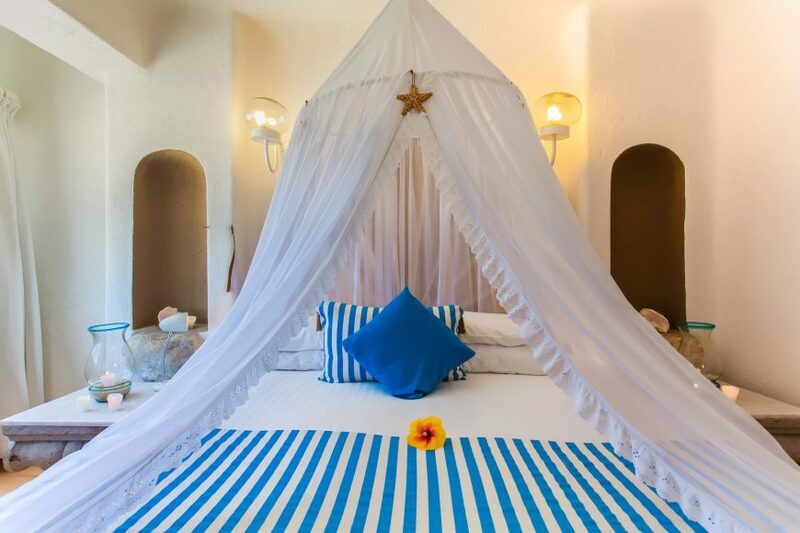 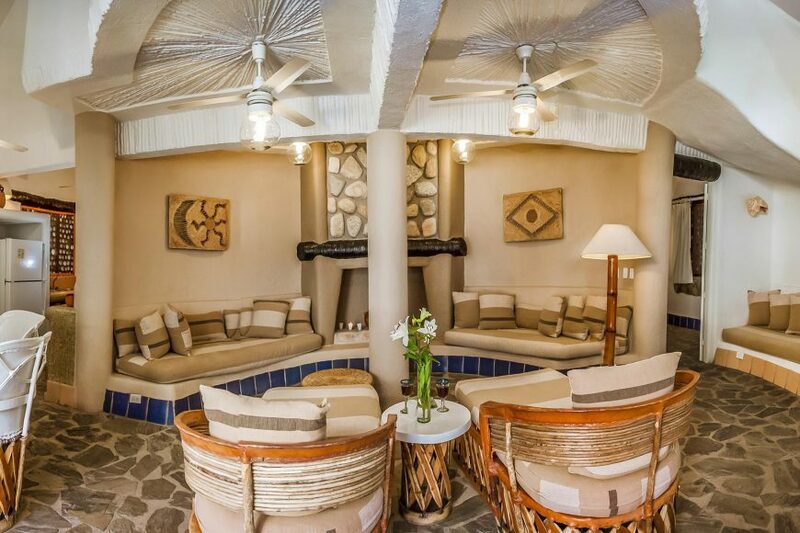 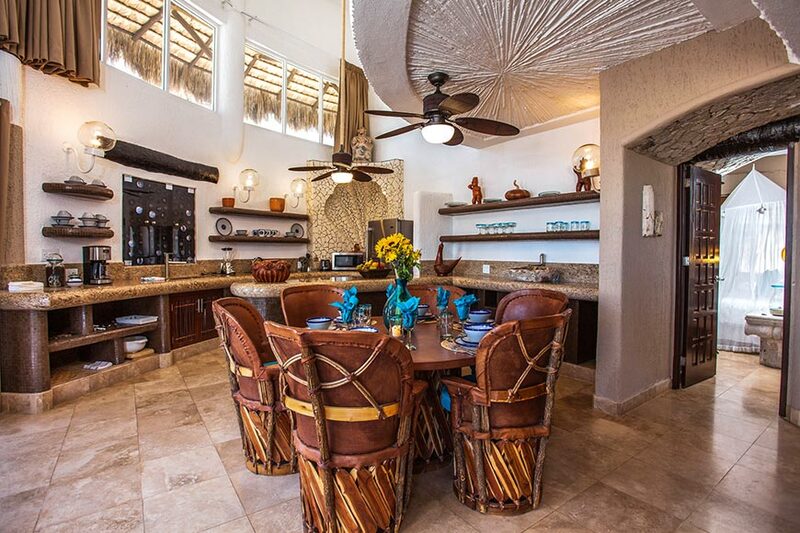 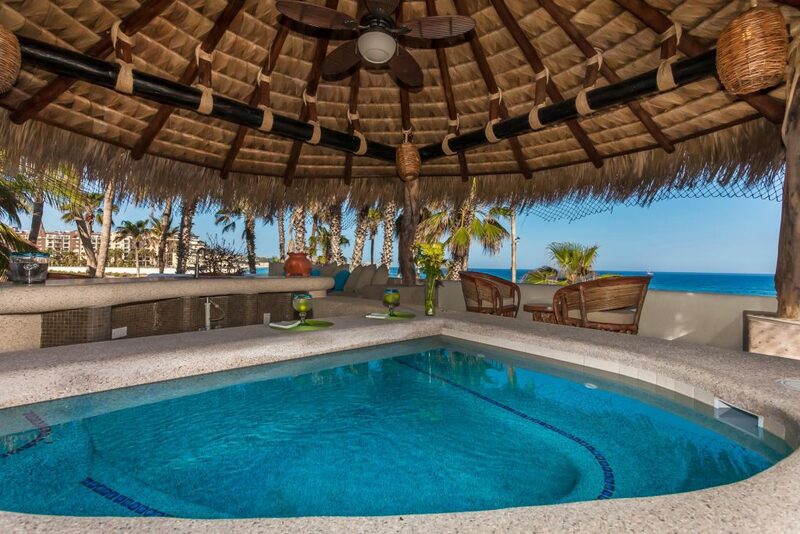 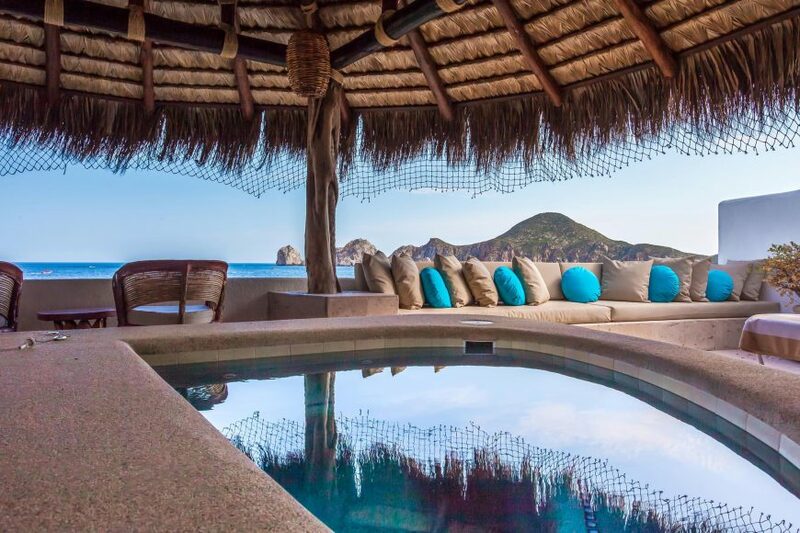 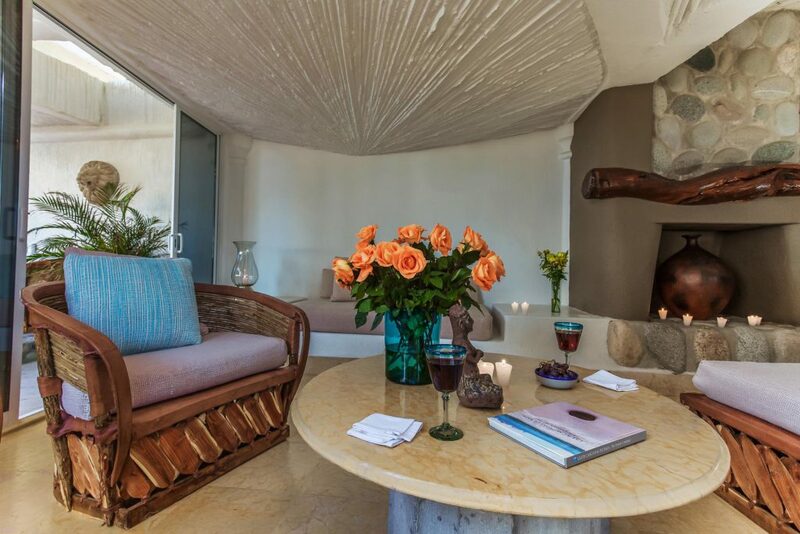 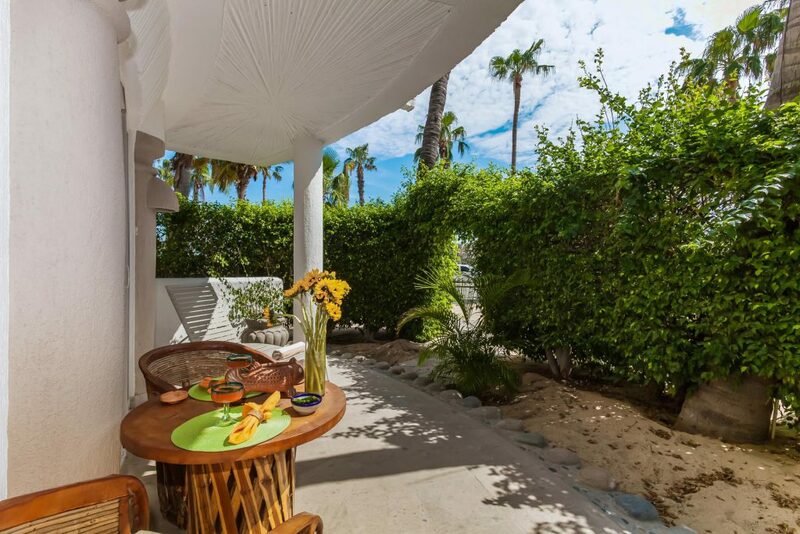 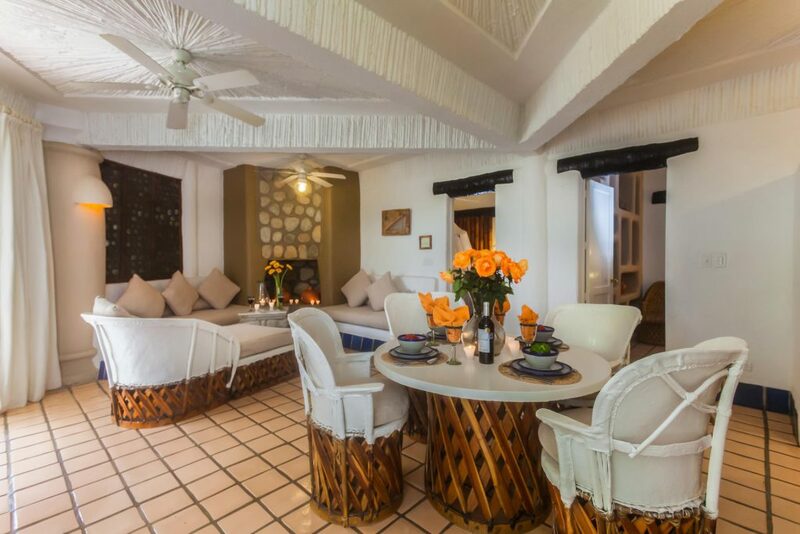 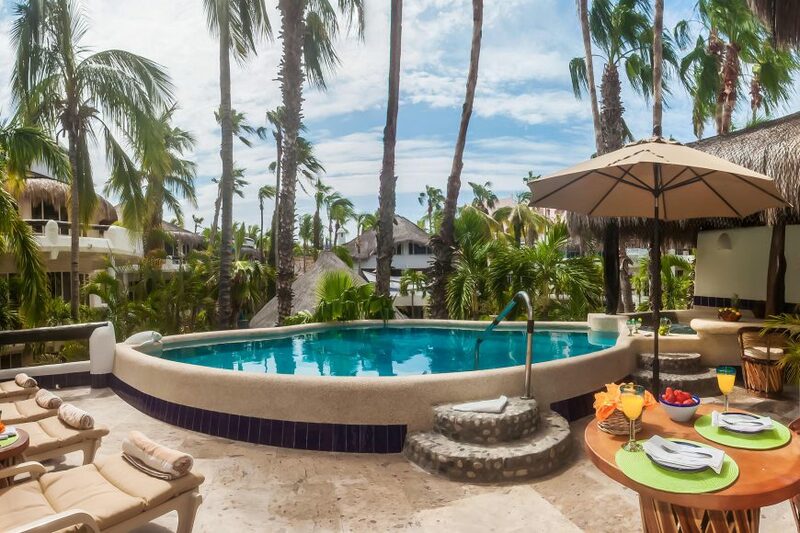 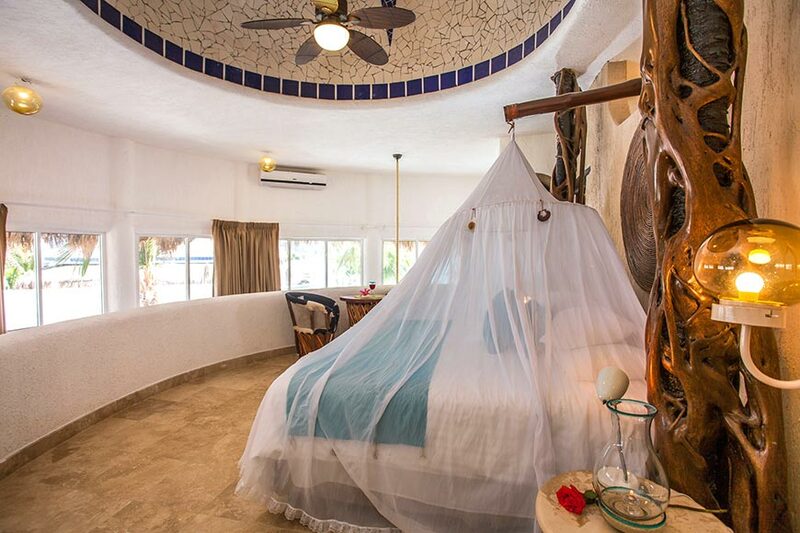 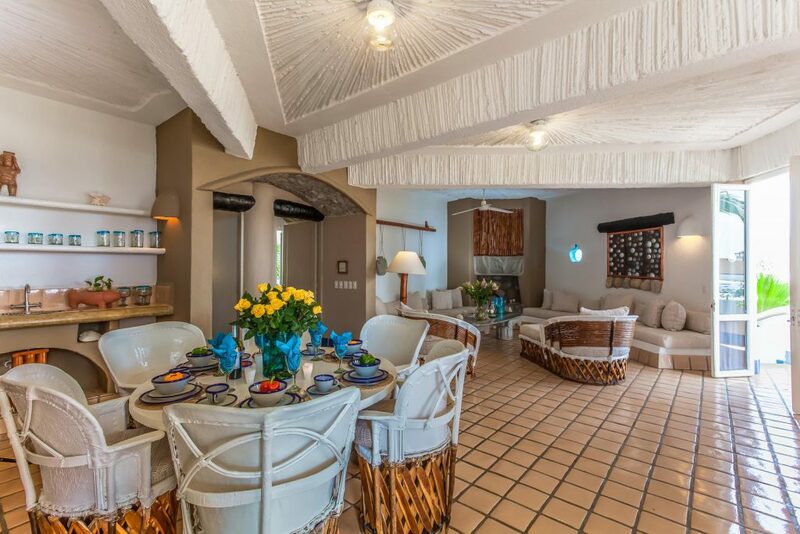 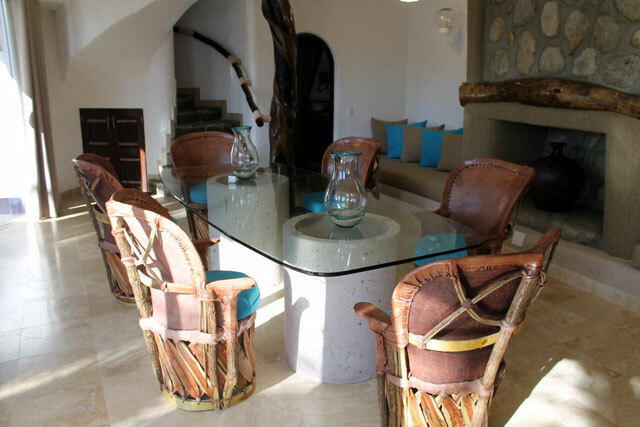 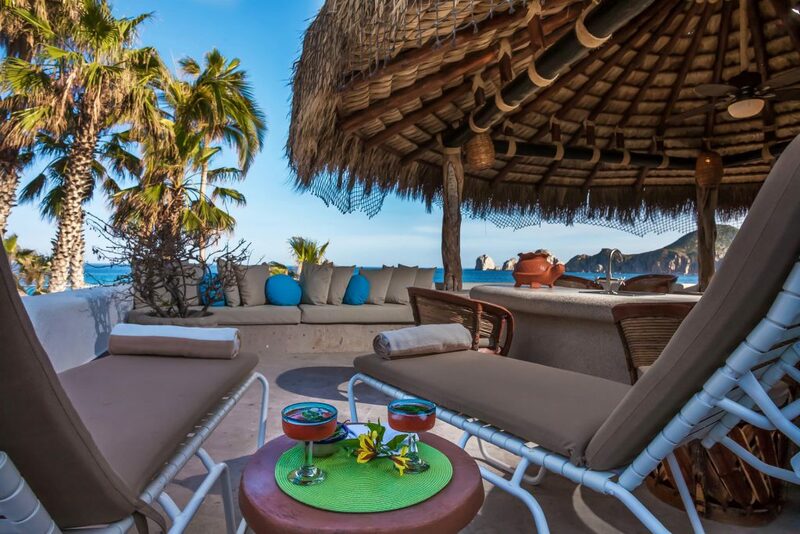 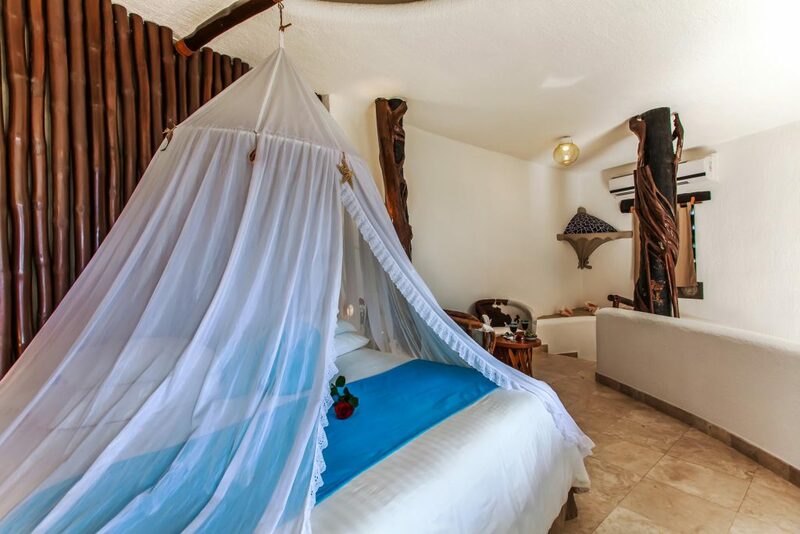 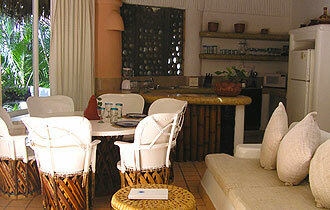 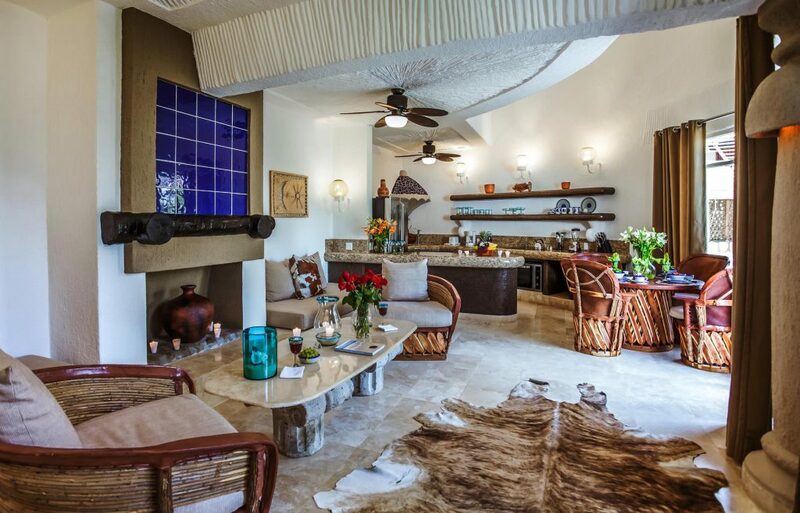 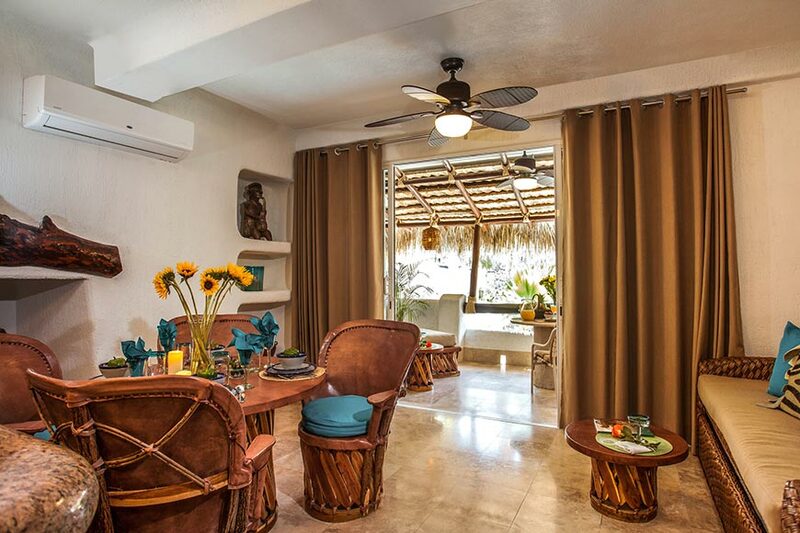 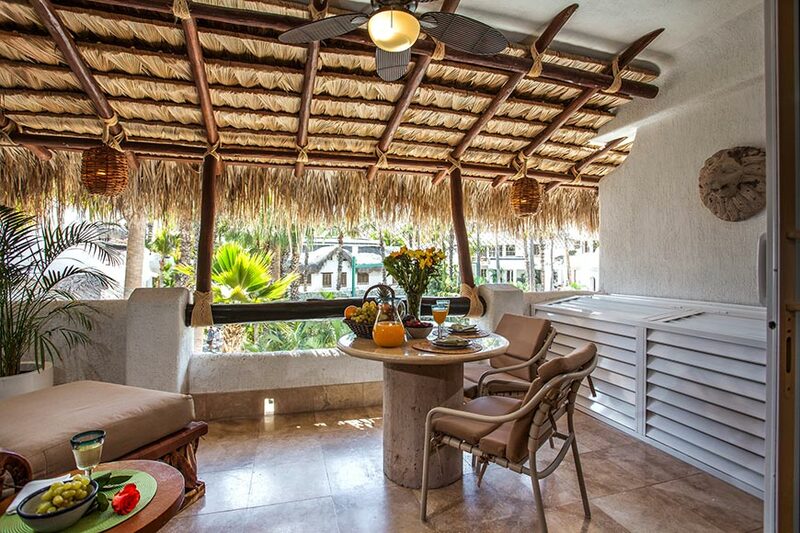 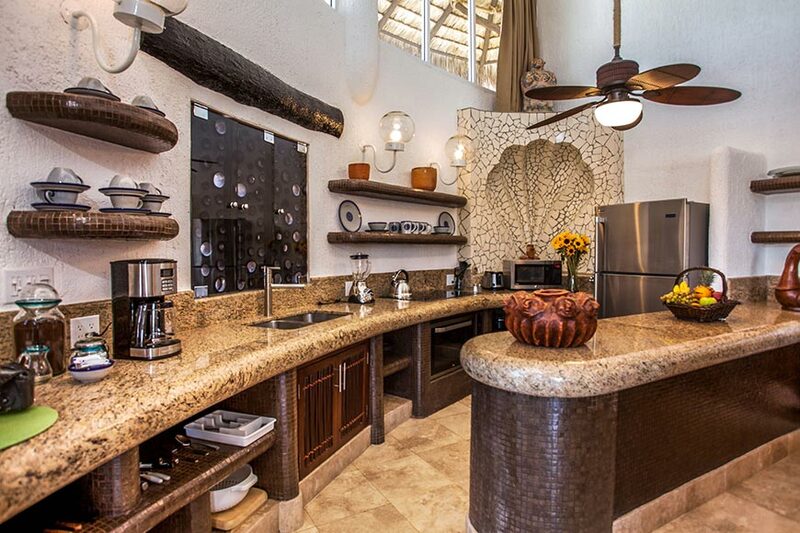 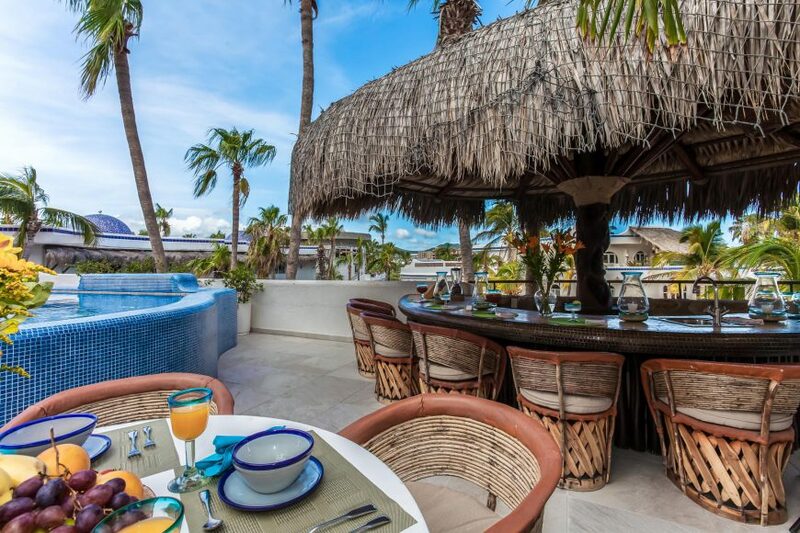 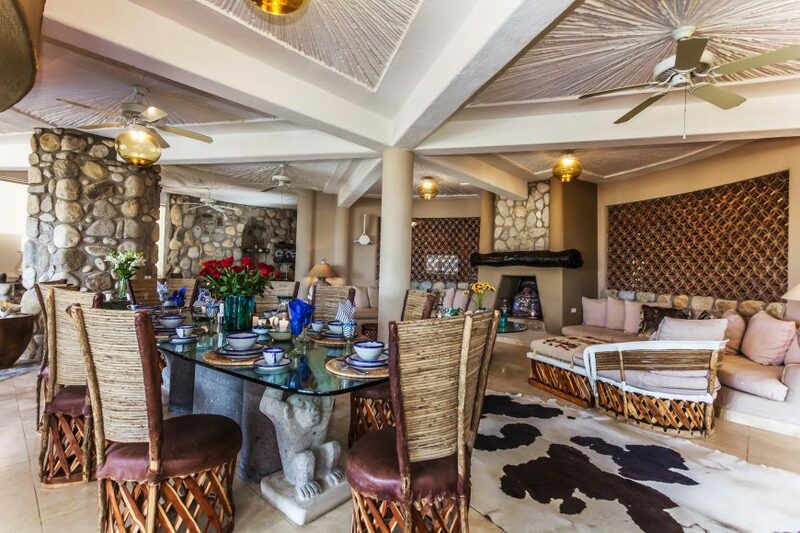 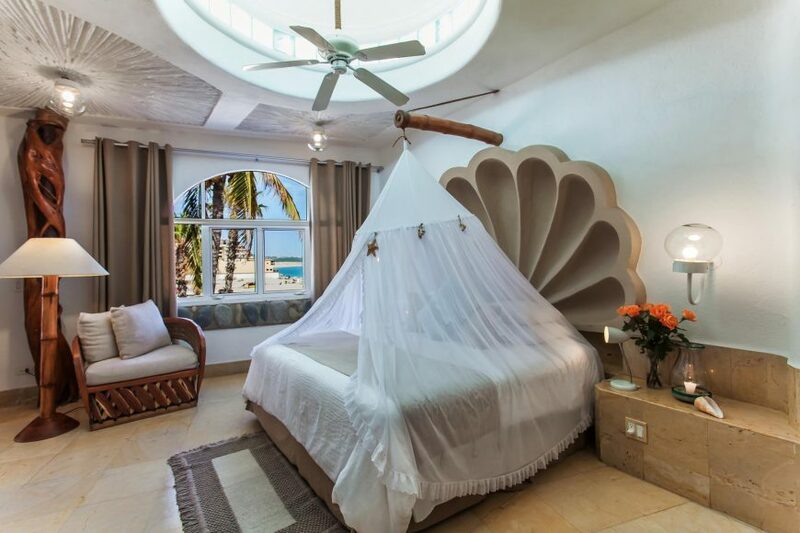 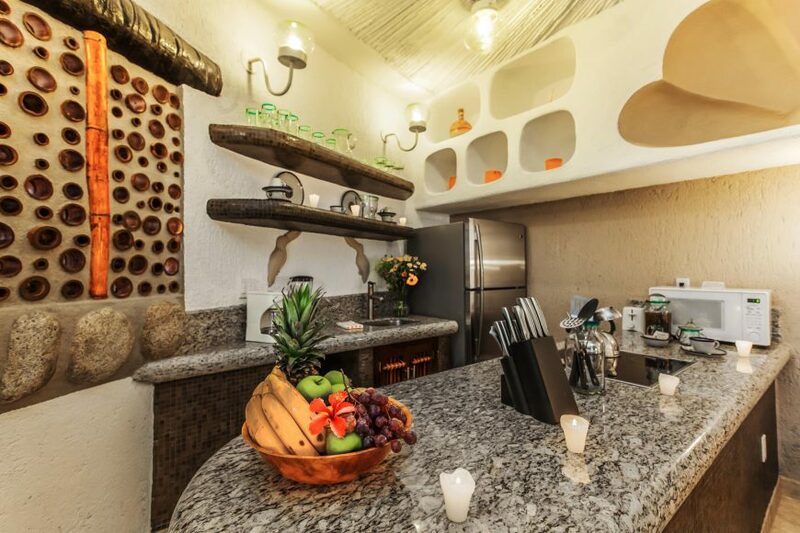 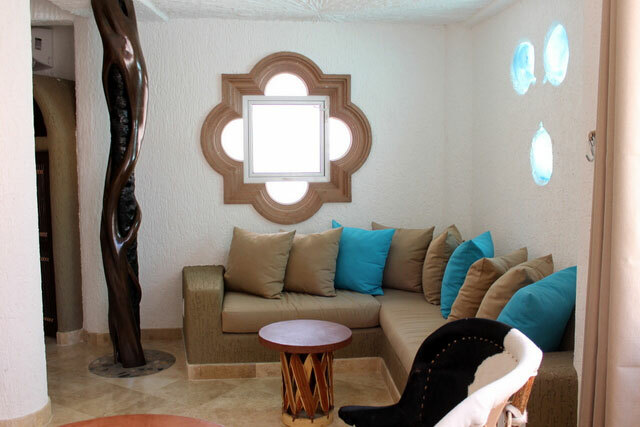 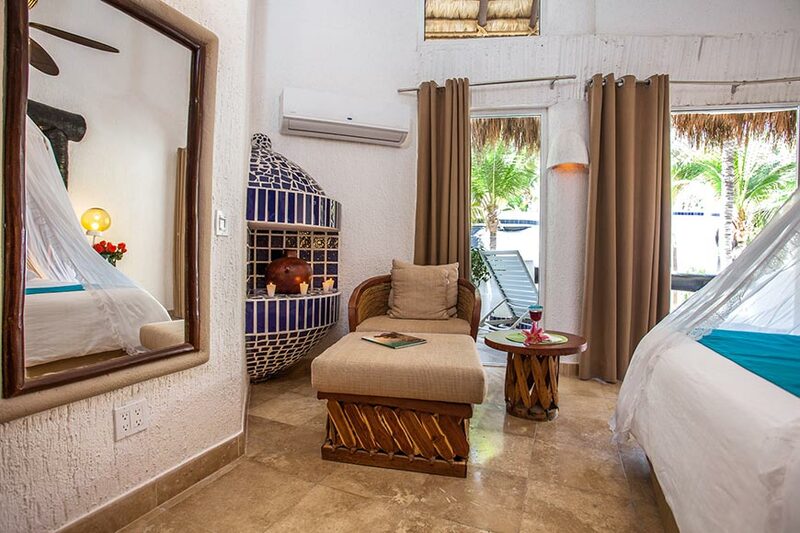 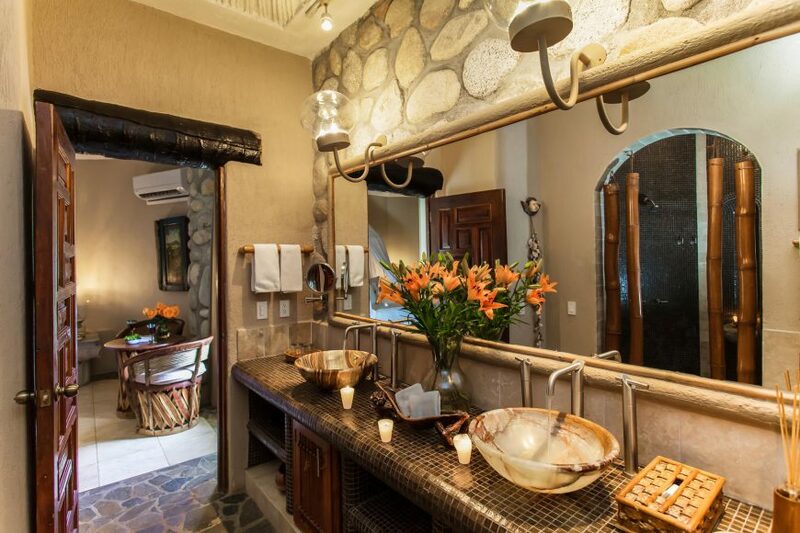 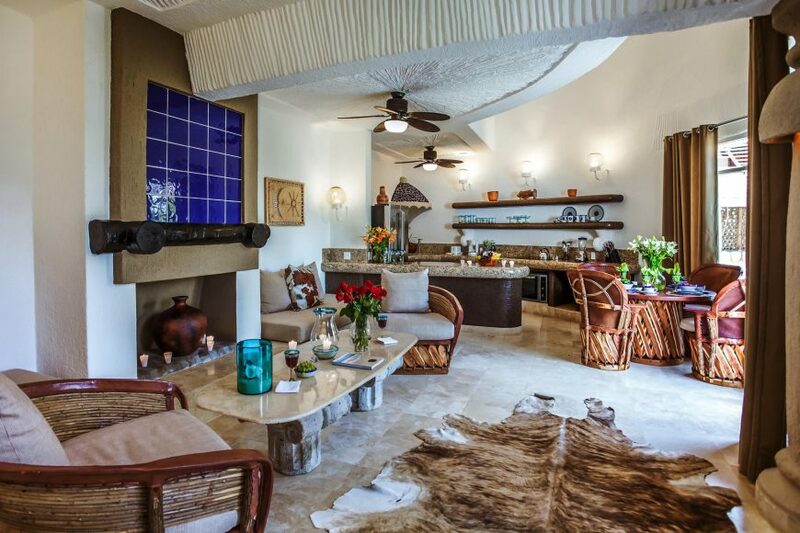 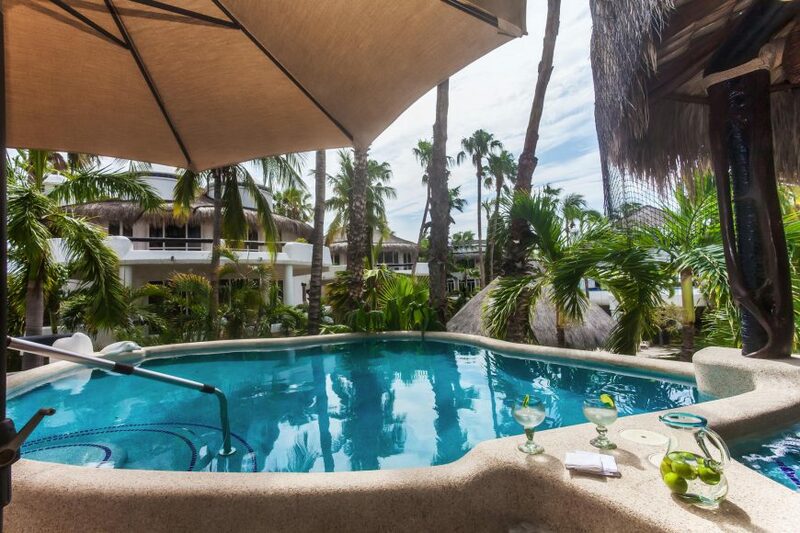 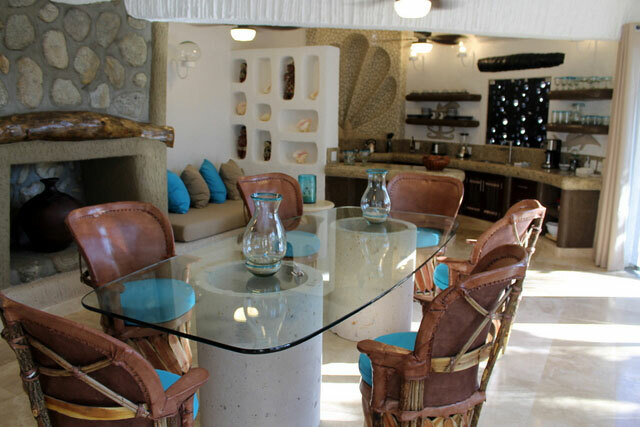 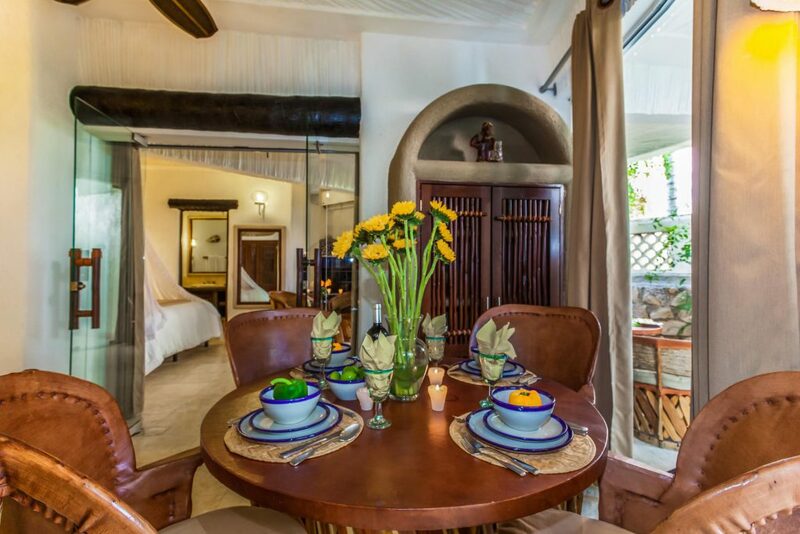 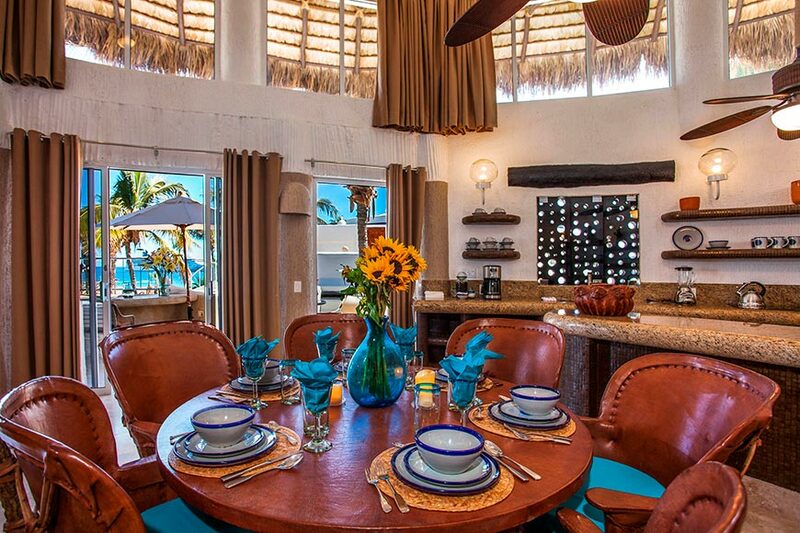 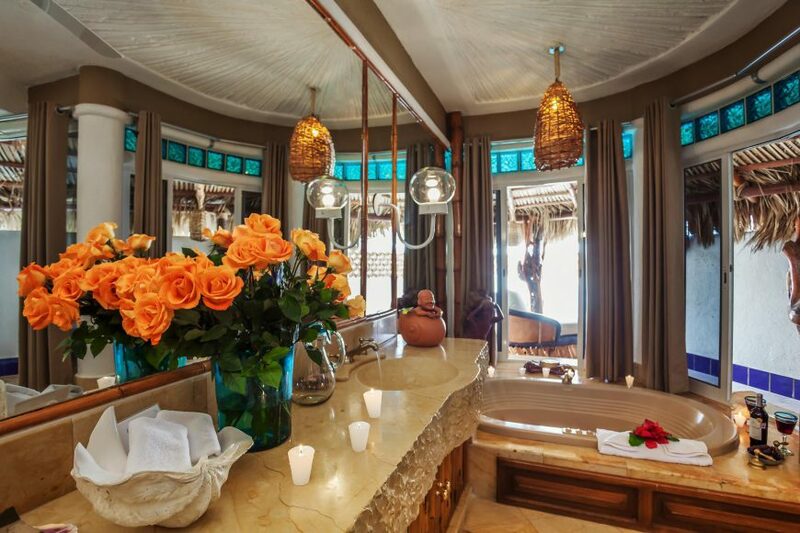 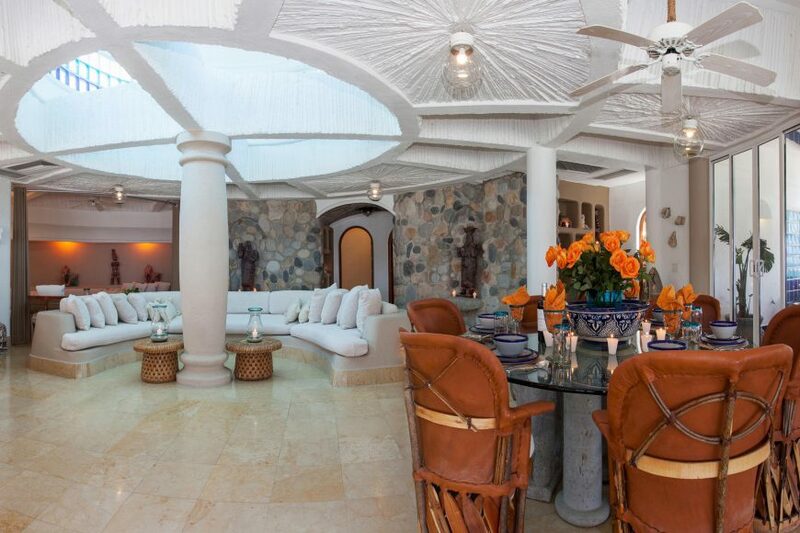 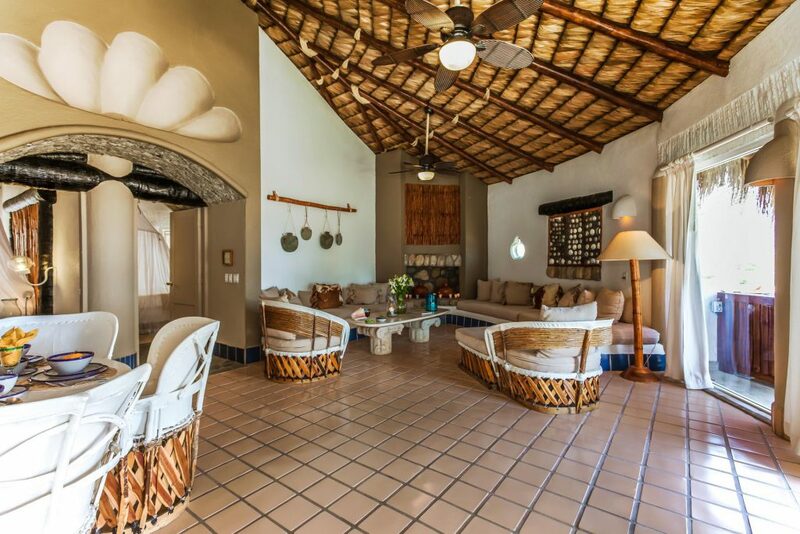 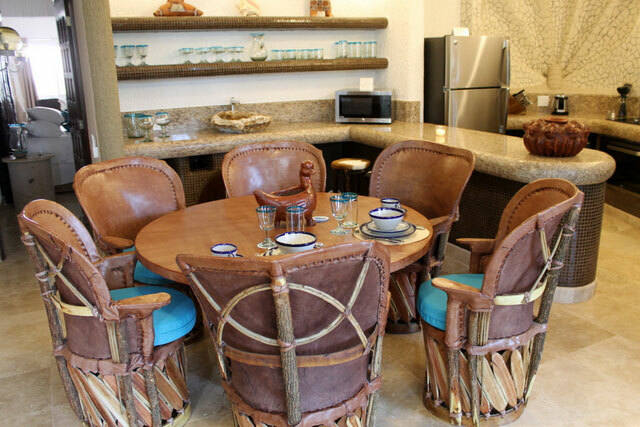 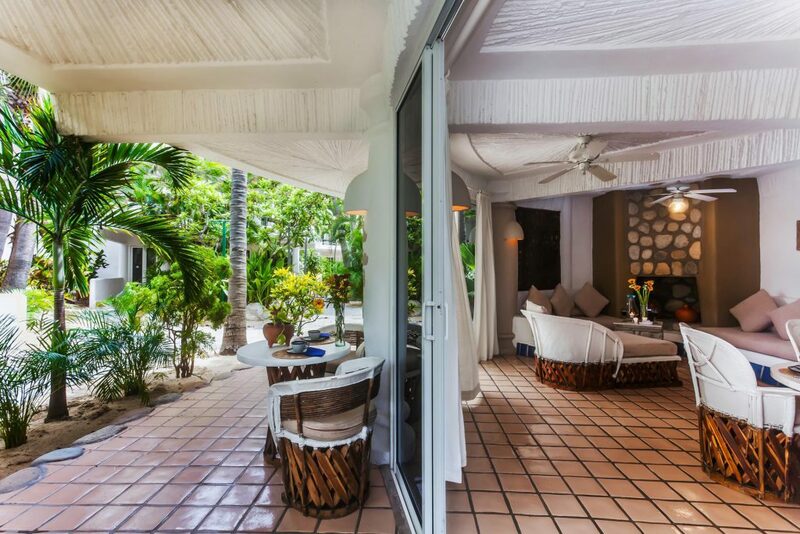 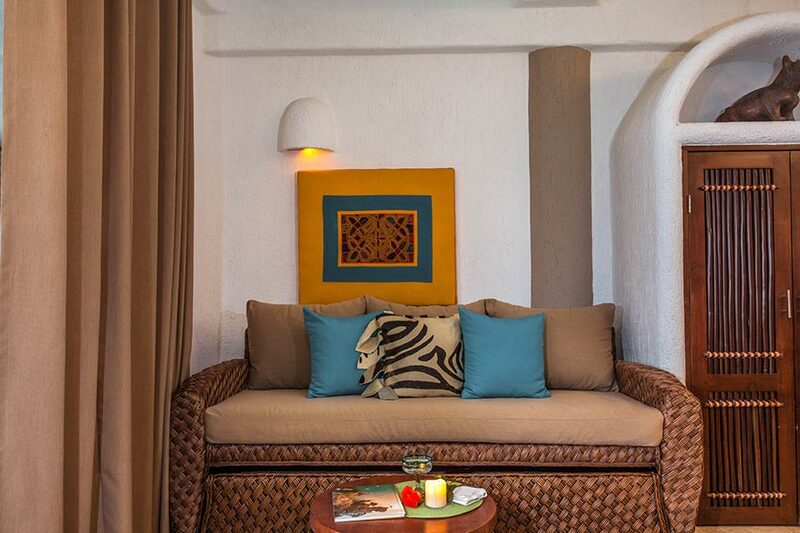 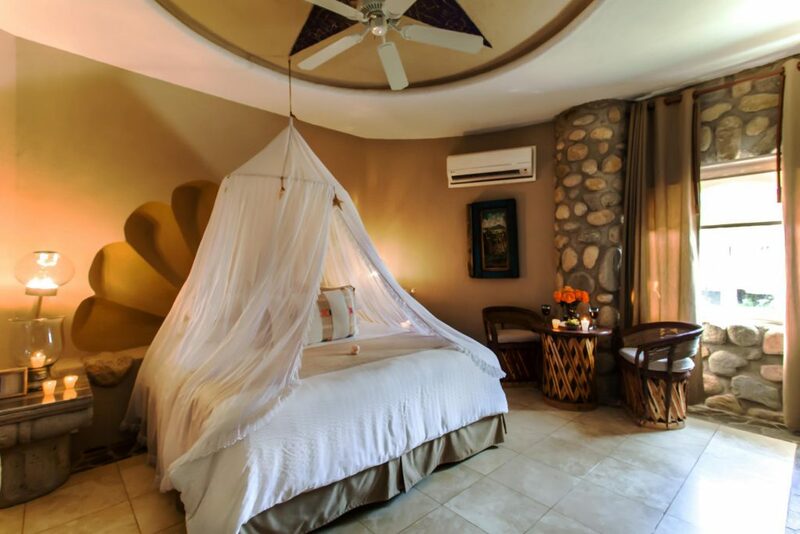 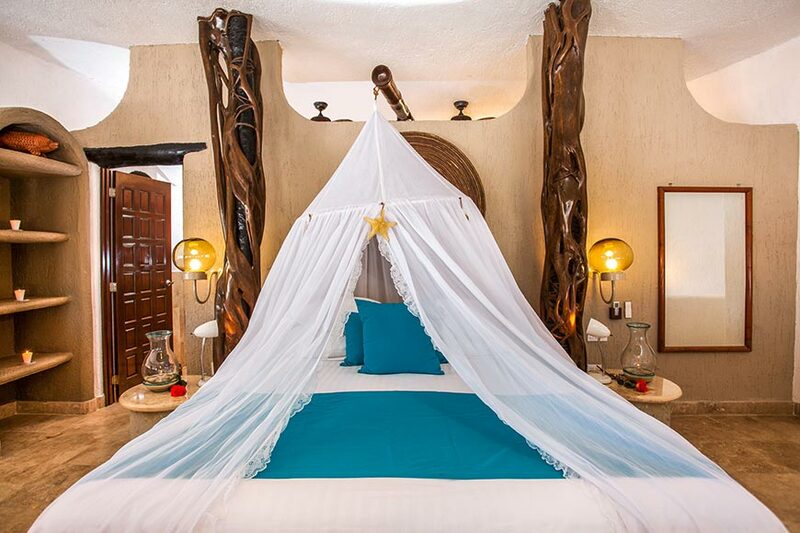 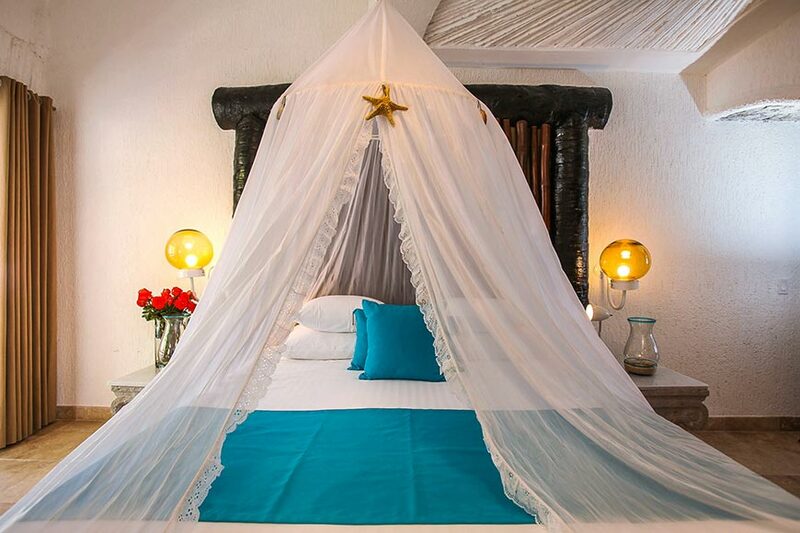 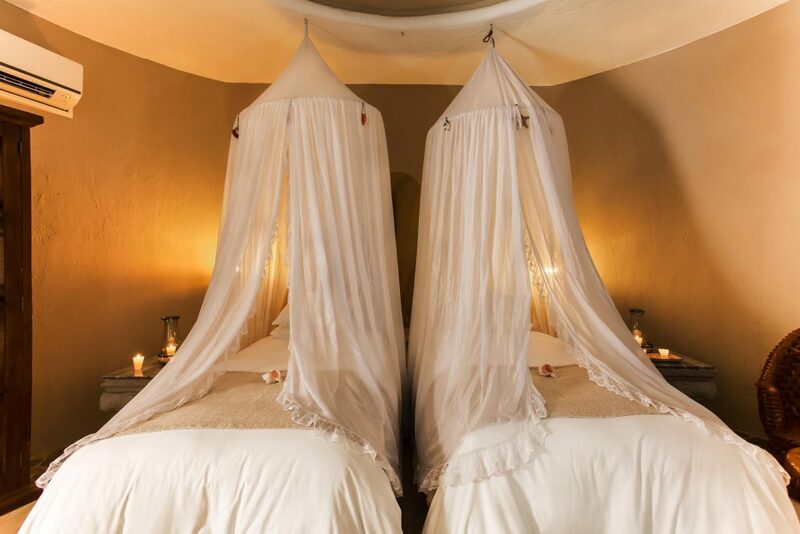 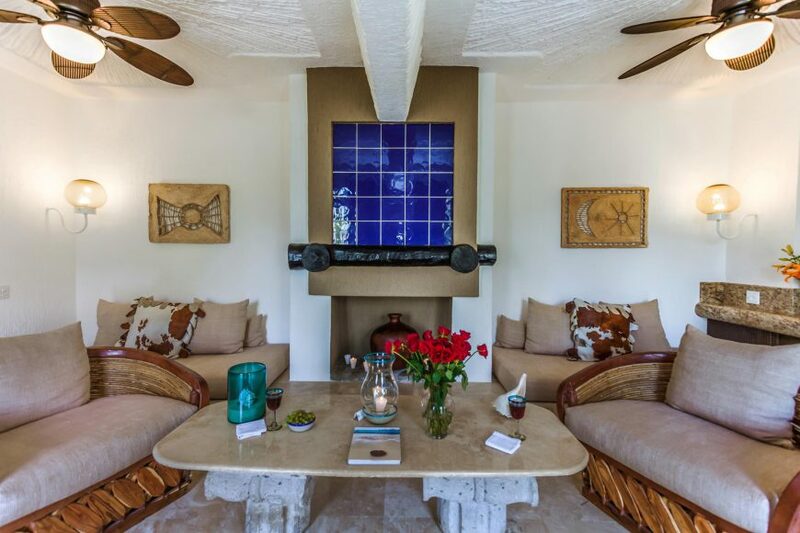 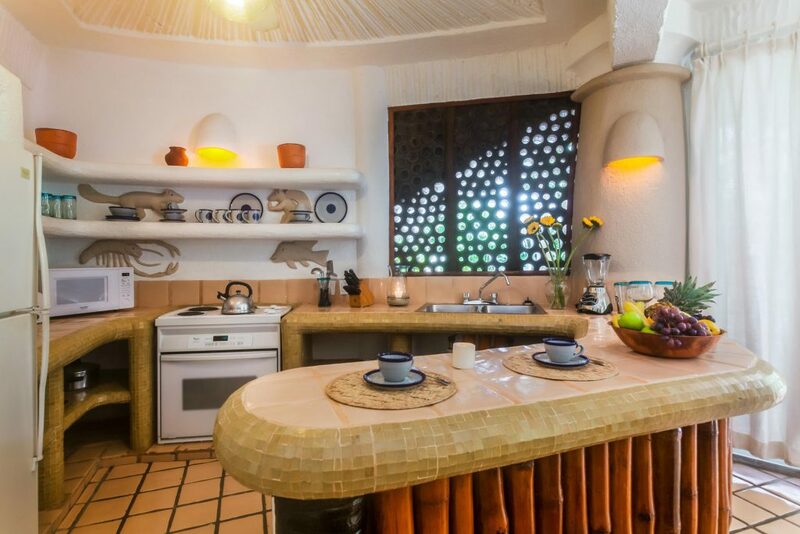 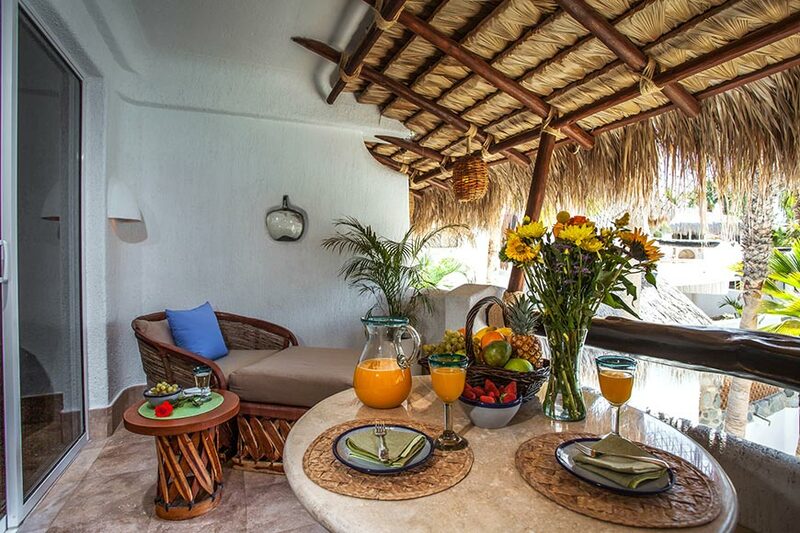 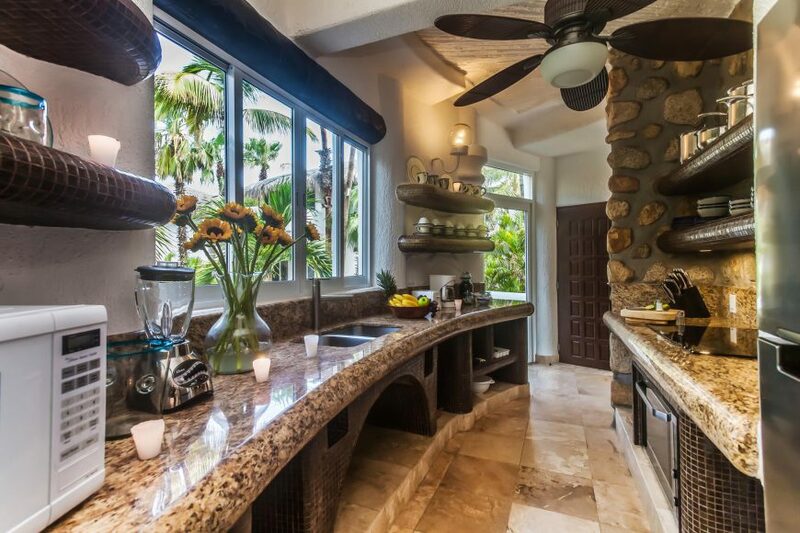 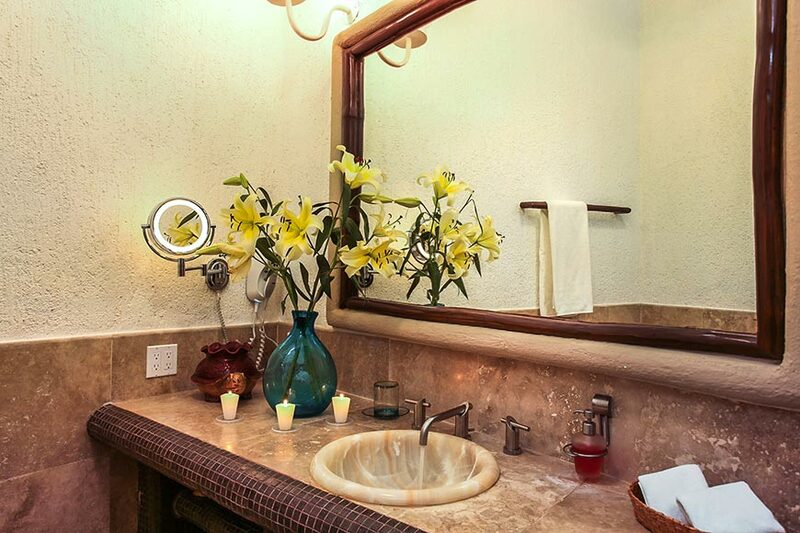 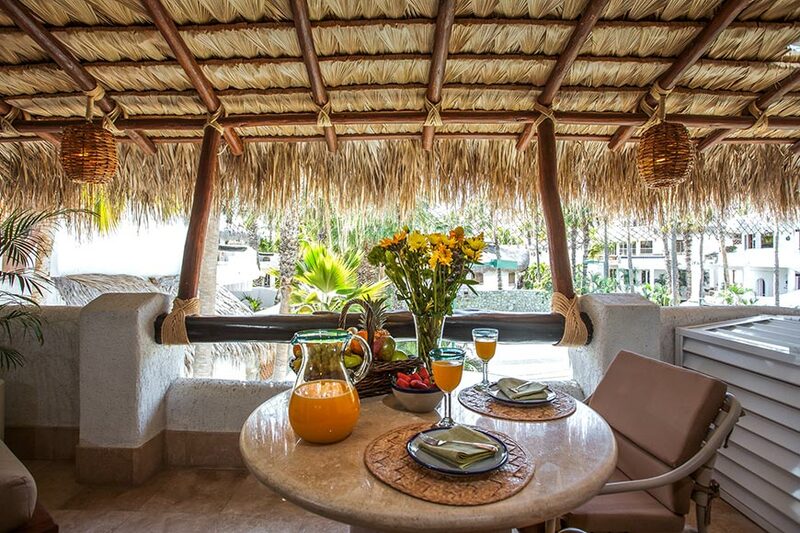 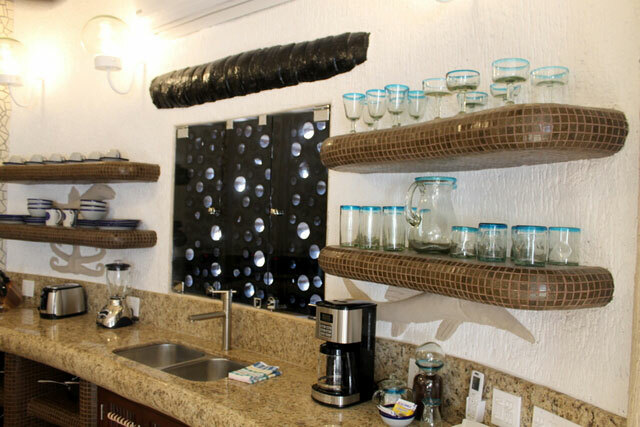 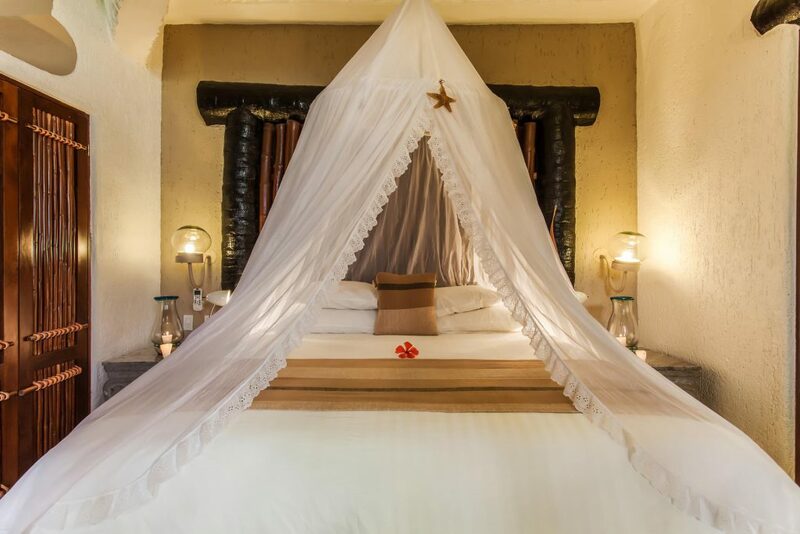 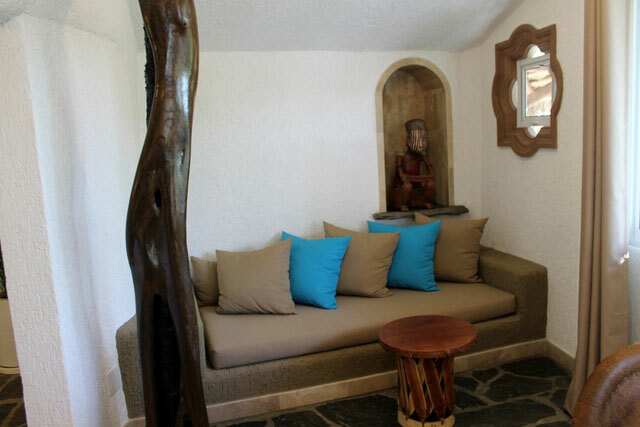 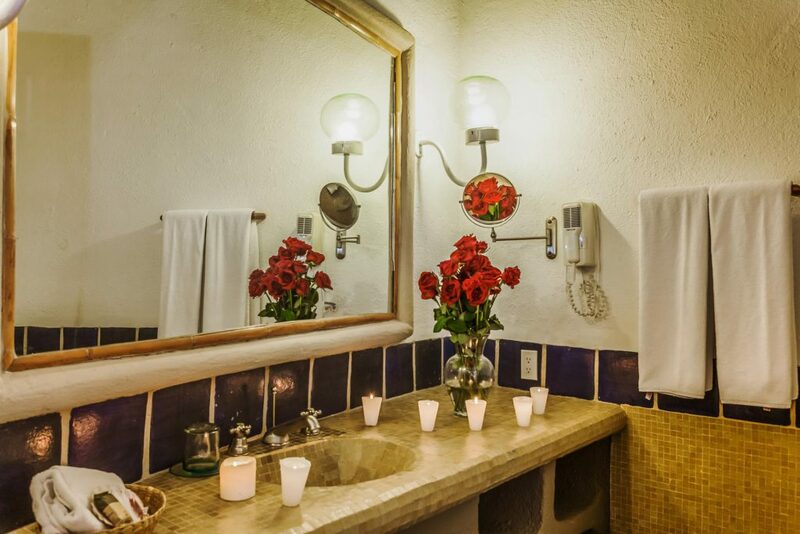 Palapa bar and spa, private sundecks, private beach and private chef and houseman available for a fee. 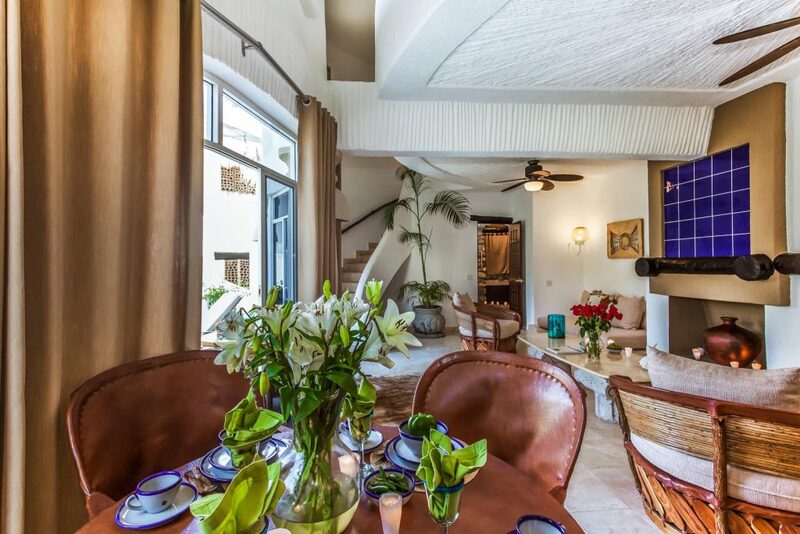 Two story unit on the 3rd or 4th level, fourth-floor loft with sloped ceilings. 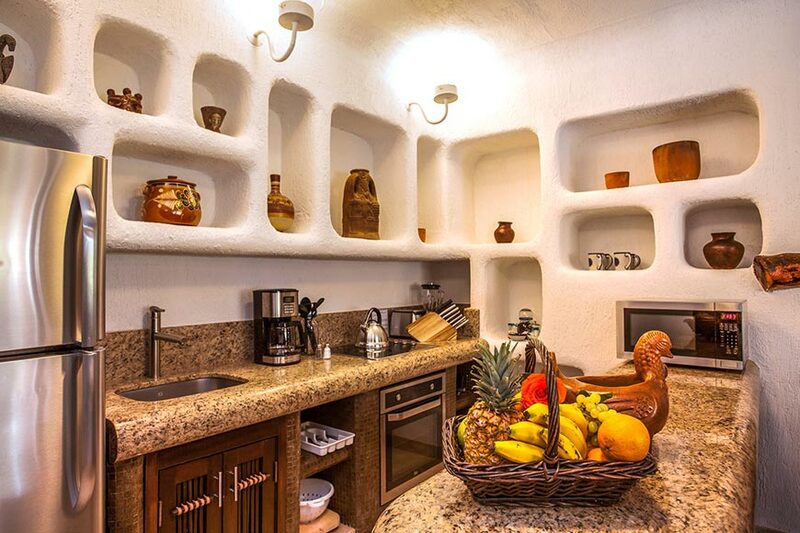 Two story unit with one bedroom. 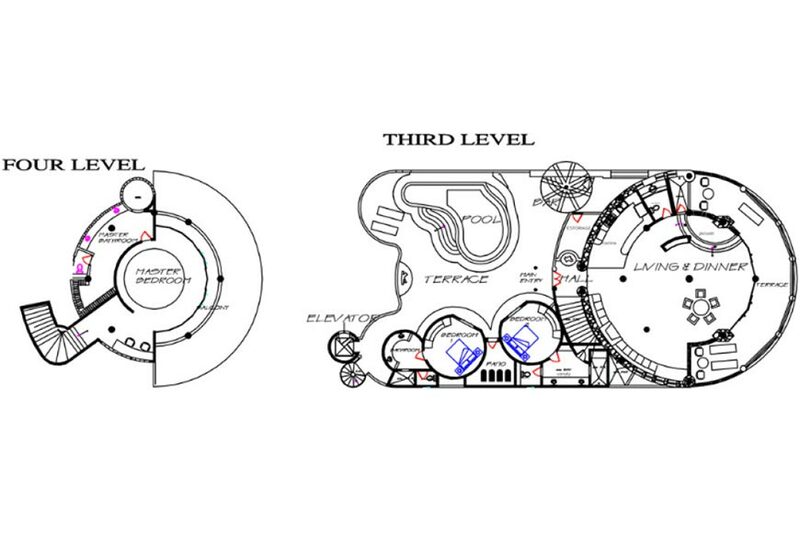 Located in buildings 5 and 7 on the 2nd or 3rd level. 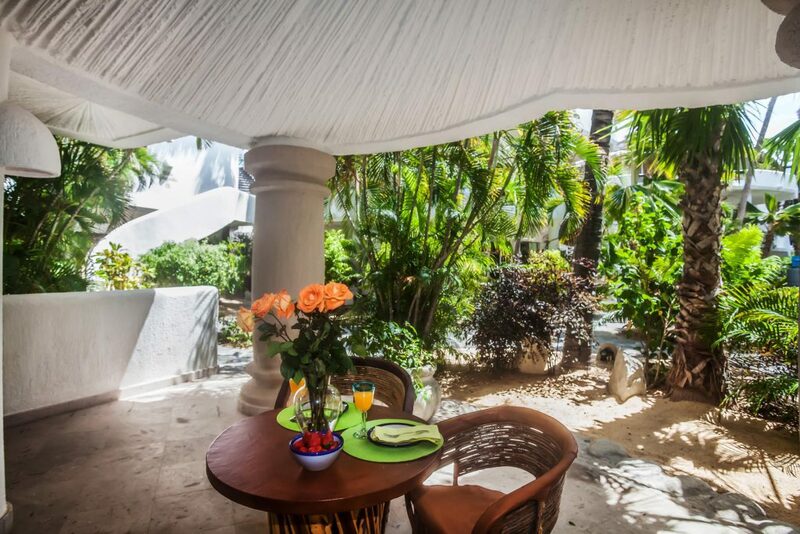 Interior garden or sunset view. 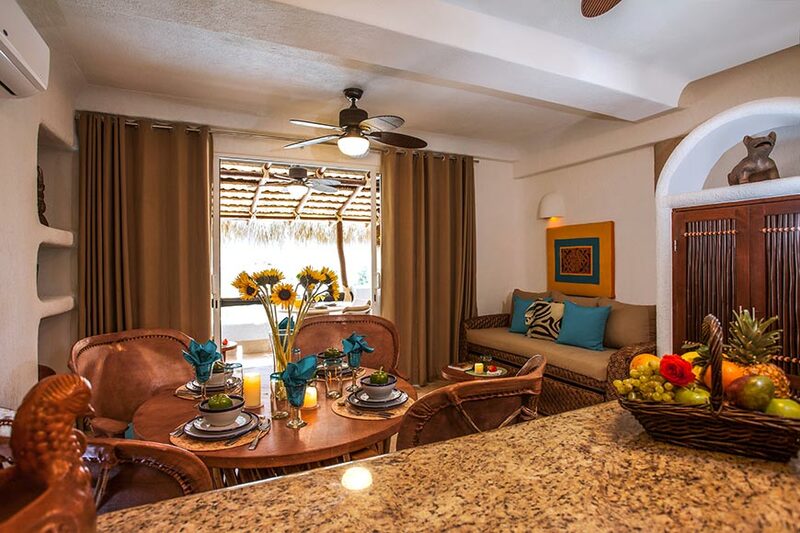 One story unit with two bedrooms. 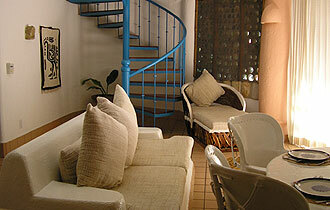 Second-level stair only access. 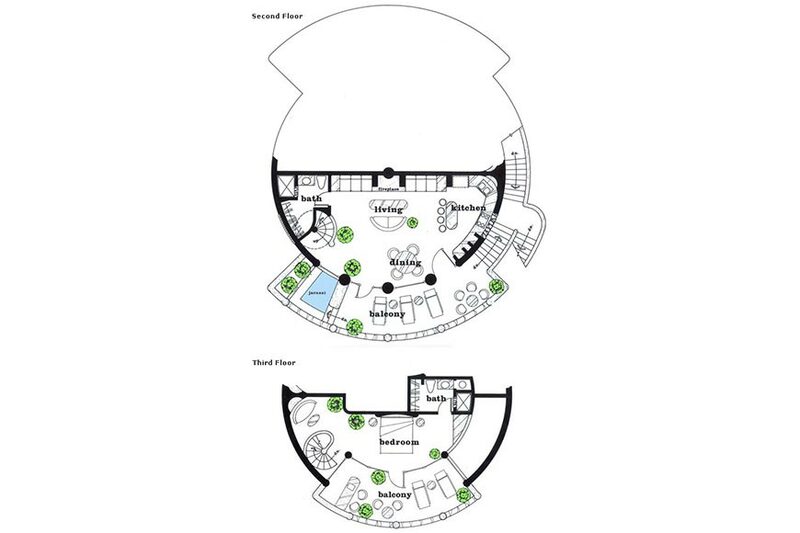 One story unit with two bedrooms. 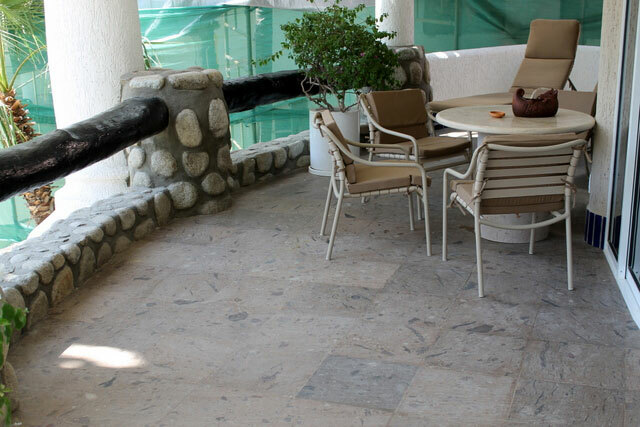 Located in buildings 1, 8, 10, 11, 12, 13, 16, 17, 19, 20, 21, 22, 23 and 24 on the second level. One story unit with two bedrooms. 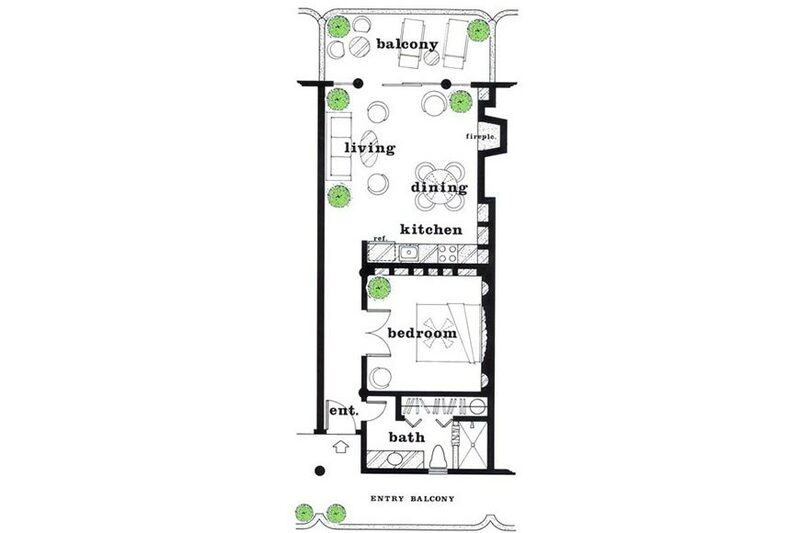 Located in buildings 21, 22 and 24 on the ground floor. 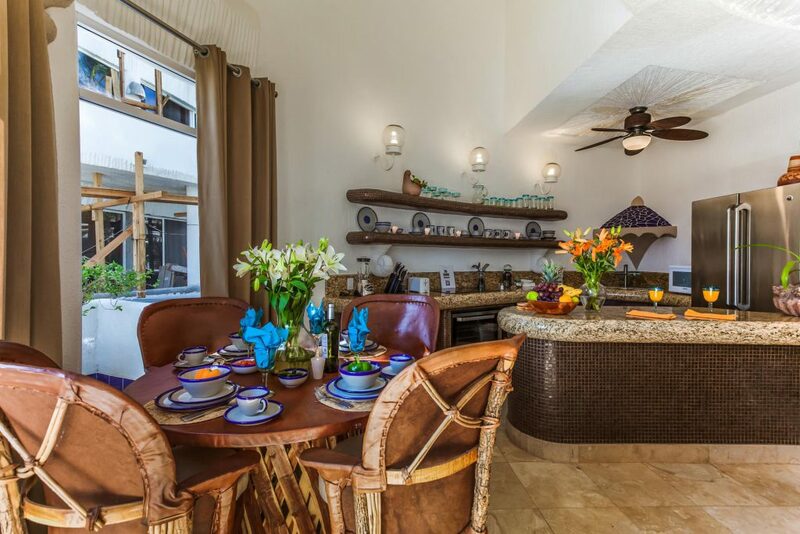 One story unit with four bedrooms. 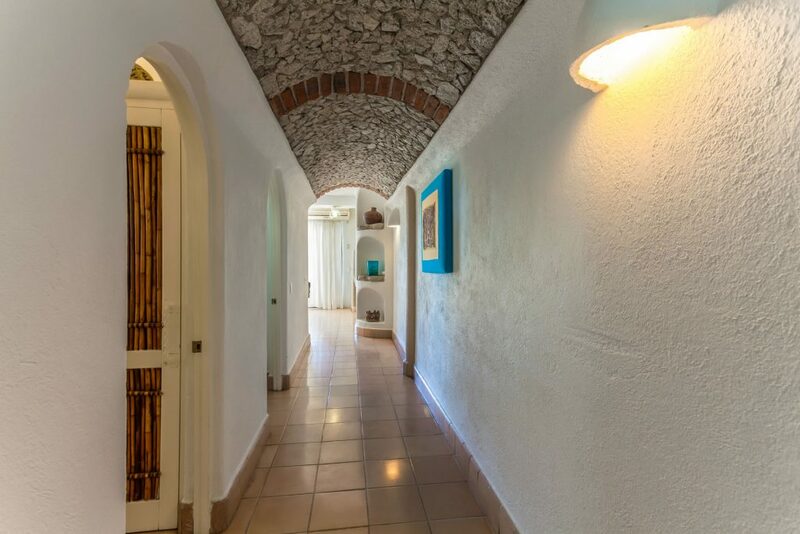 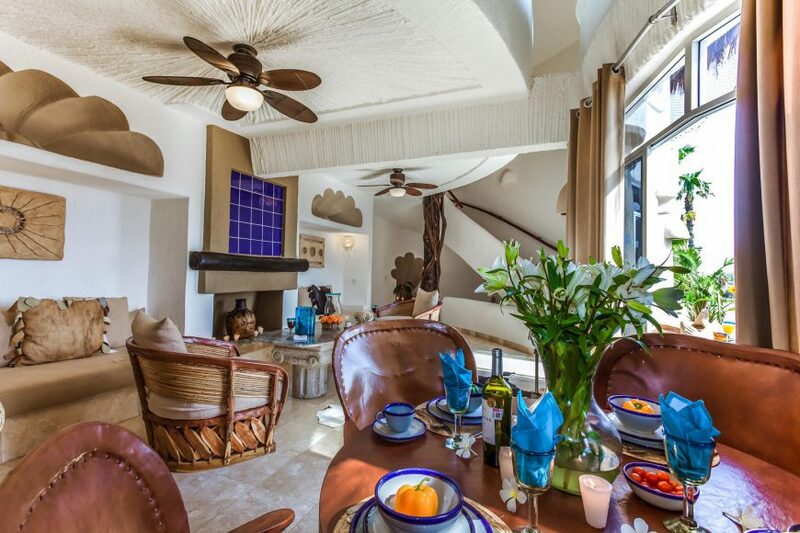 4th-floor villa with elevator access in the Las Palmas building. 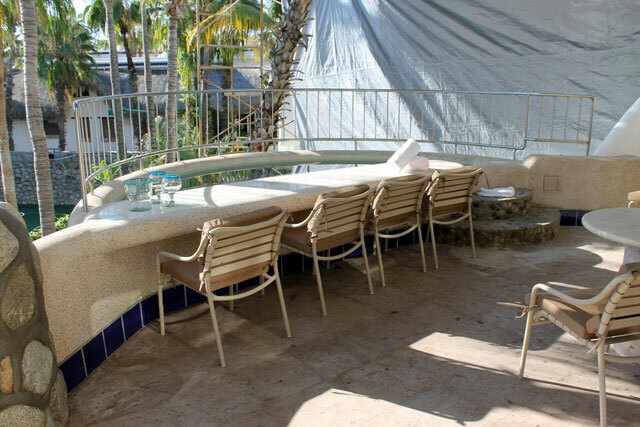 Extra large private sun deck with private pool and swim-up bar. 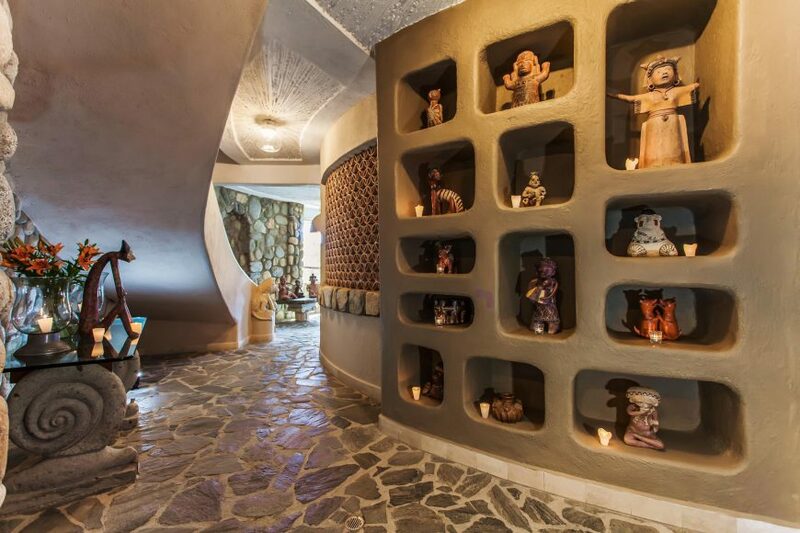 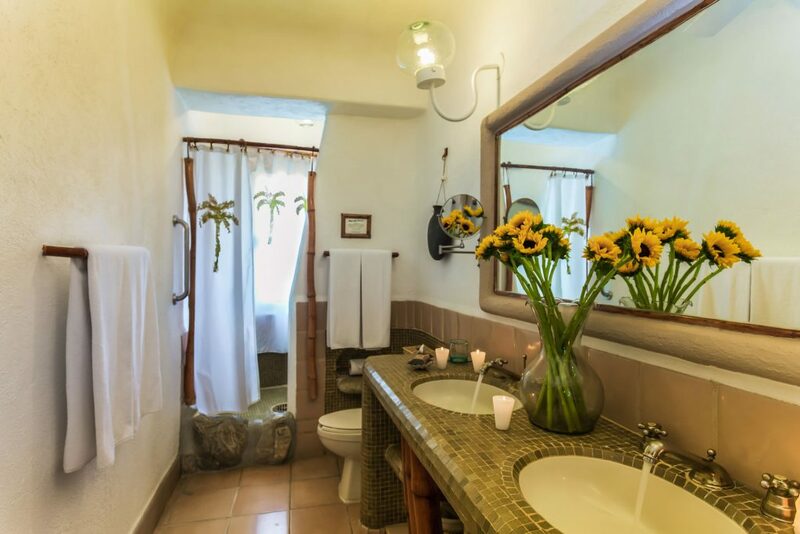 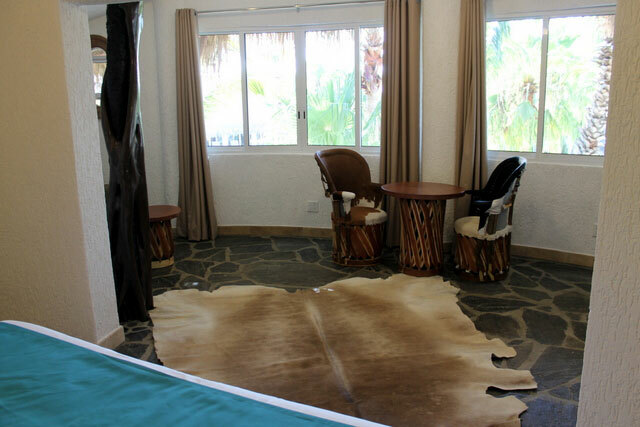 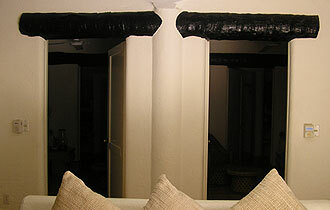 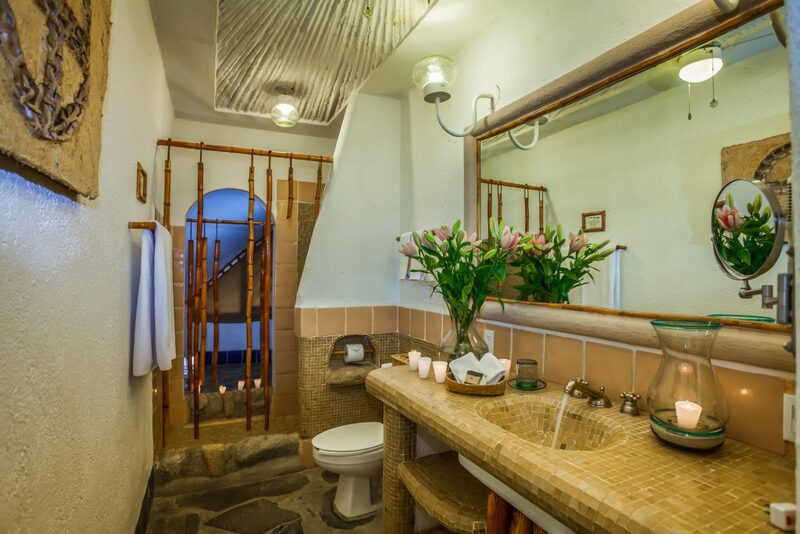 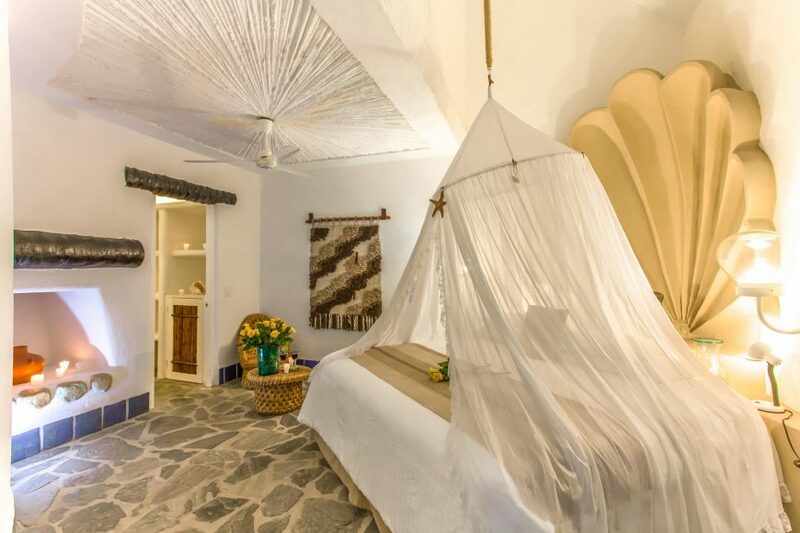 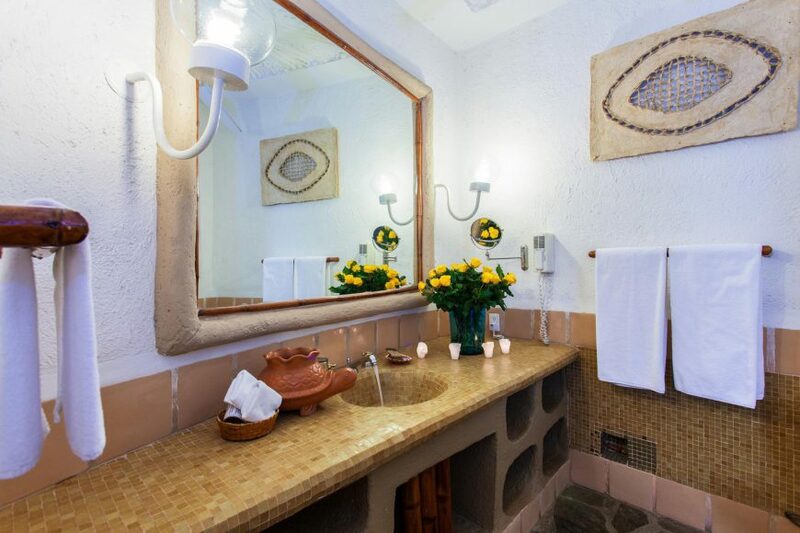 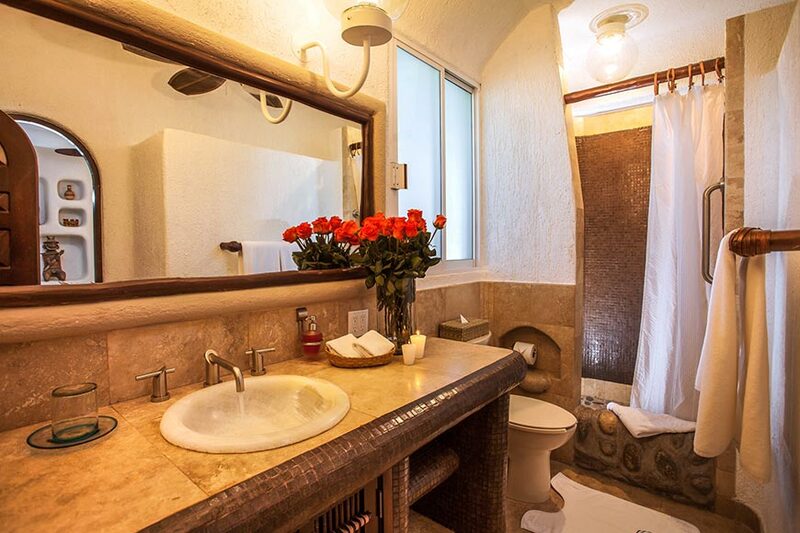 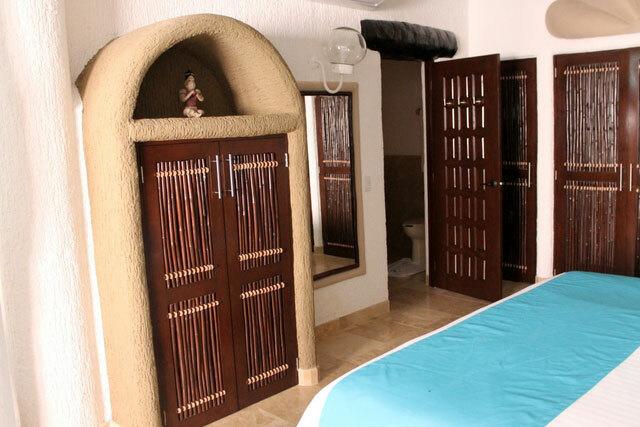 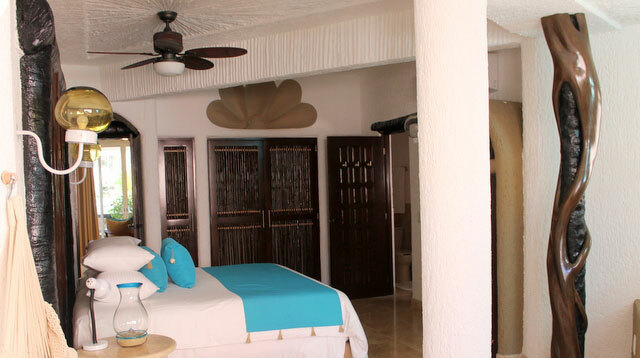 Four self-contained bedrooms with full bathrooms and fifth bathroom in living area. 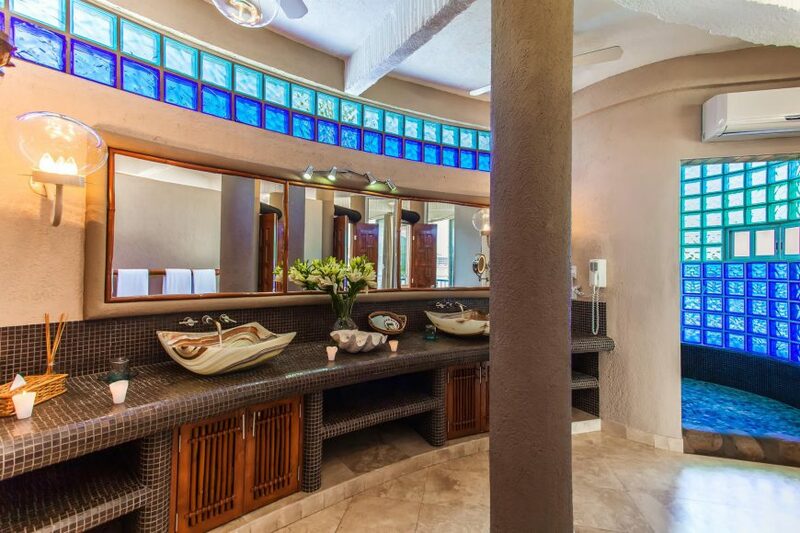 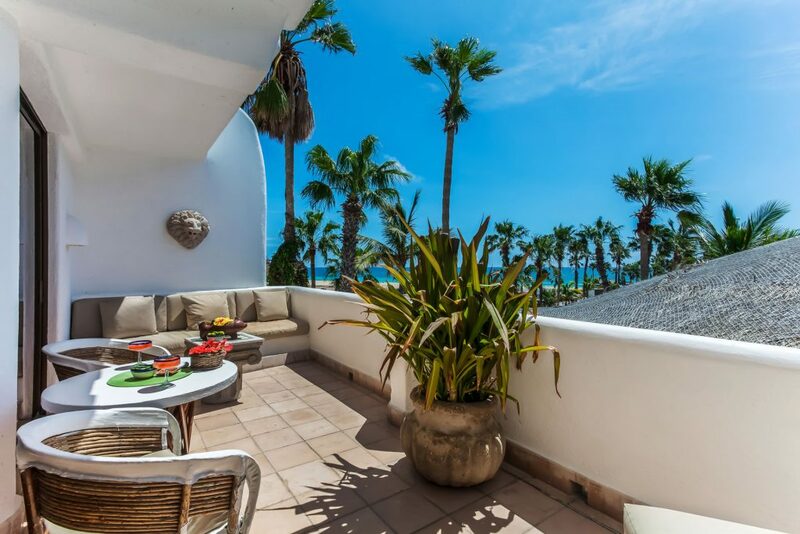 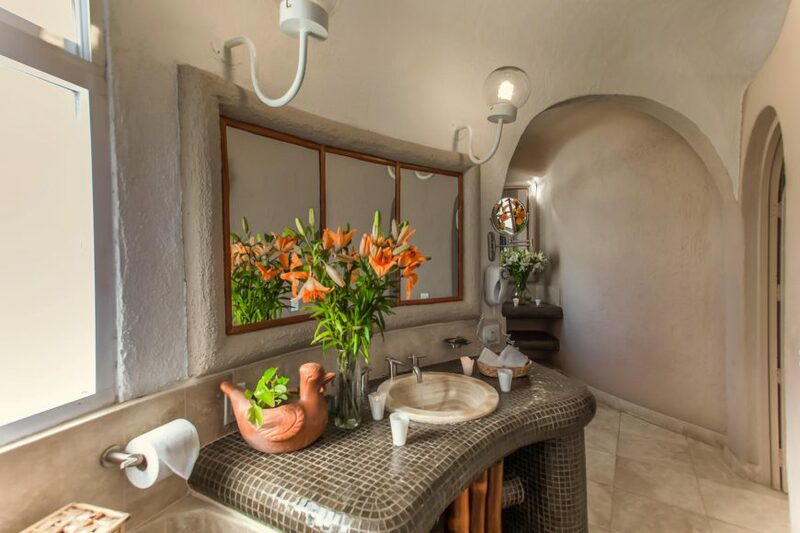 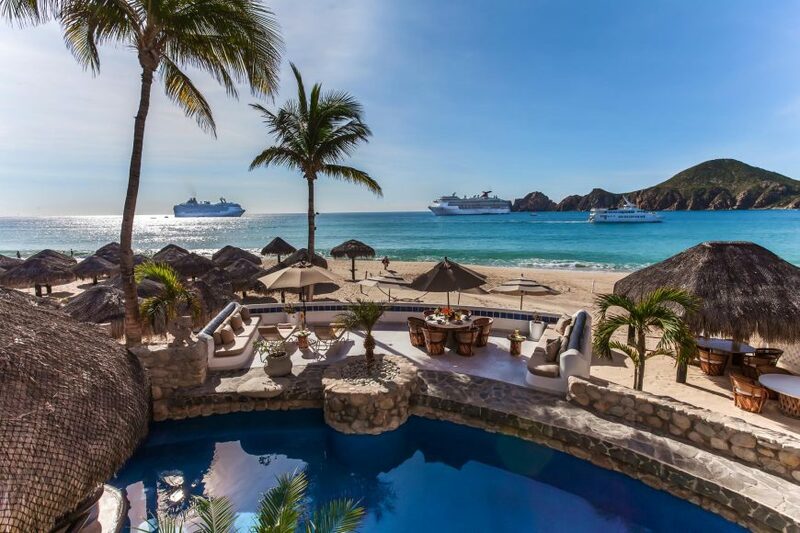 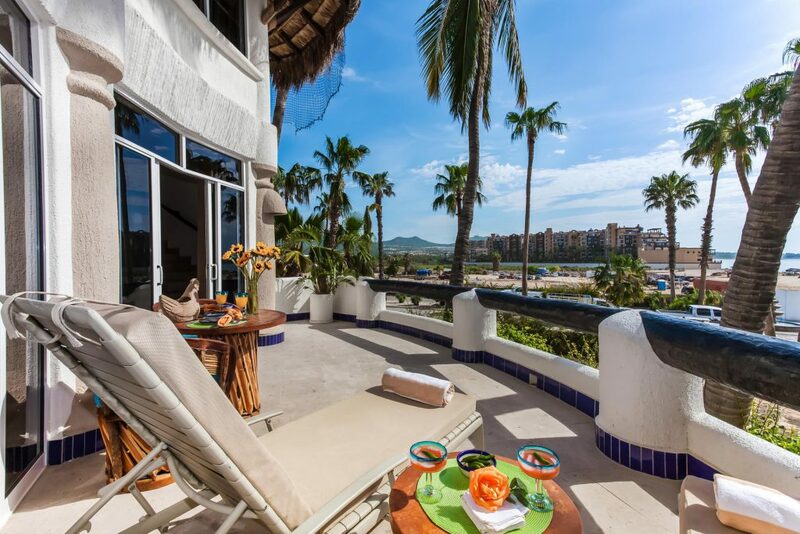 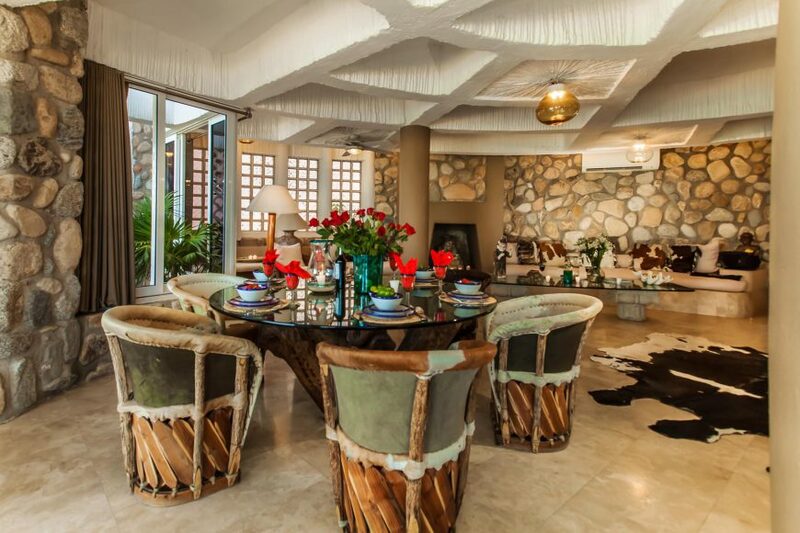 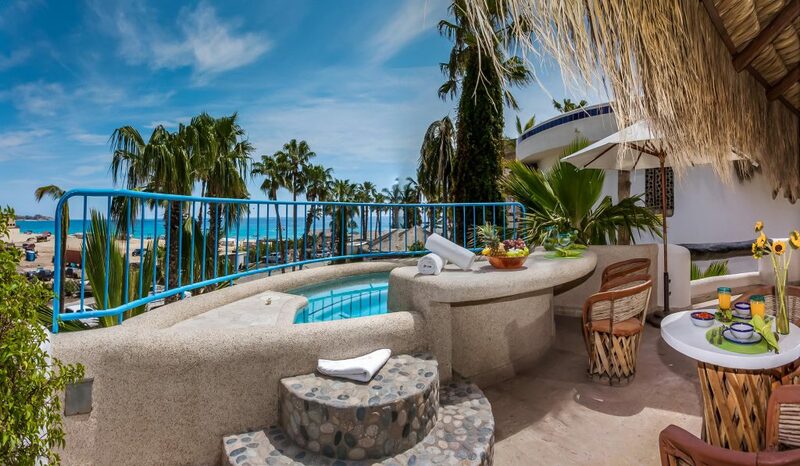 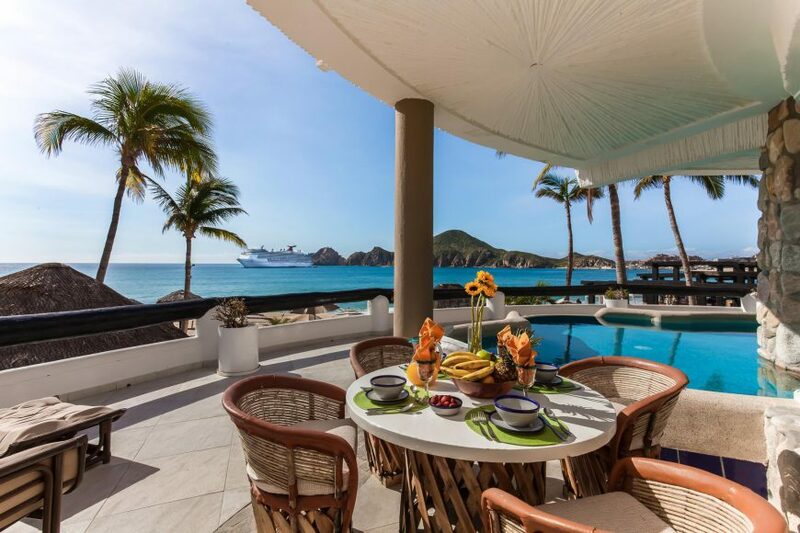 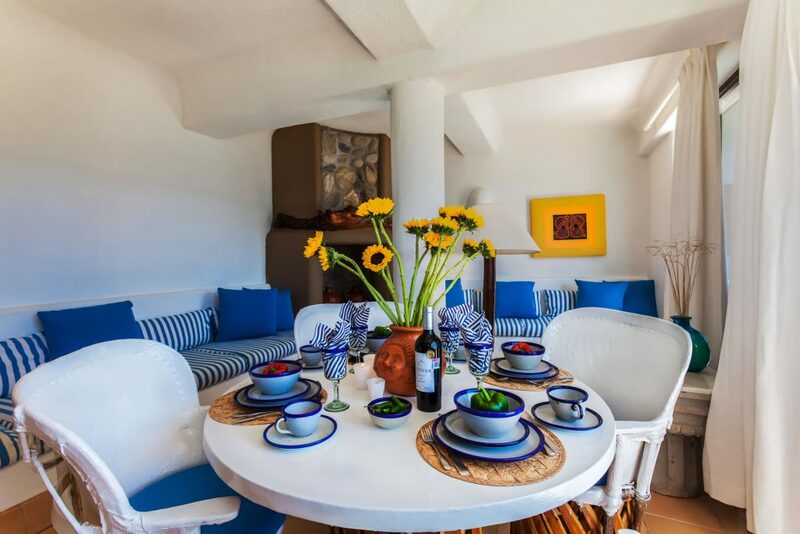 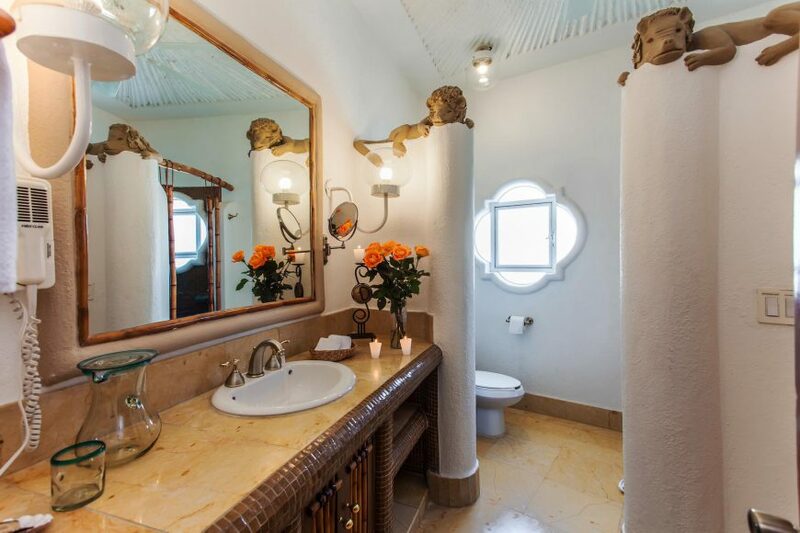 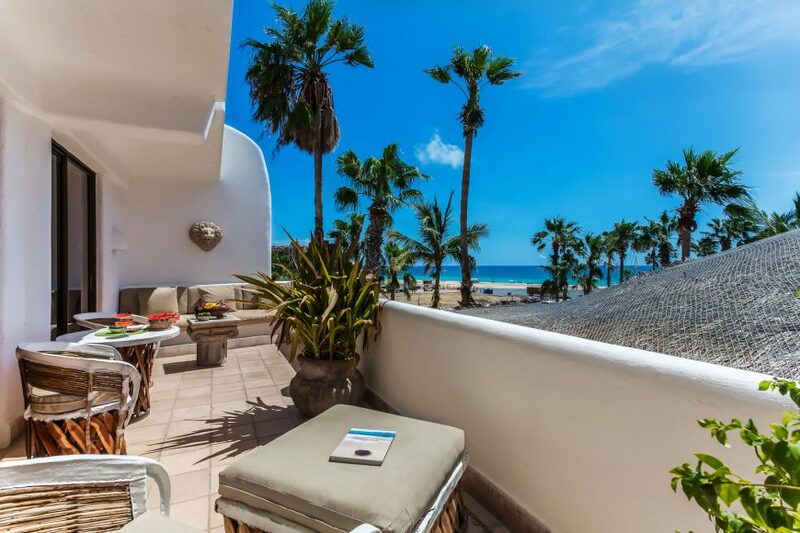 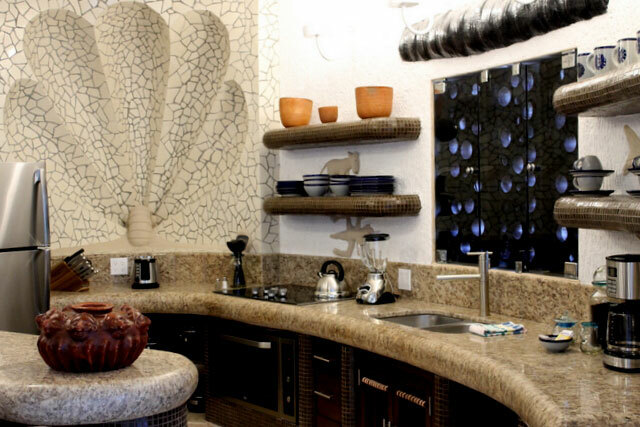 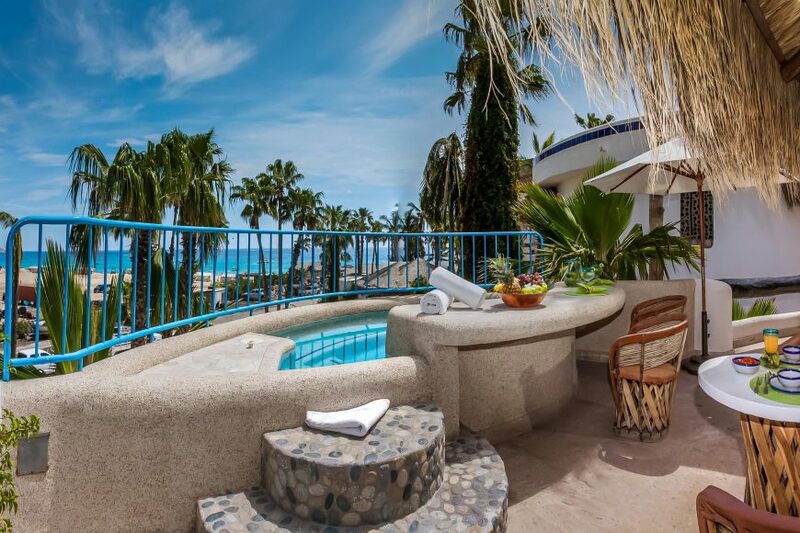 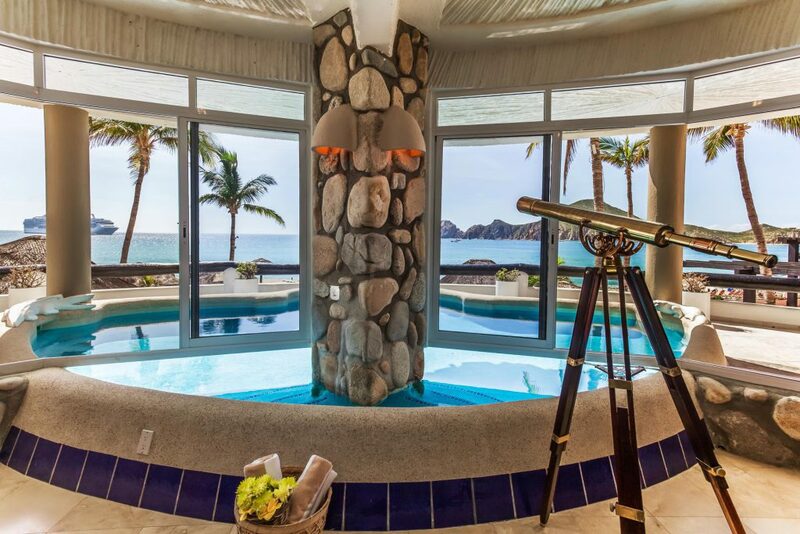 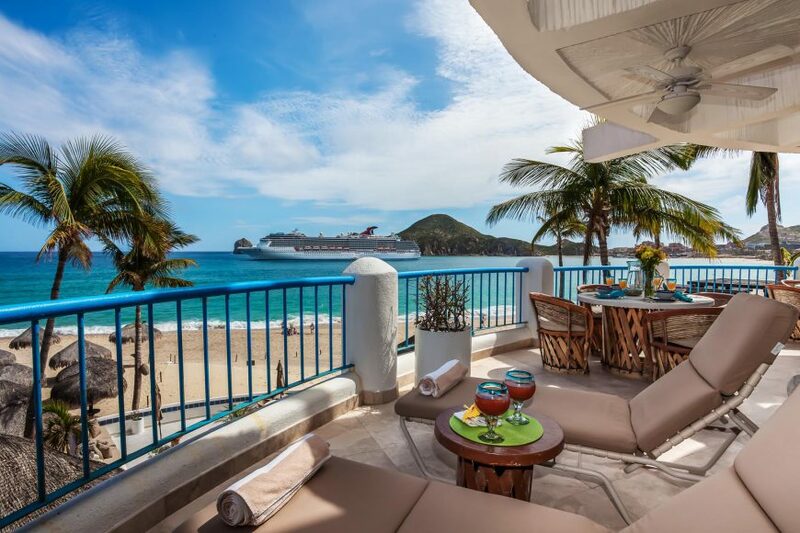 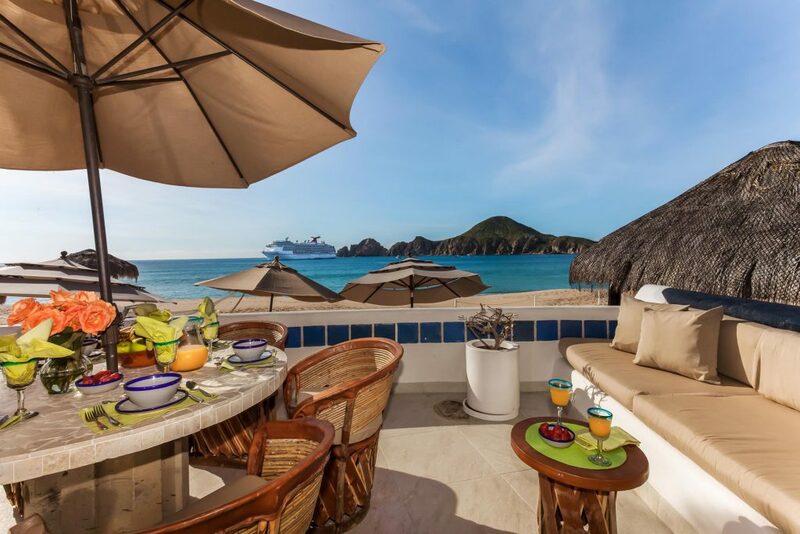 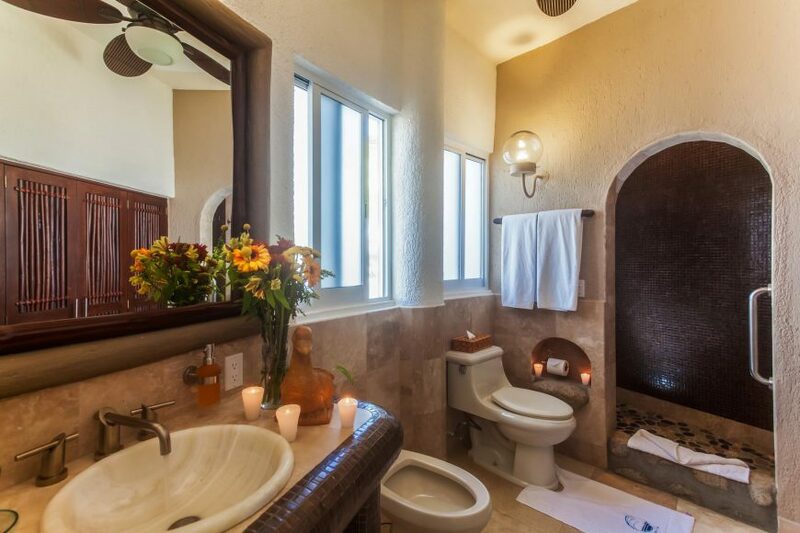 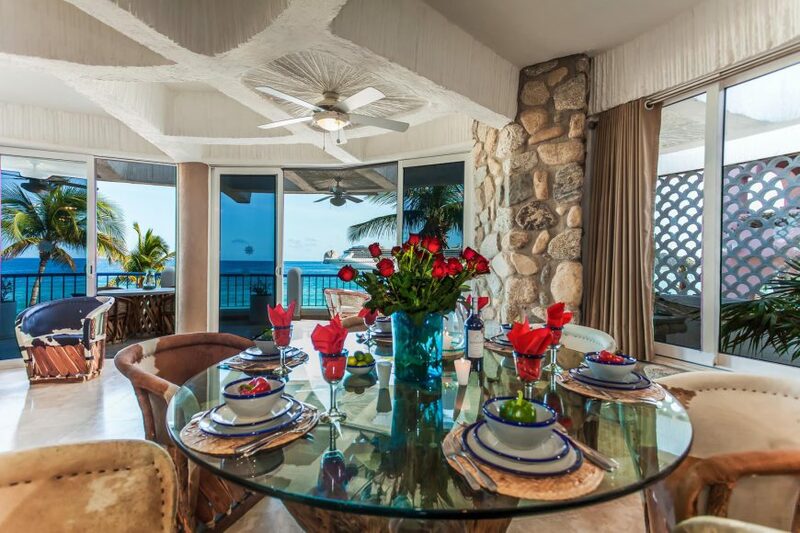 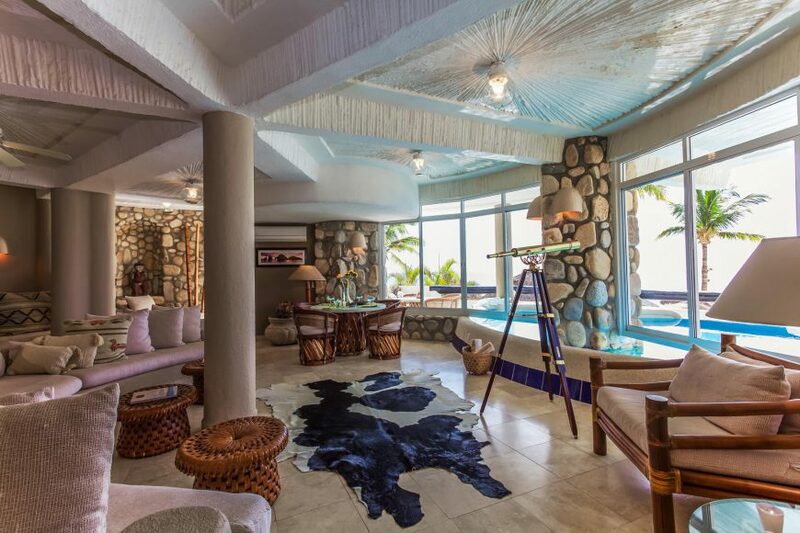 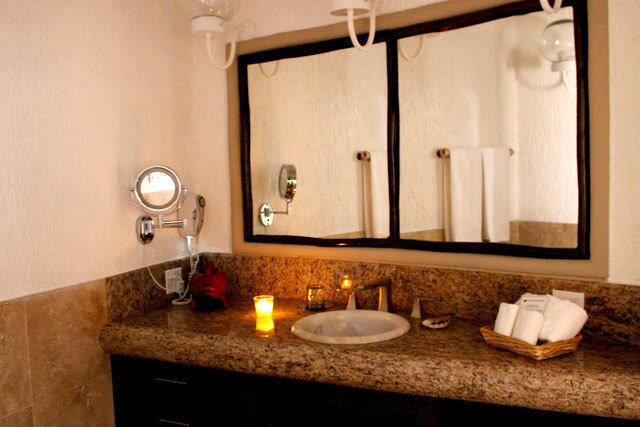 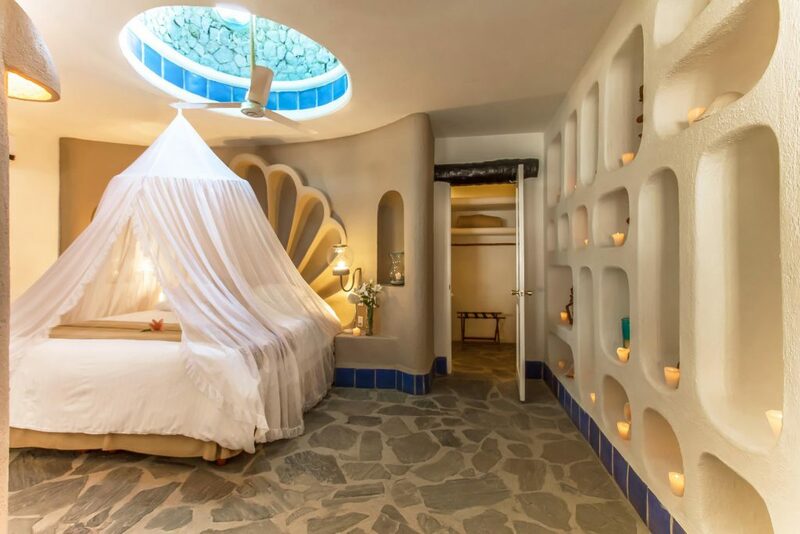 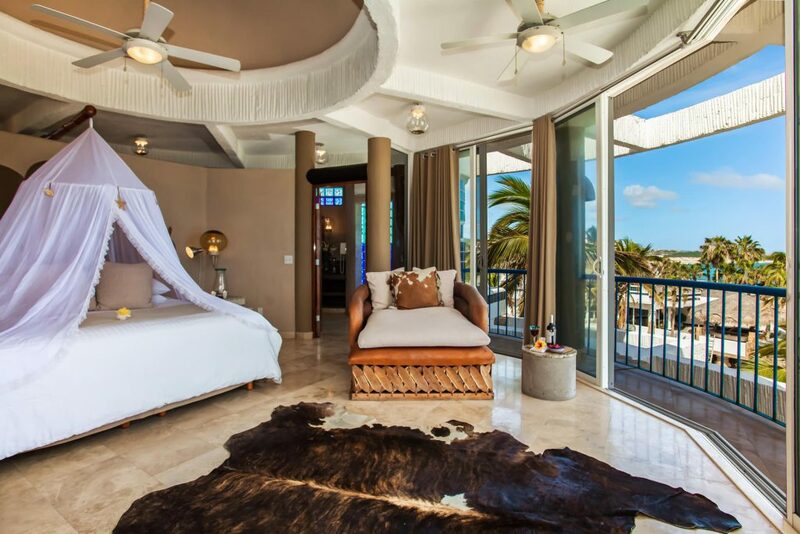 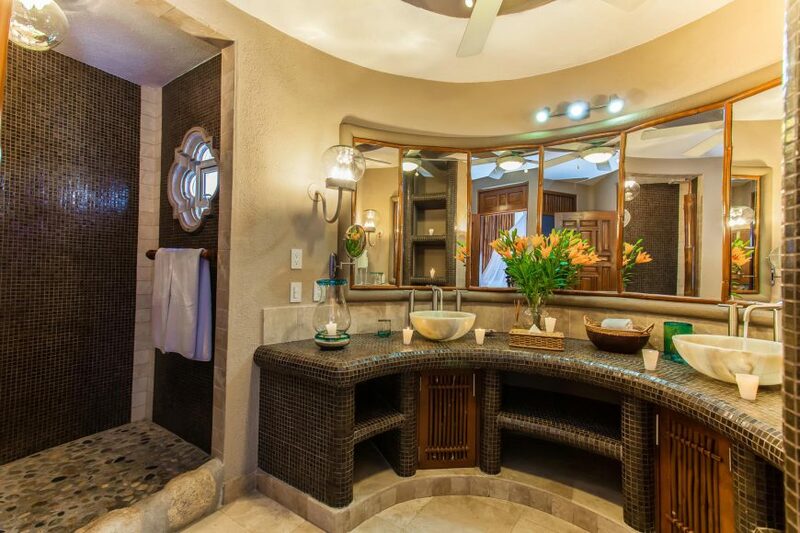 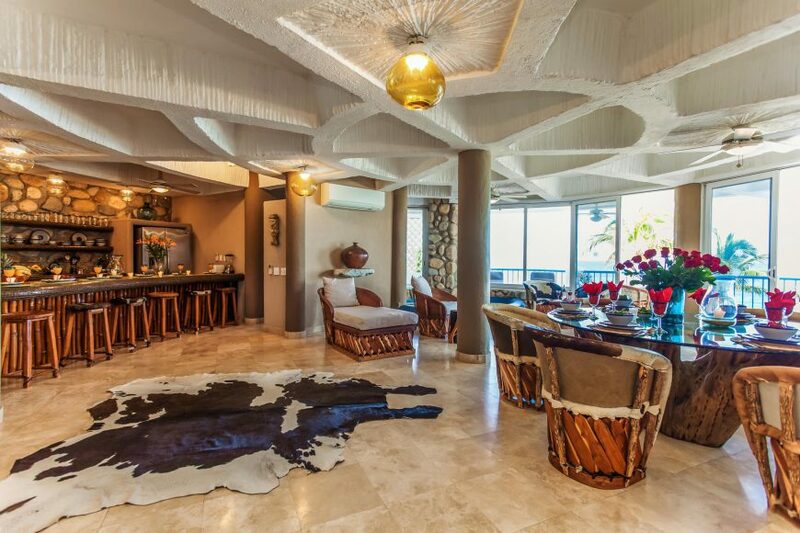 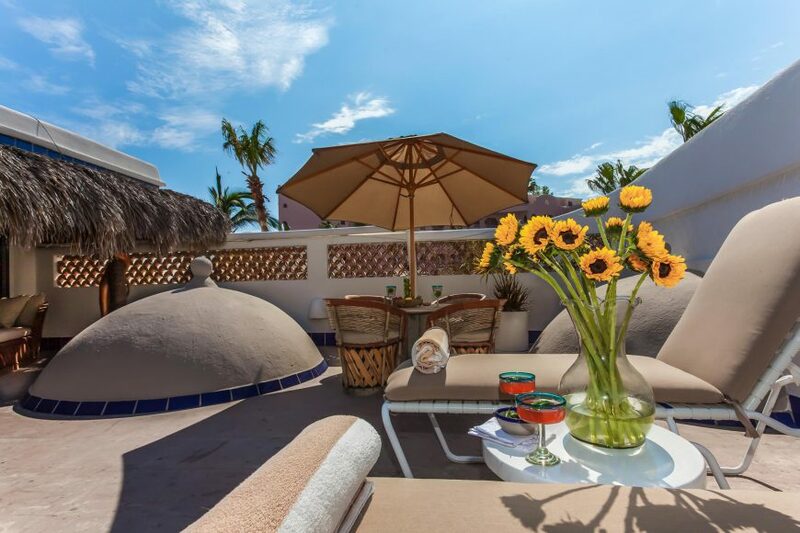 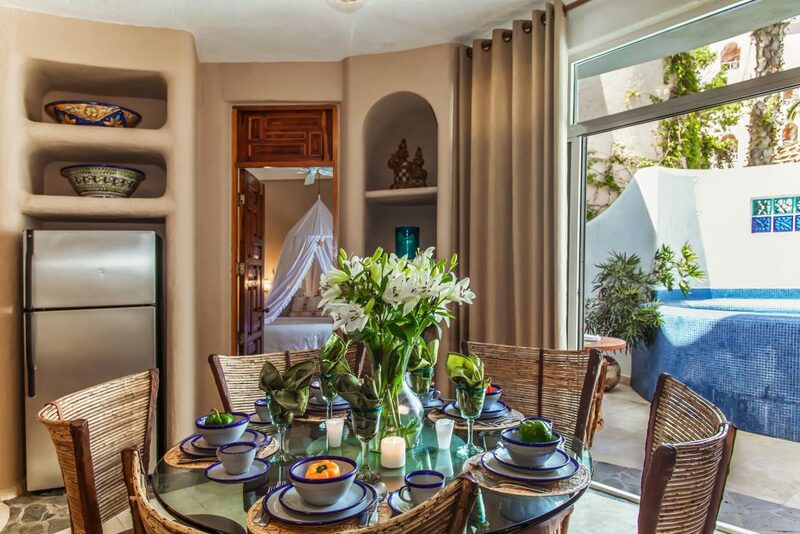 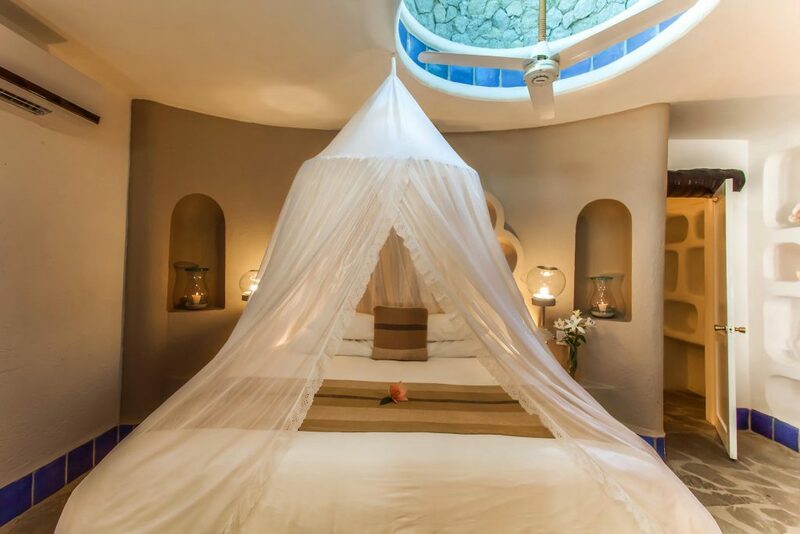 Two bedroom penthouse overlooking Cabo Bay. 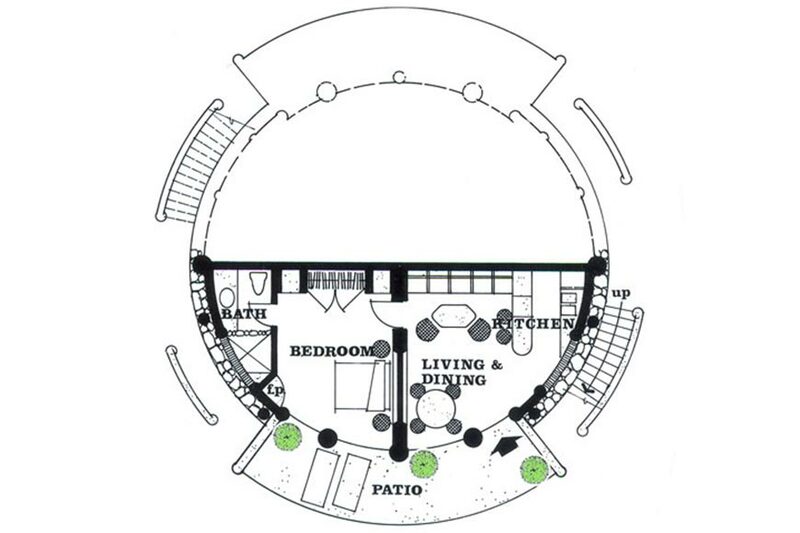 Third level unit with stair access only. 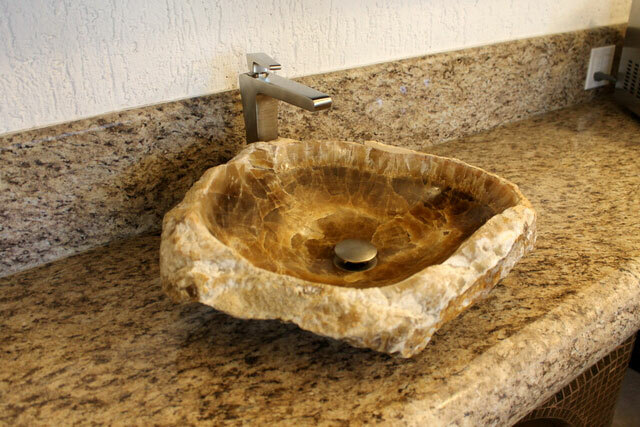 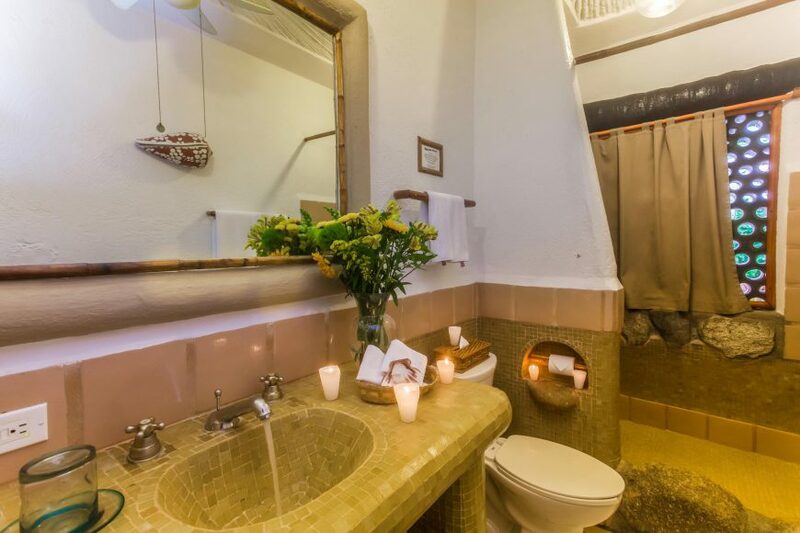 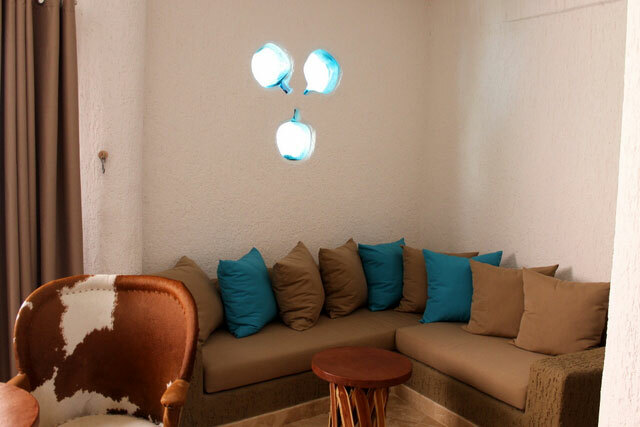 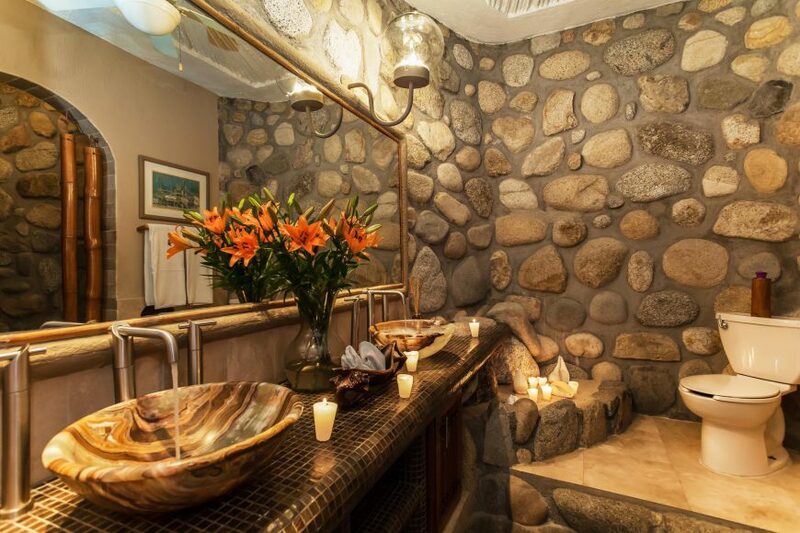 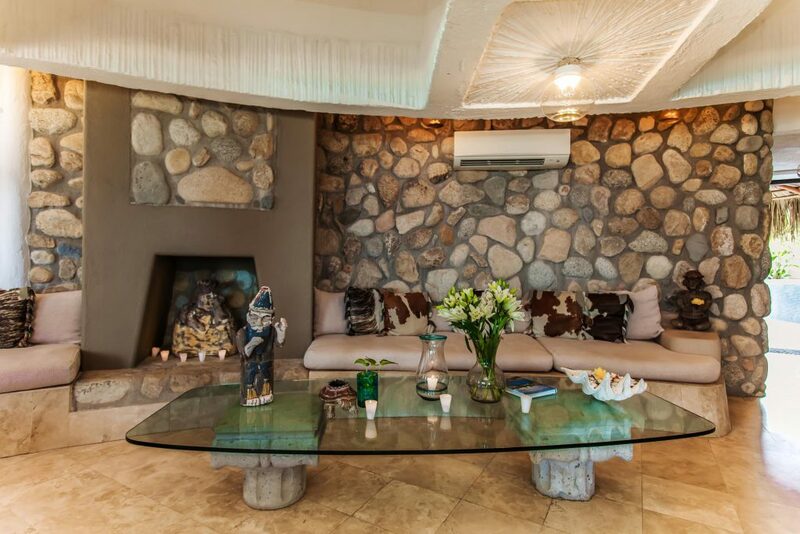 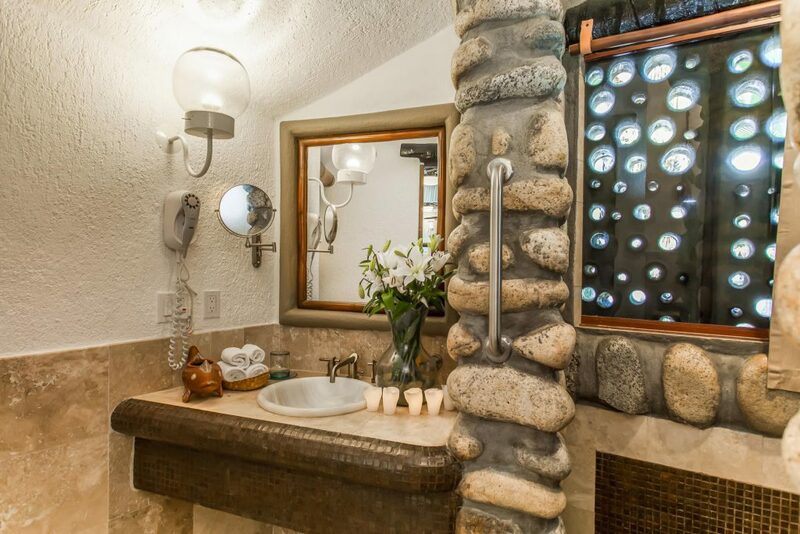 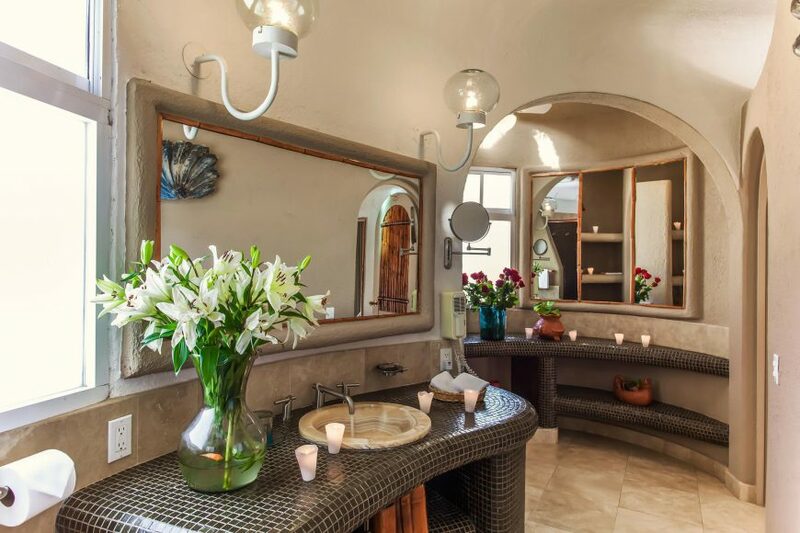 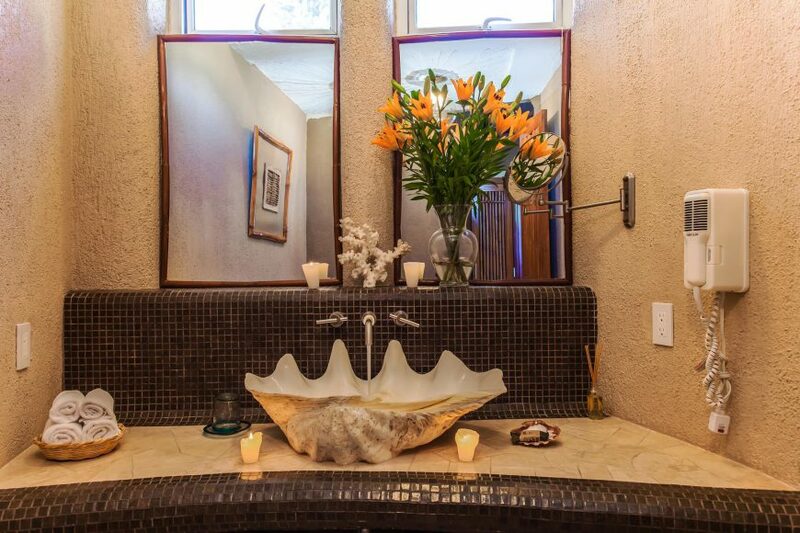 Air-conditioned marble interior floors, marble showers and lav tops in bathroom, marble kitchen counters and an additional sleeping area in build-in alcove. 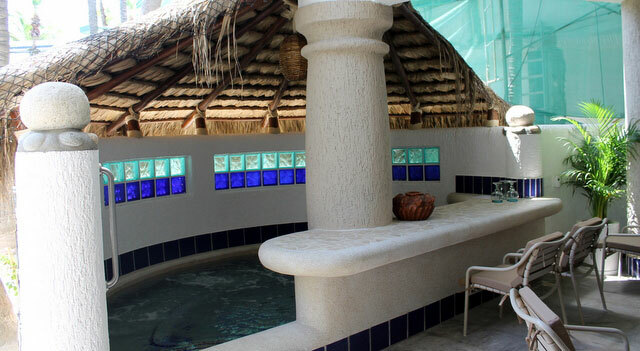 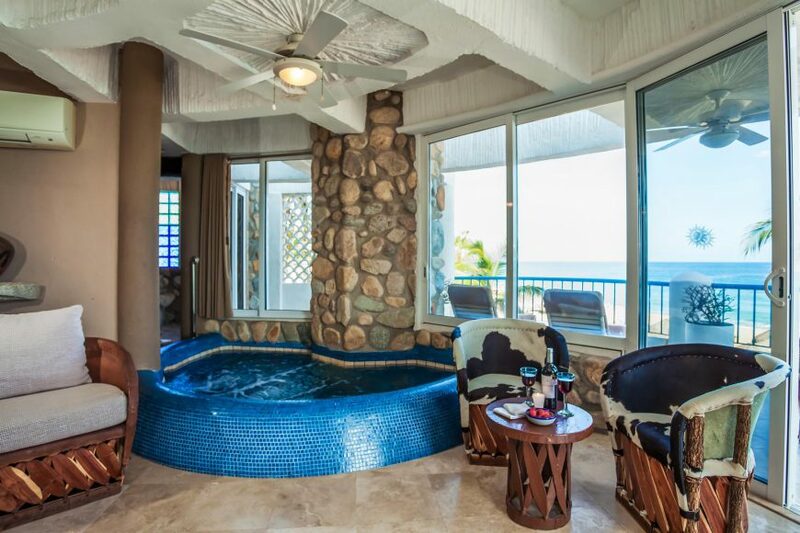 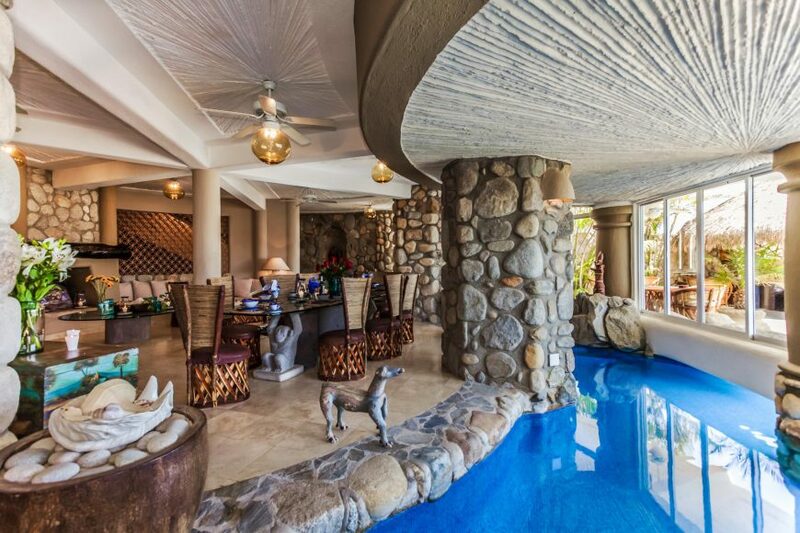 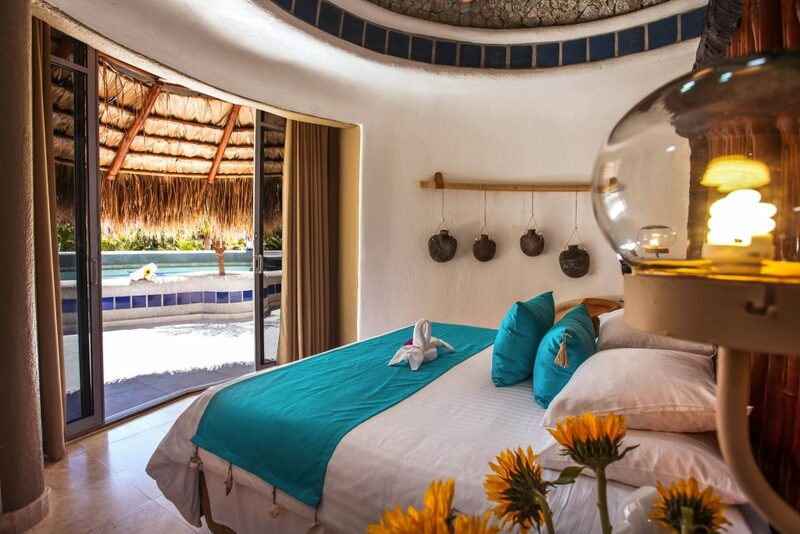 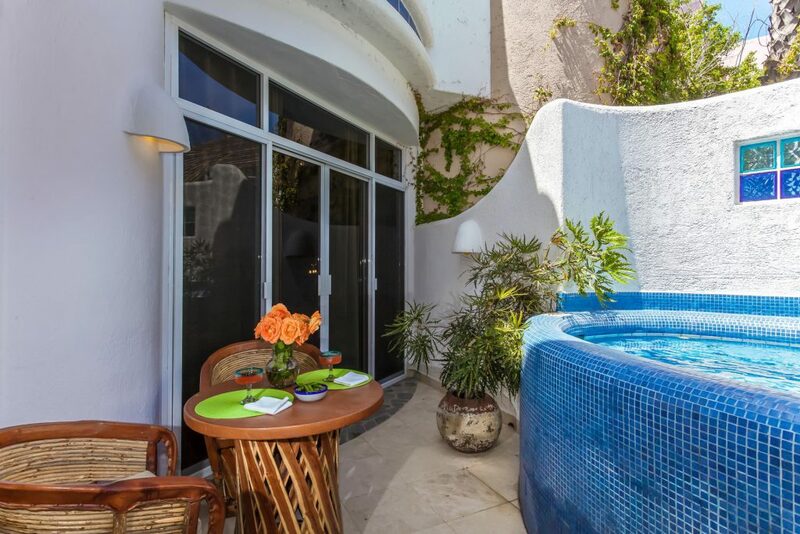 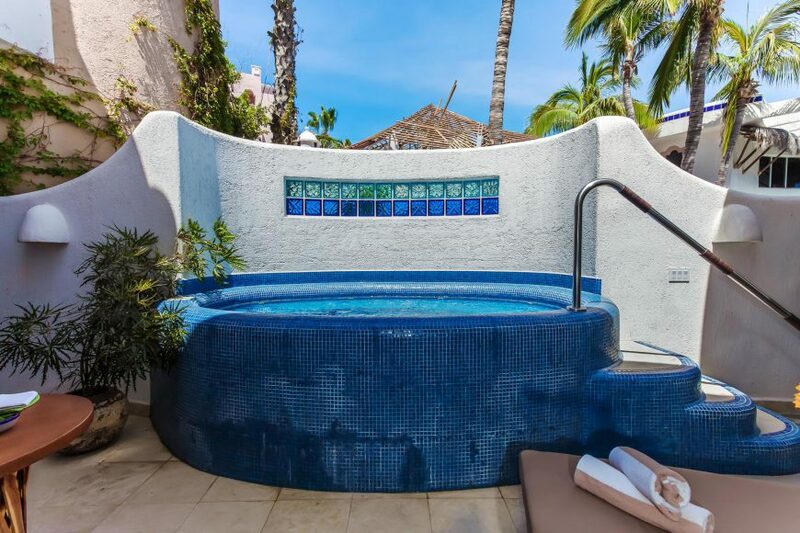 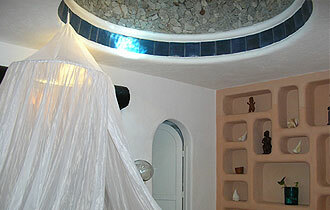 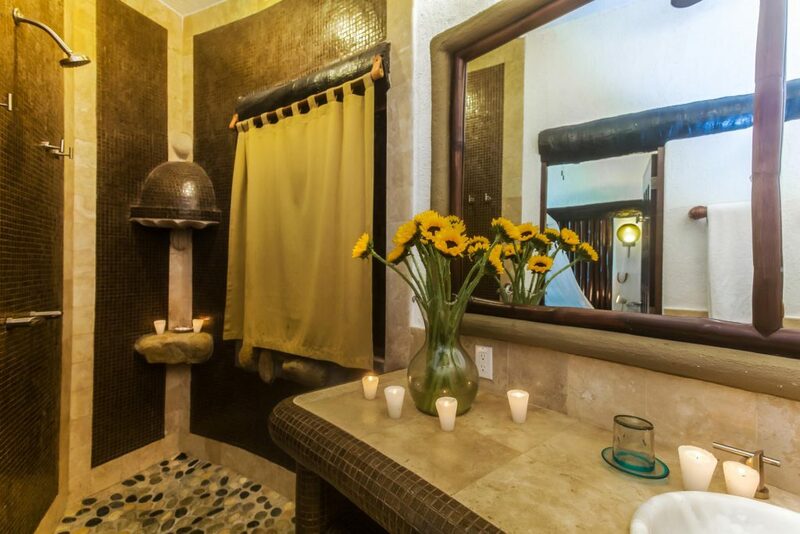 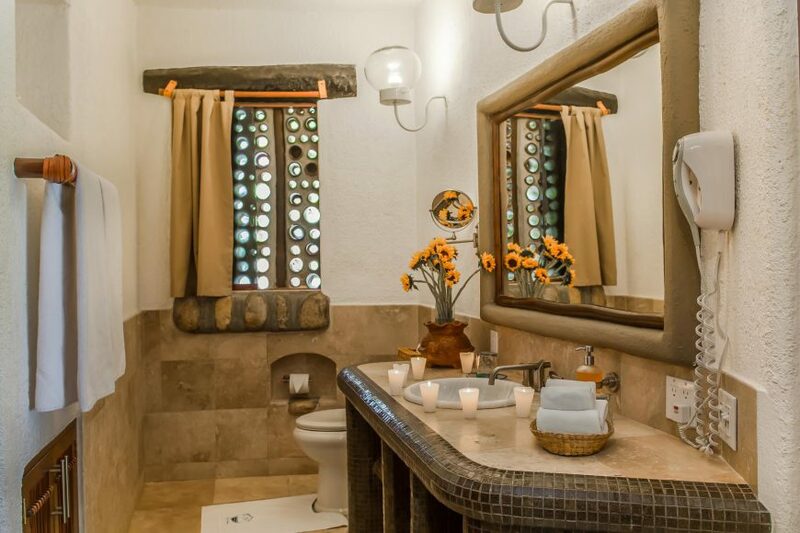 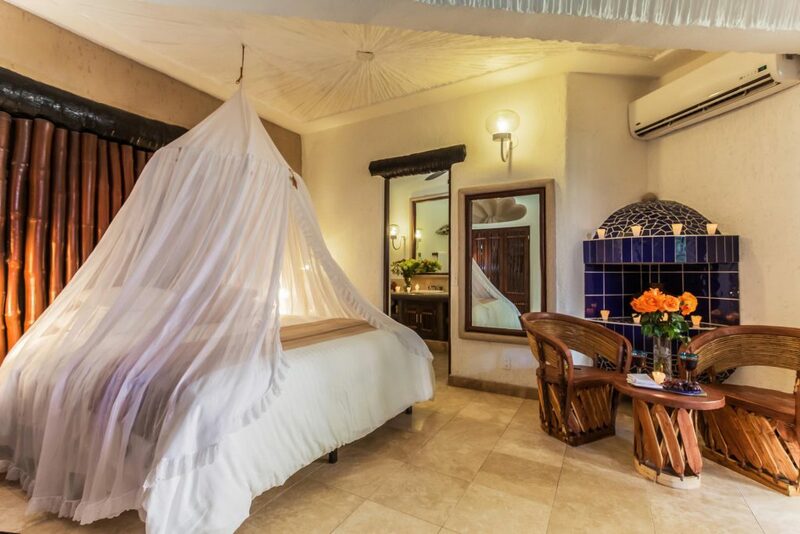 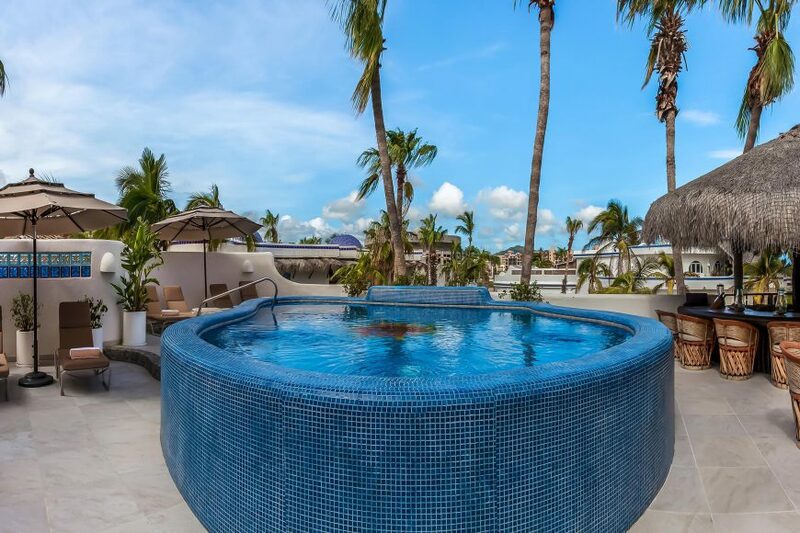 Large plunge pool with spa, swim-up sunning deck, entertaining palapa bar and private roof garden for sunbathing. 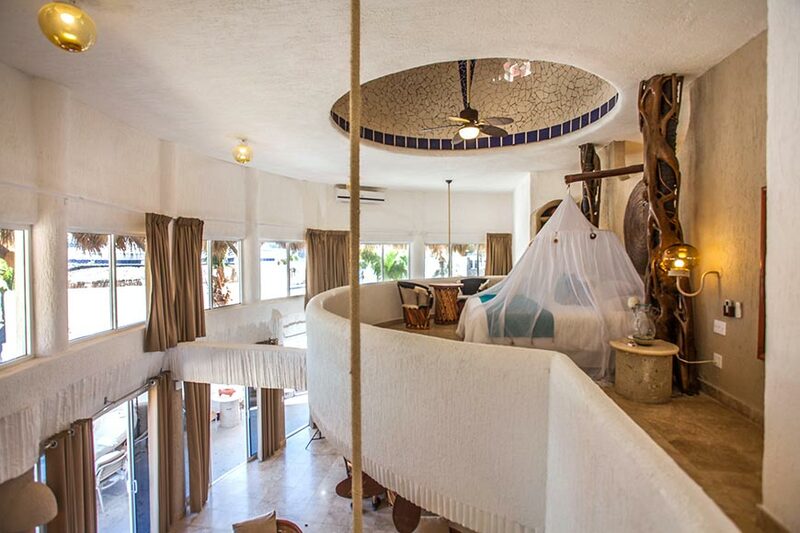 Three story unit with two bedrooms plus a studio. 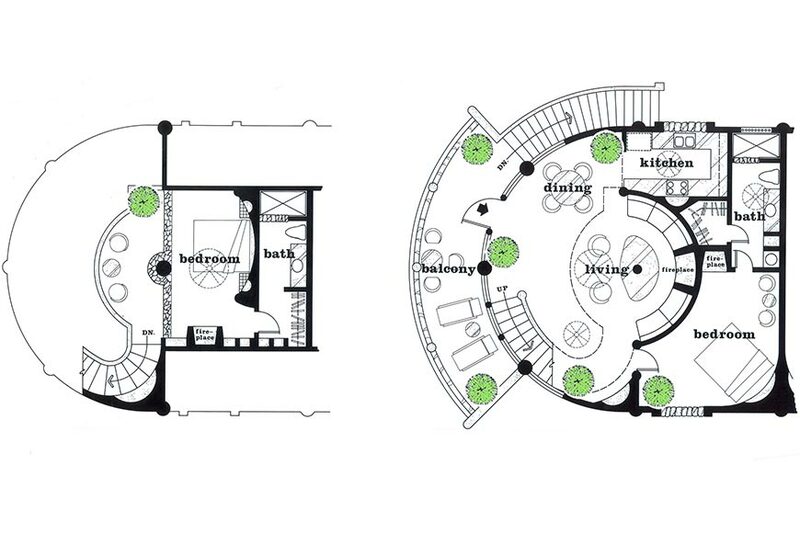 Located in buildings 5 and 7 on either the first, second or third level. 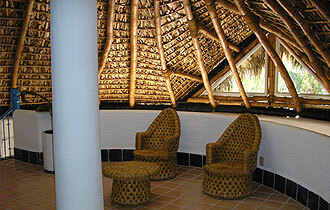 Two story unit with one bedroom. 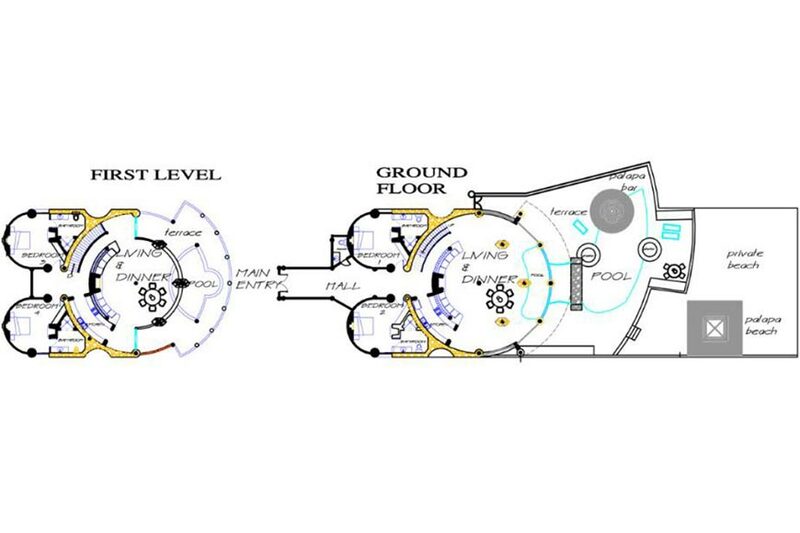 Located in buildings 21, 22 and 24 on the third and fourth levels. 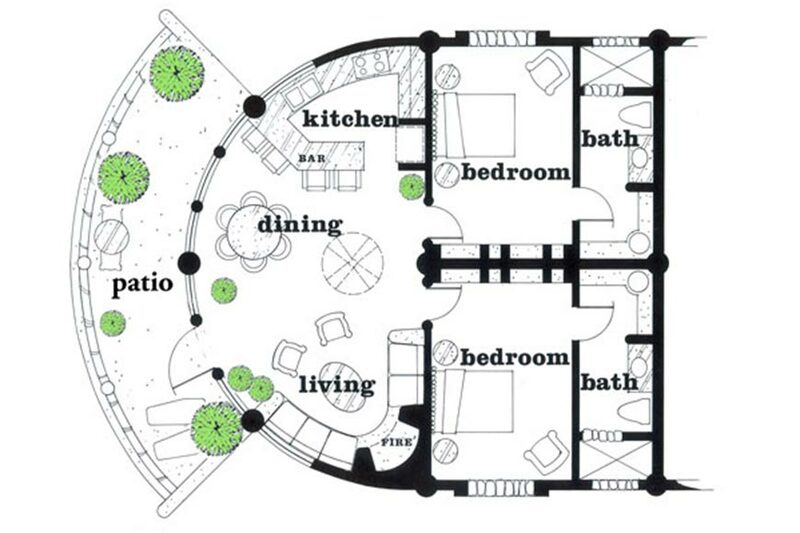 One story unit with two bedrooms. 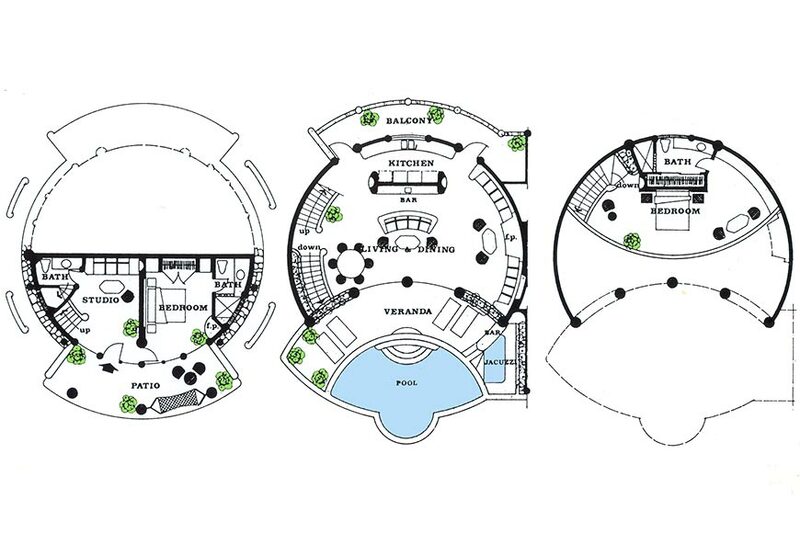 Located in buildings 8, 10, 11, 12, 13, 16, 17, 19, 20 and 23. 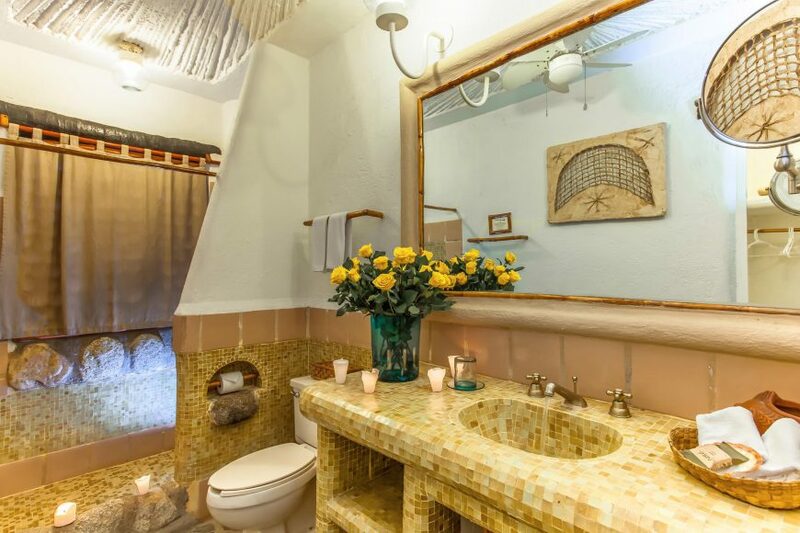 Third level stair access only. 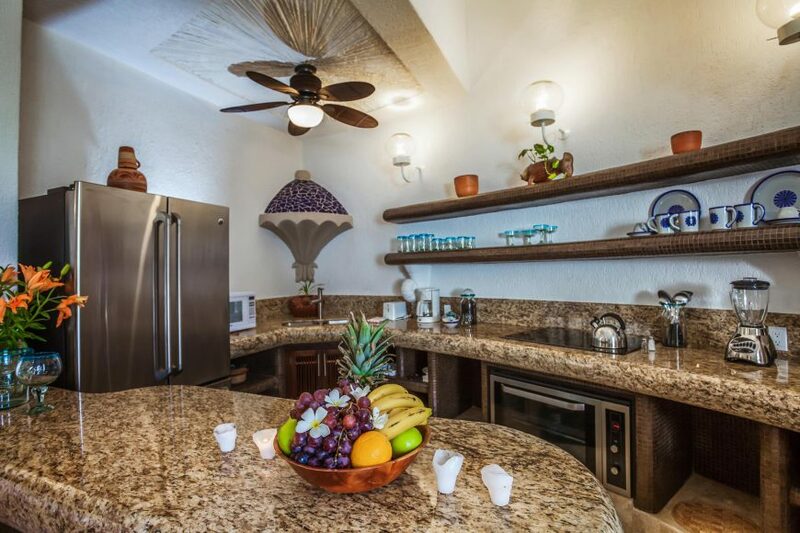 Three story unit with two bedrooms plus Studio, three and a half baths. 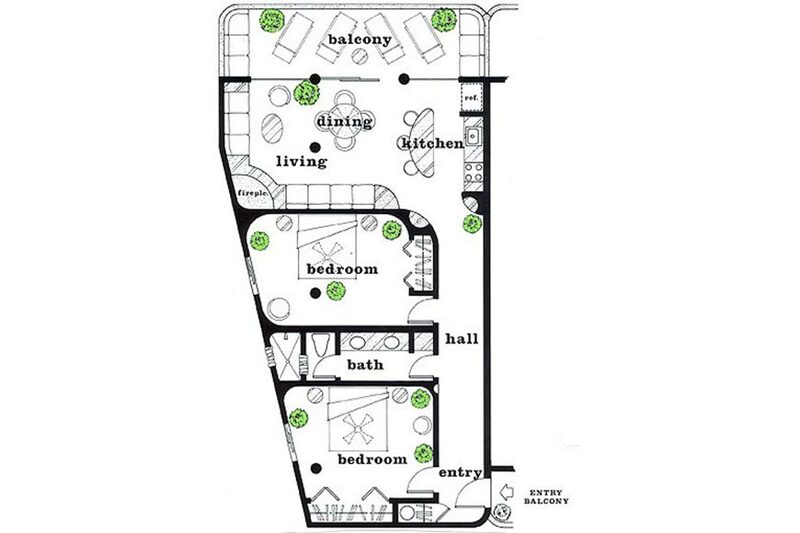 Located in buildings 2, 3, 4, 9, 14 and 15 on the first, second and third floor. 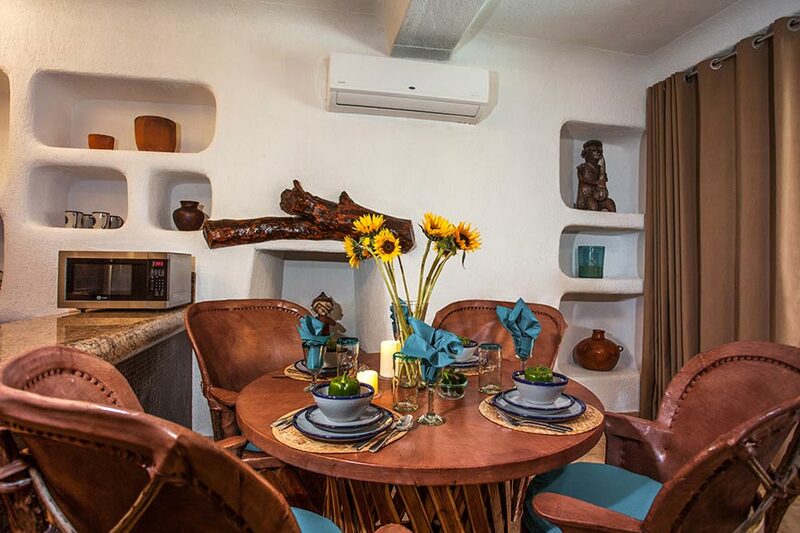 One story unit with one bedroom on the ground floor. 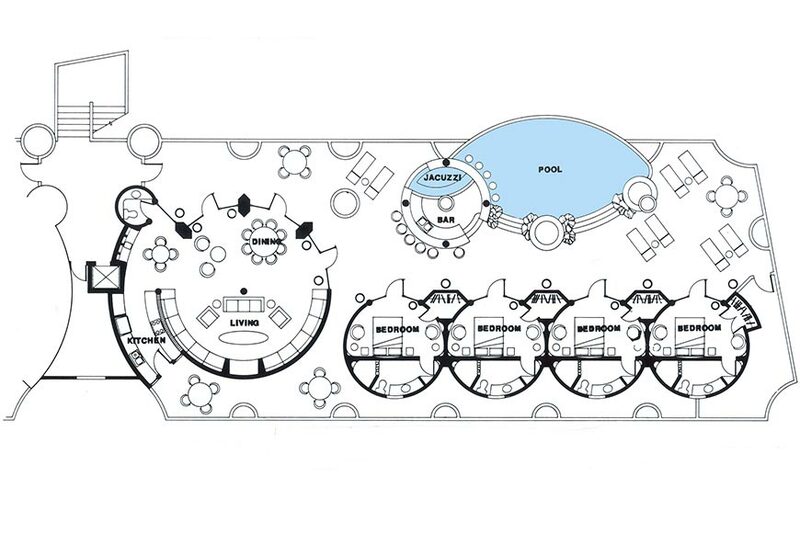 Located in buildings 1, 2, 3, 4, 5, 7, 8, 9, 10, 11, 12, 13, 14, 15, 16, 17, 18, 19 and 20. 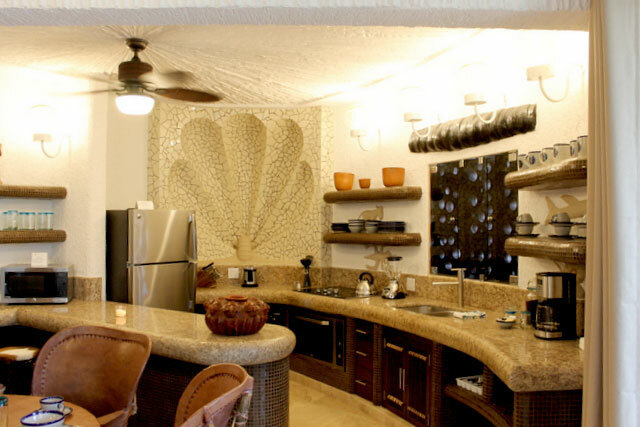 Two story unit with three bedrooms. 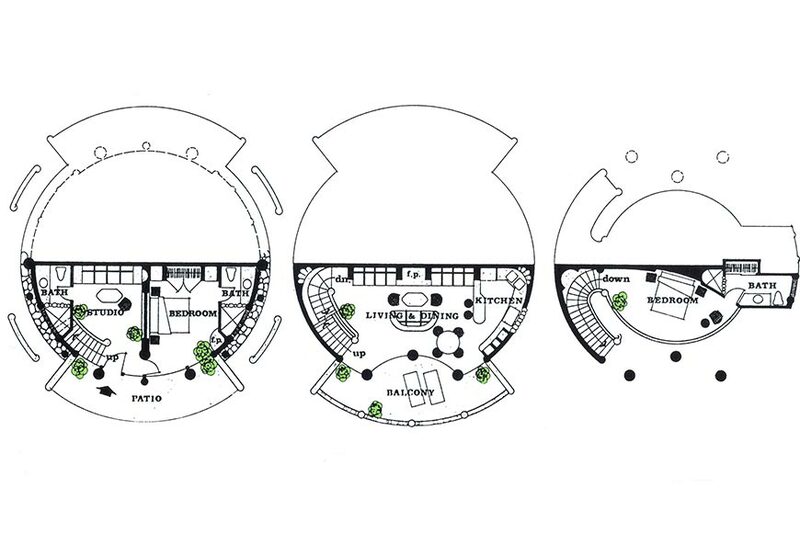 Located in building 6 on the second and third floor. 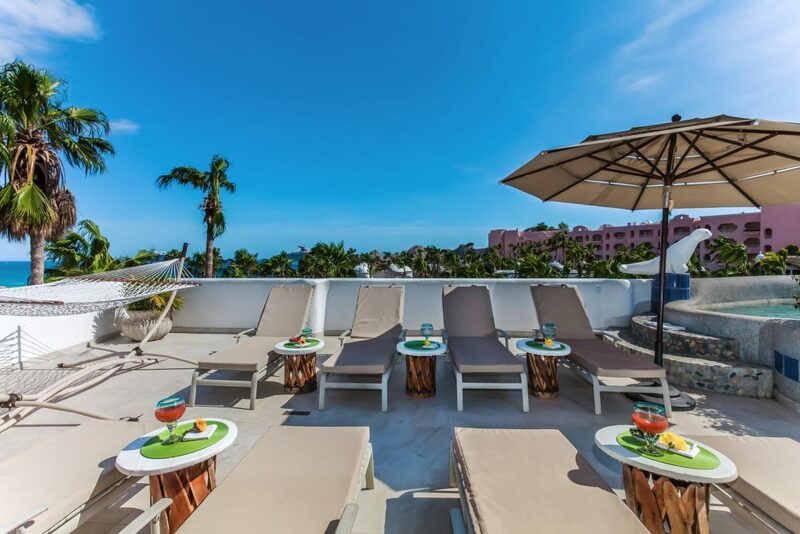 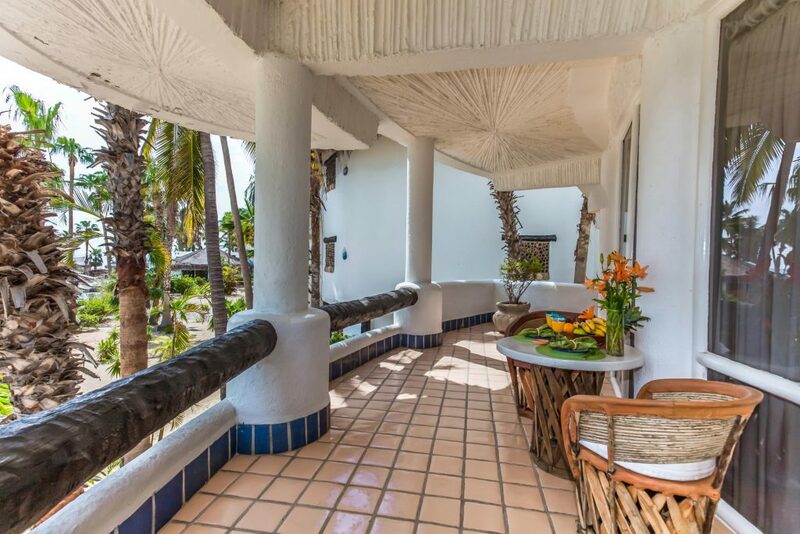 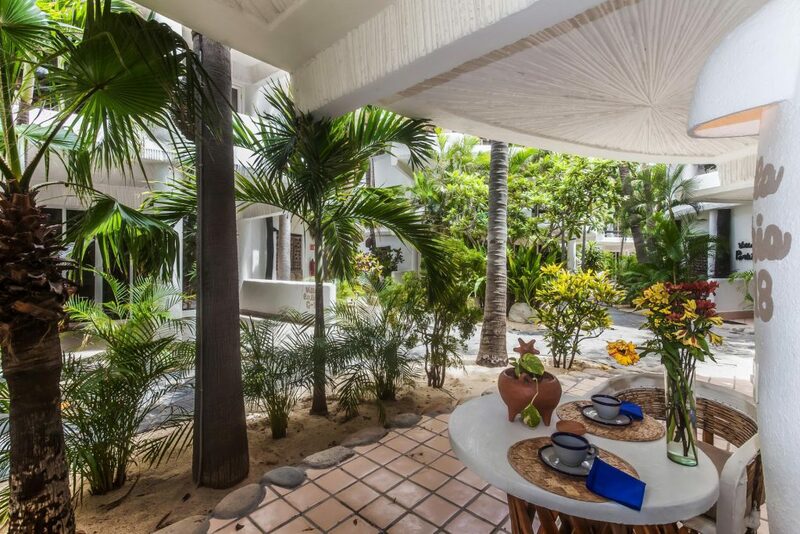 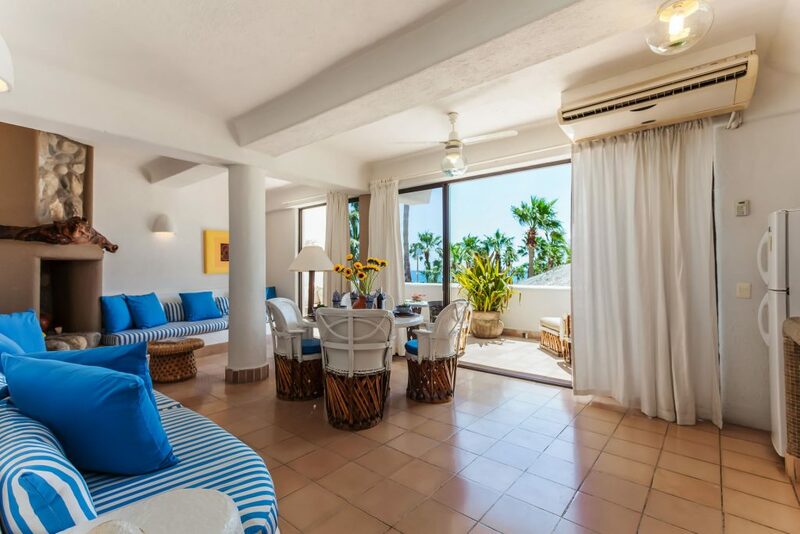 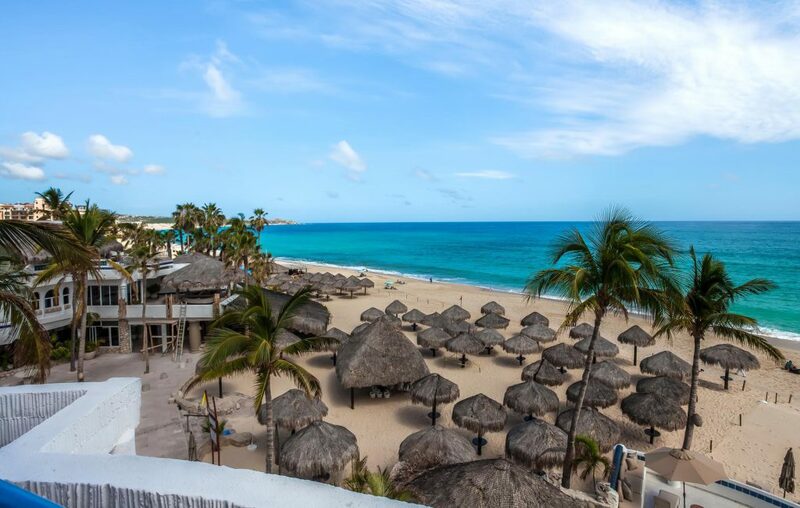 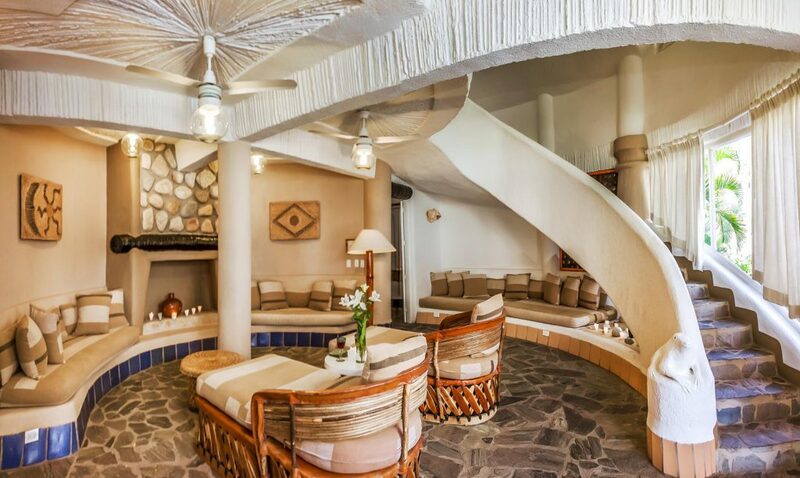 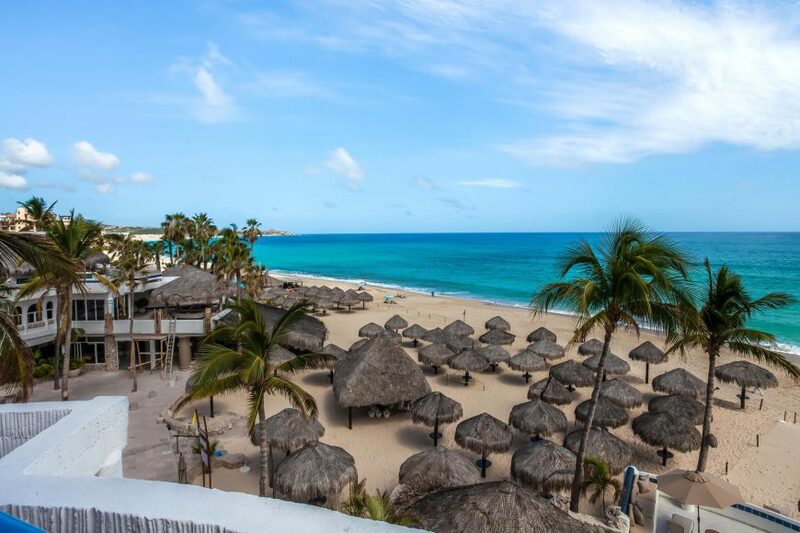 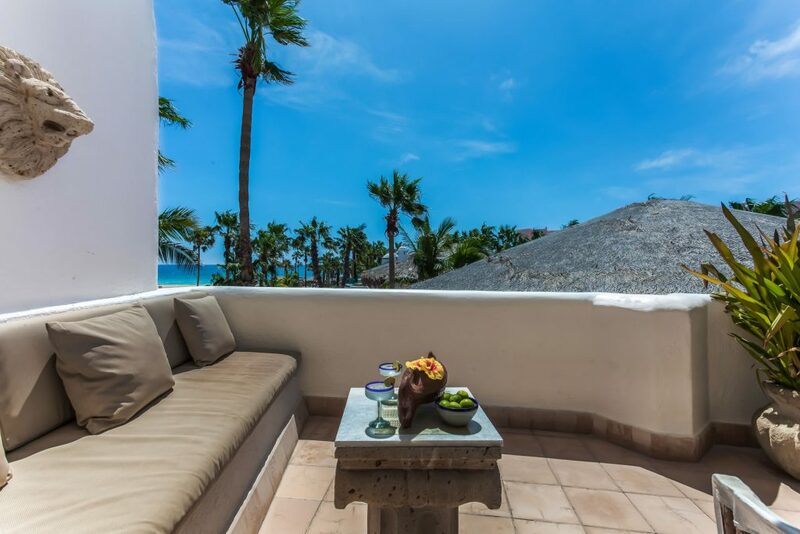 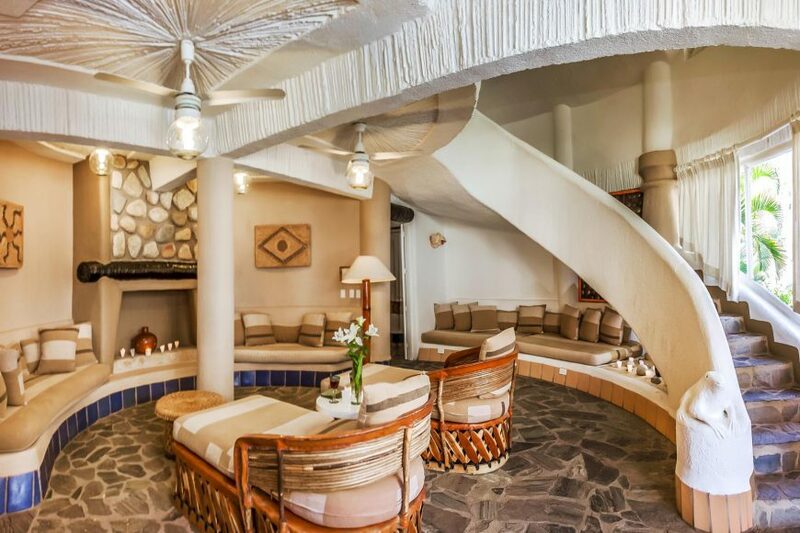 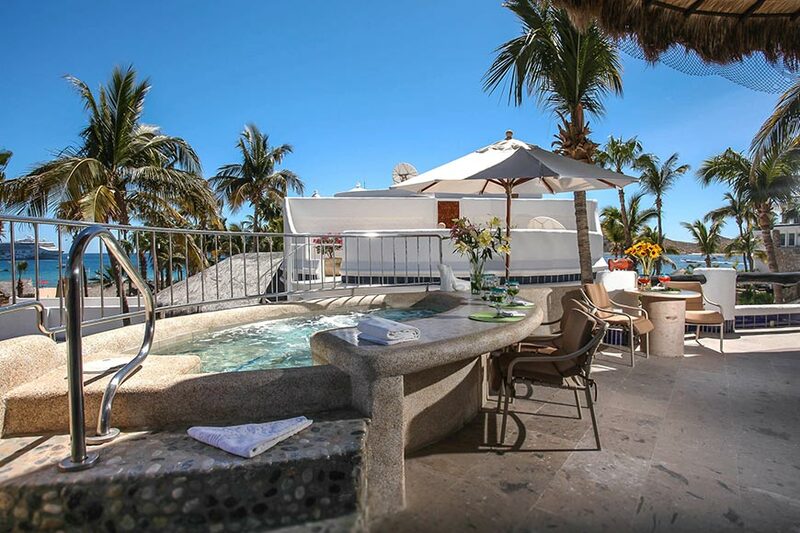 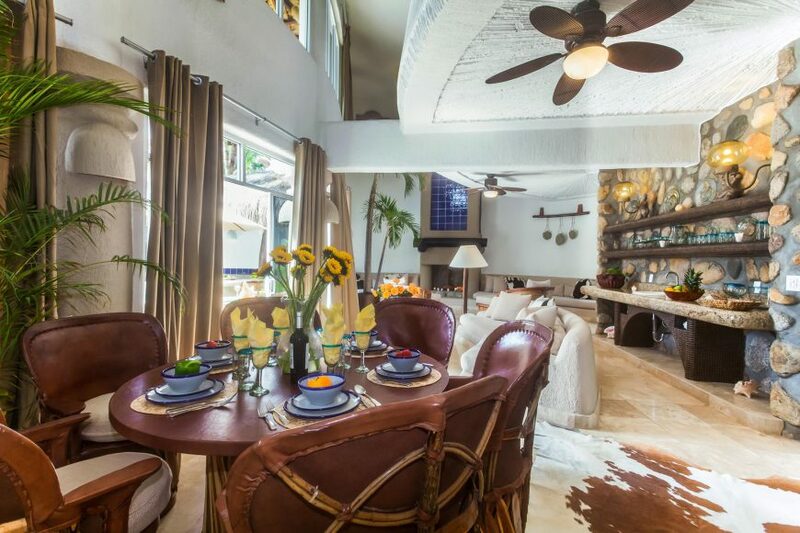 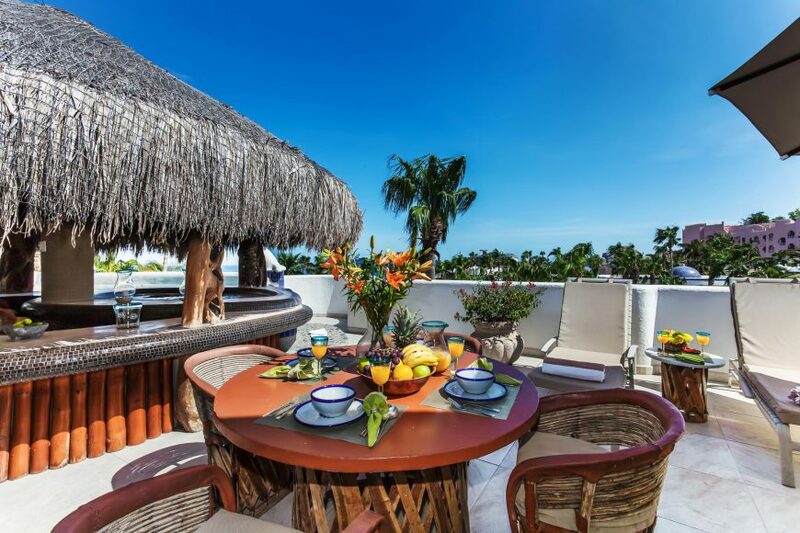 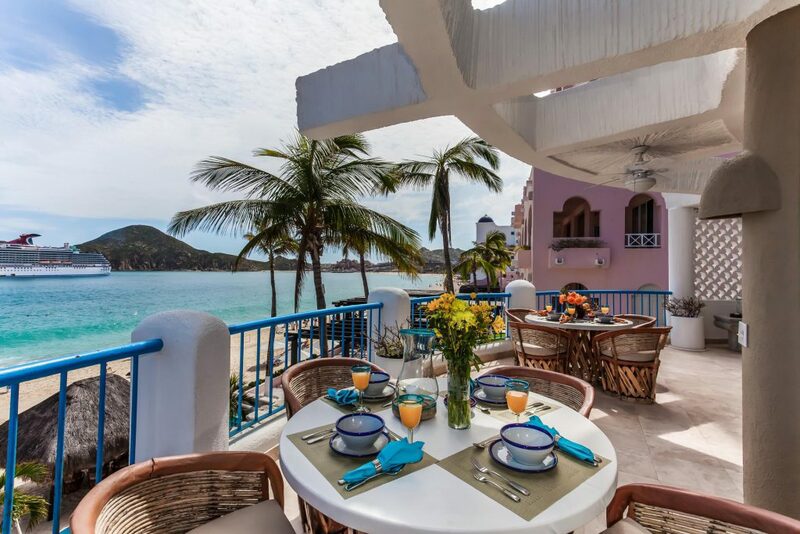 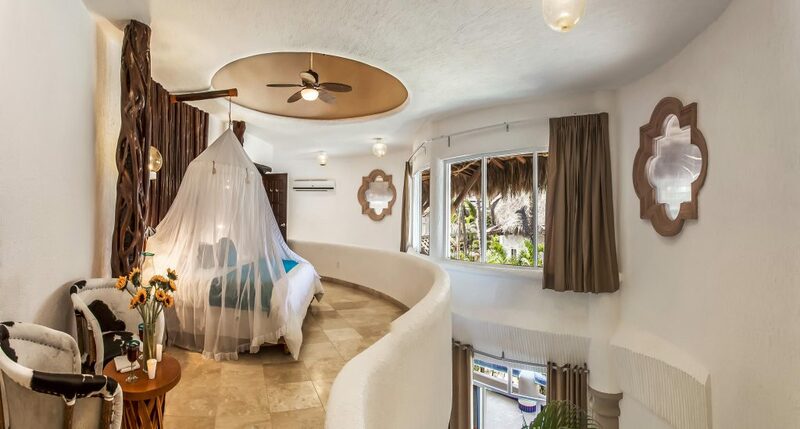 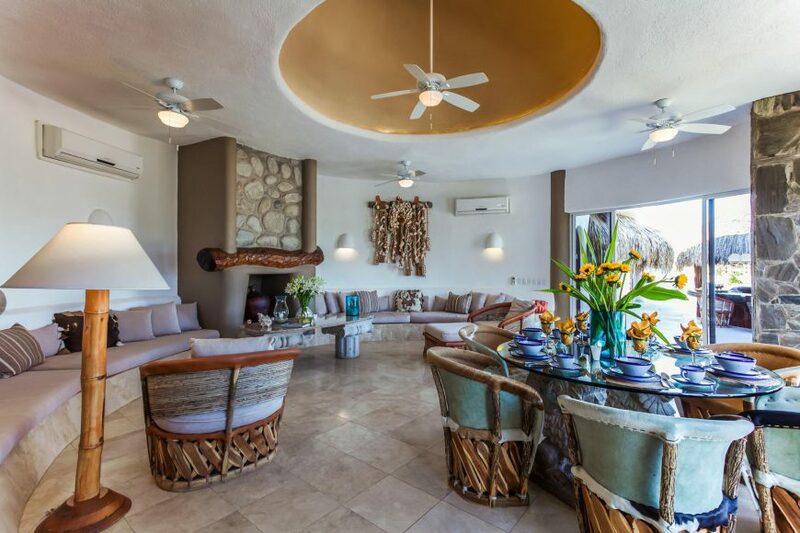 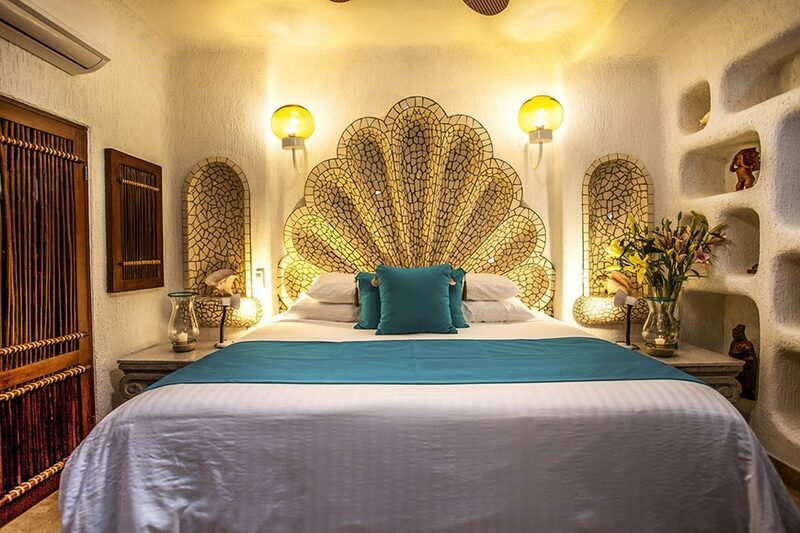 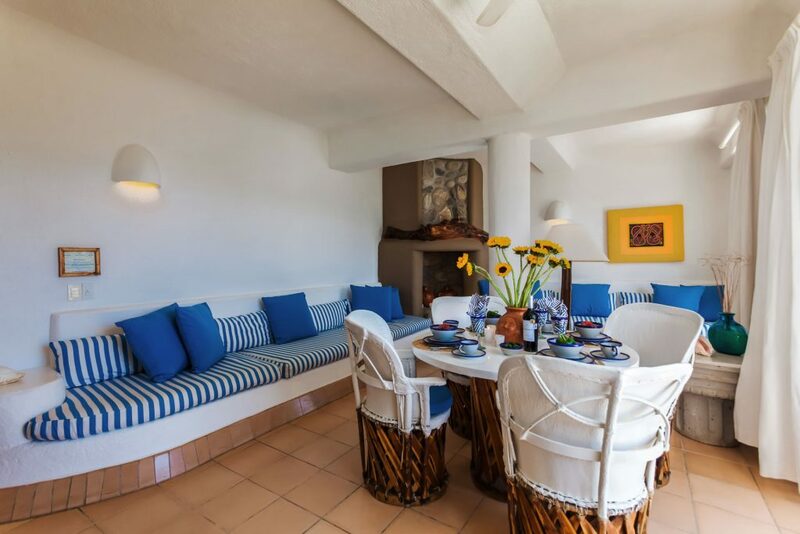 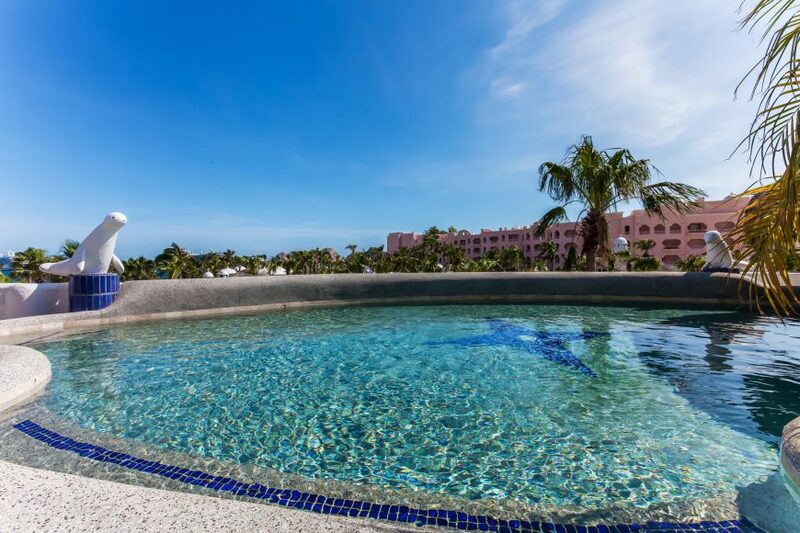 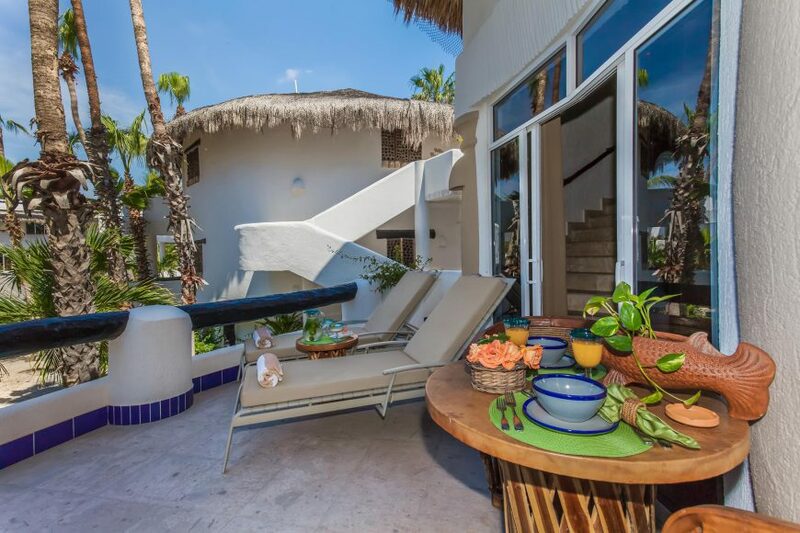 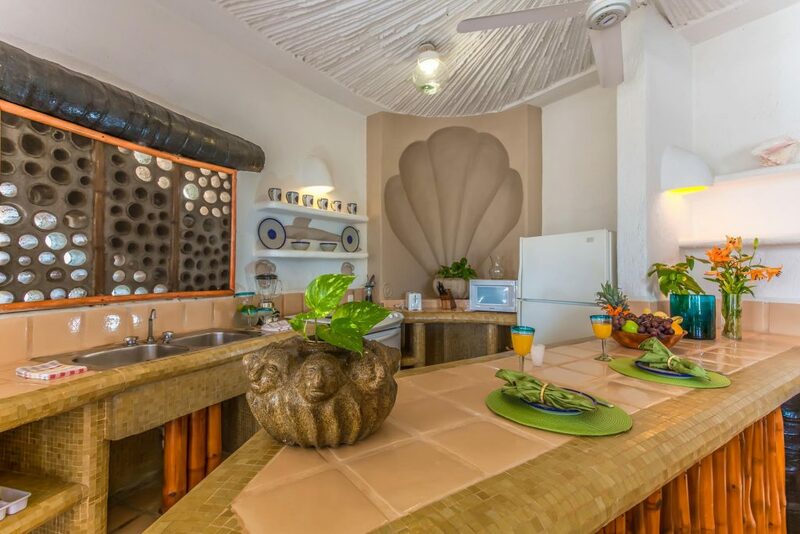 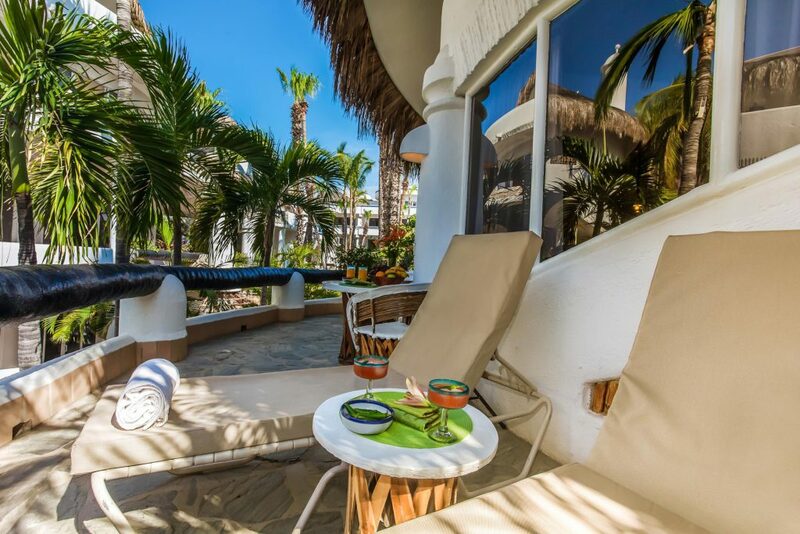 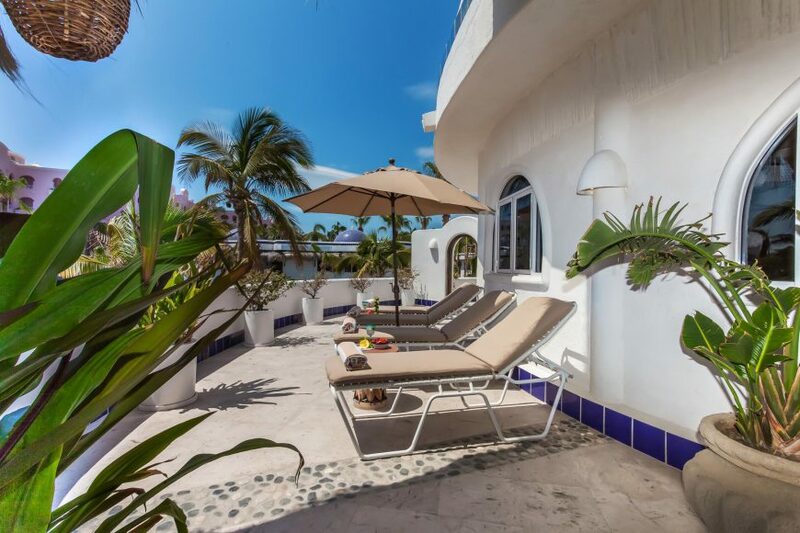 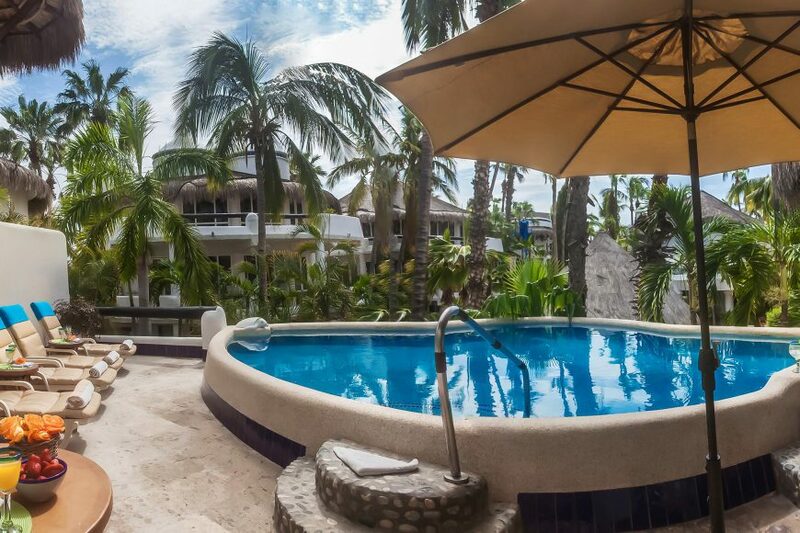 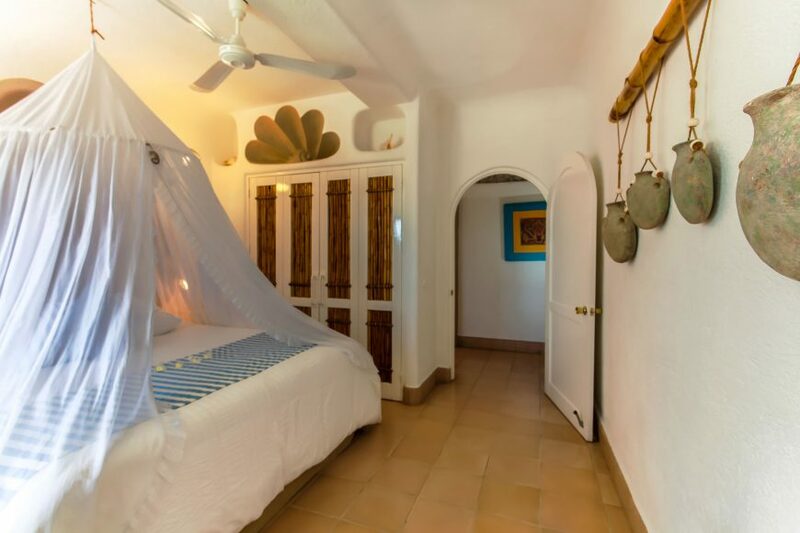 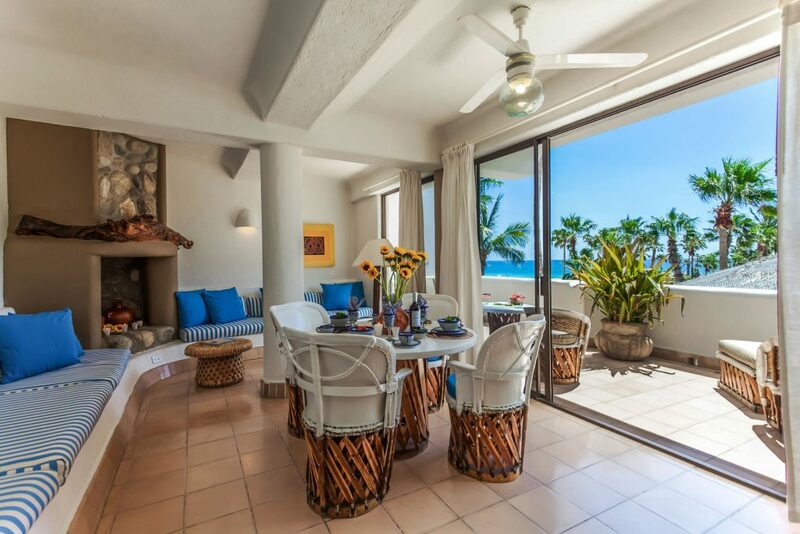 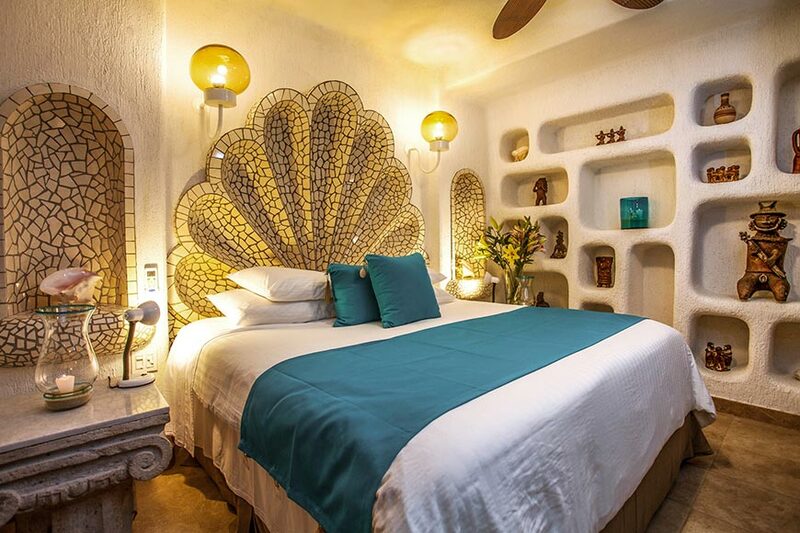 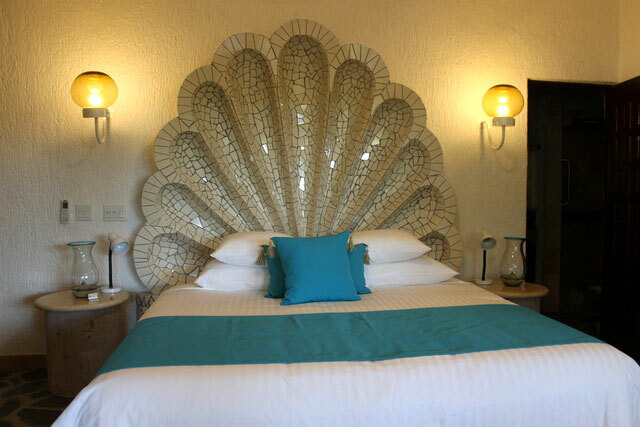 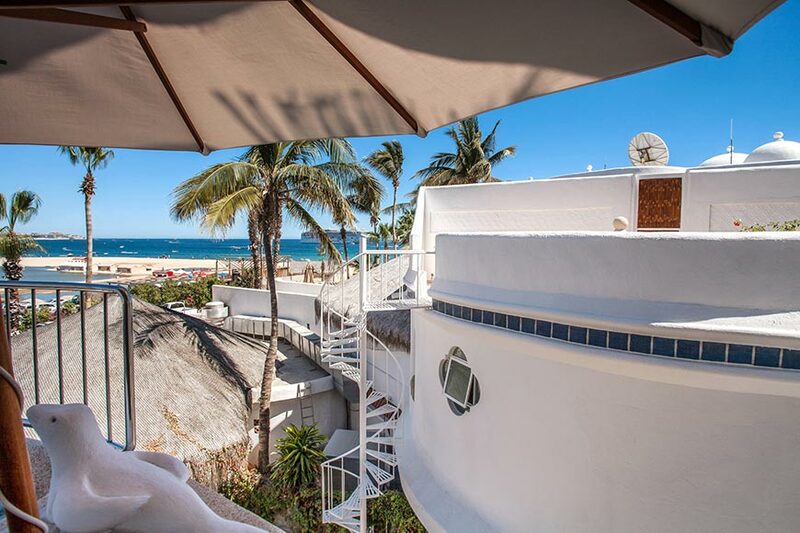 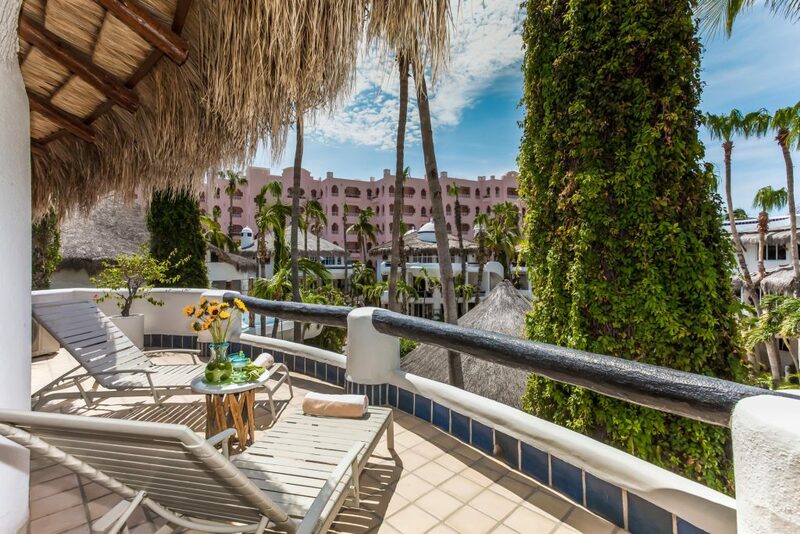 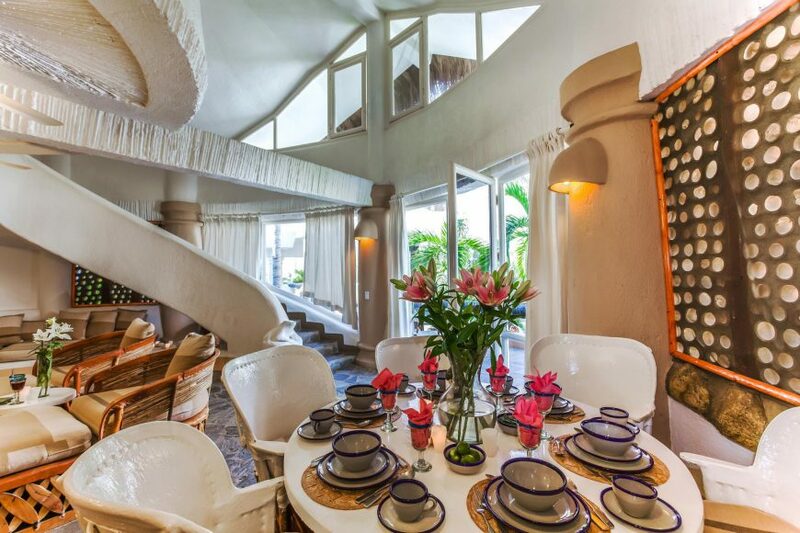 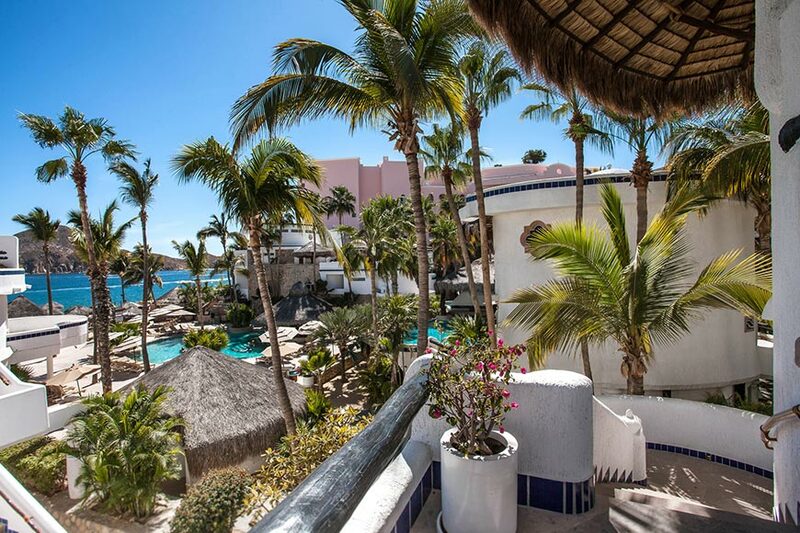 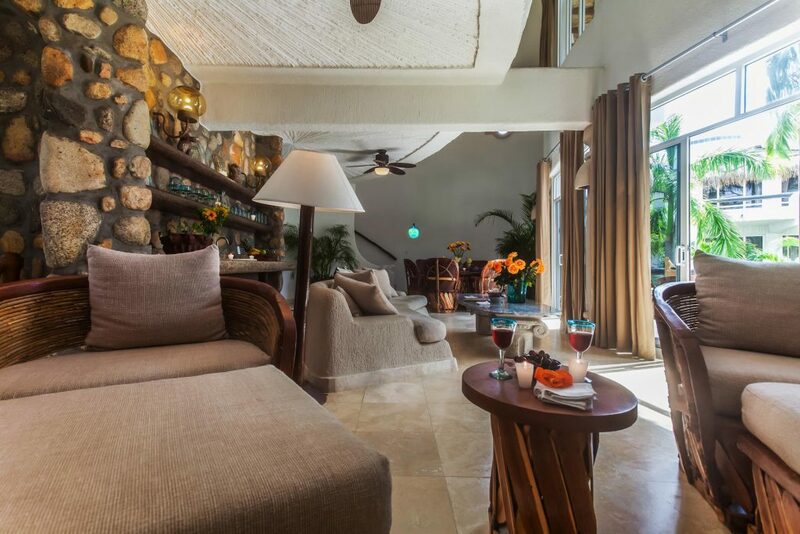 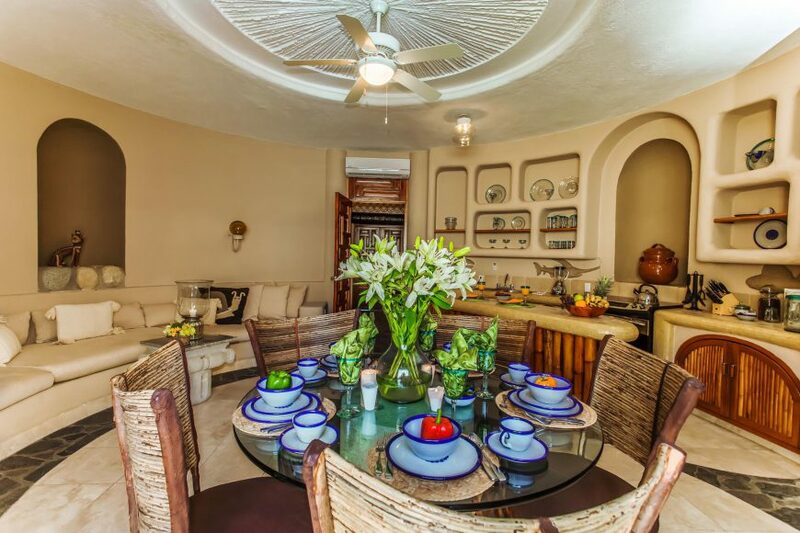 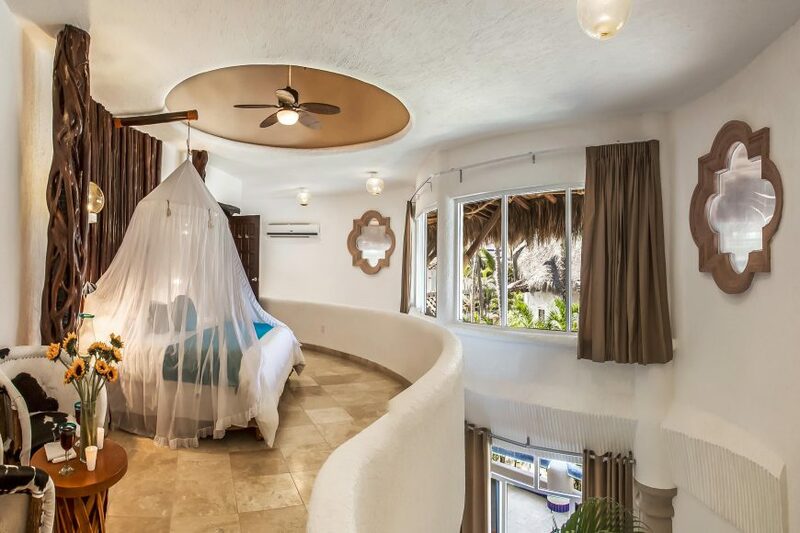 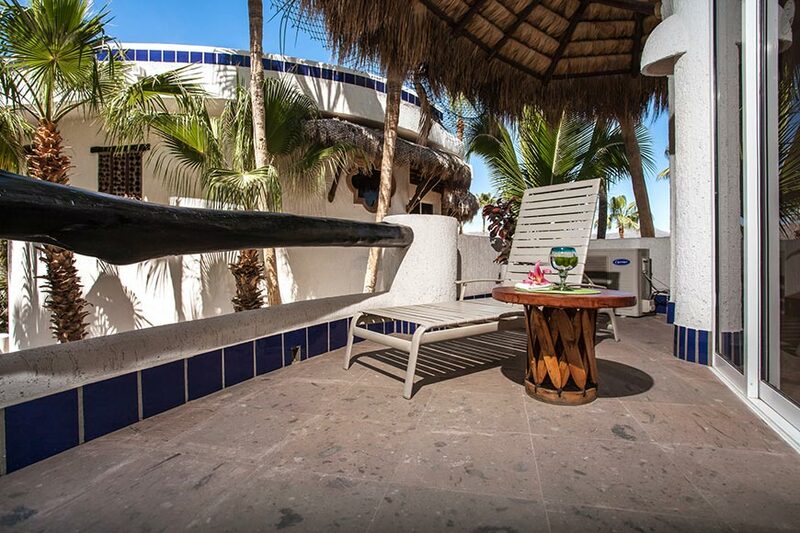 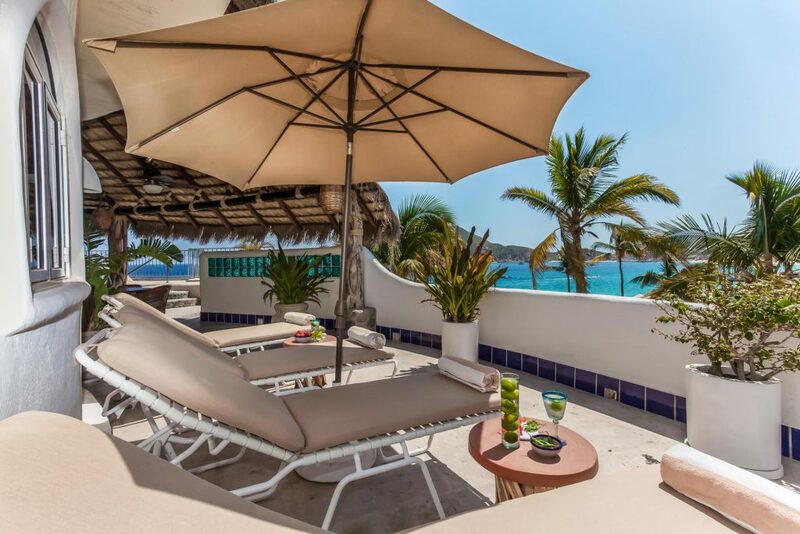 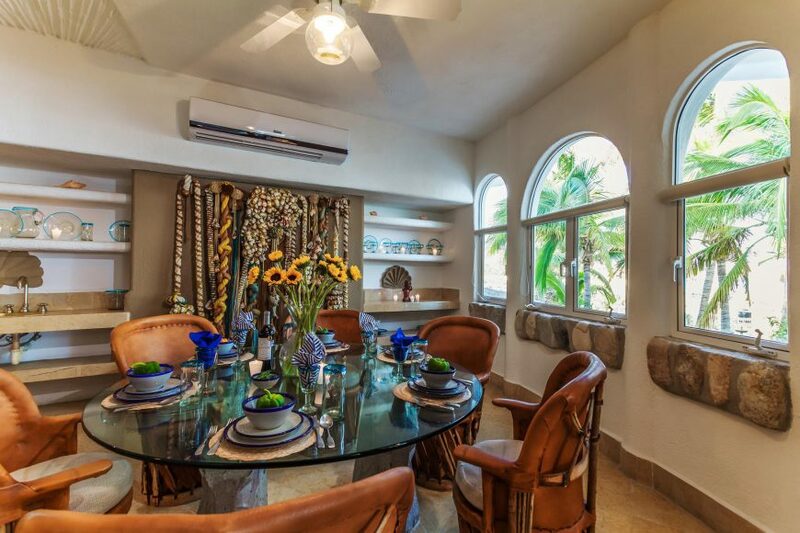 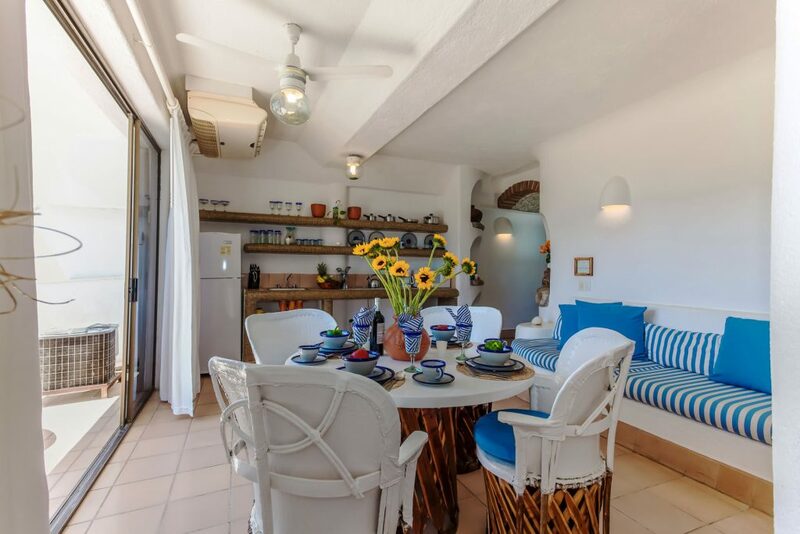 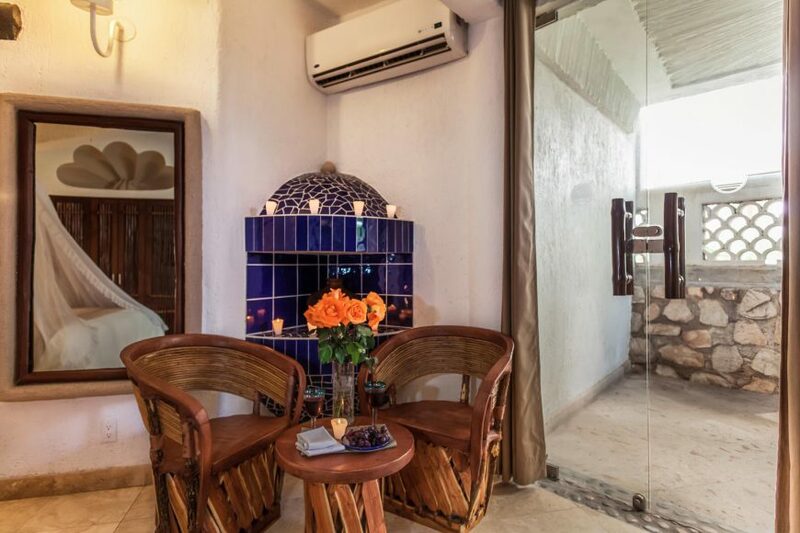 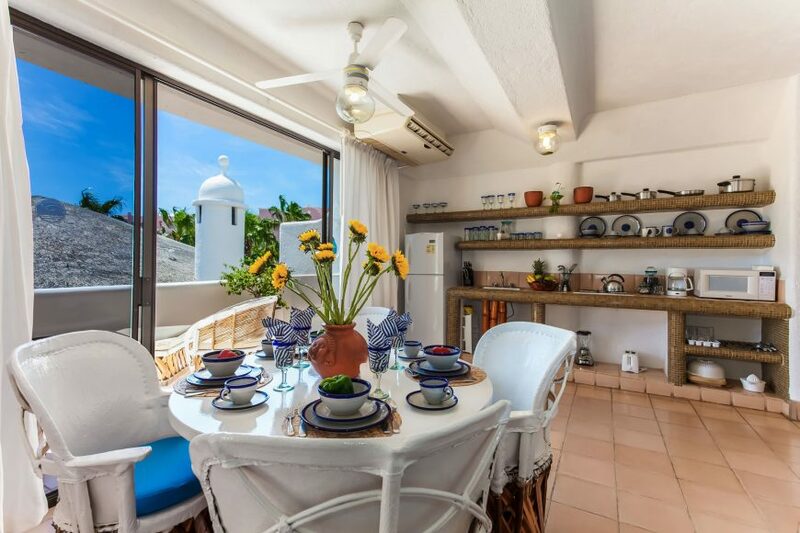 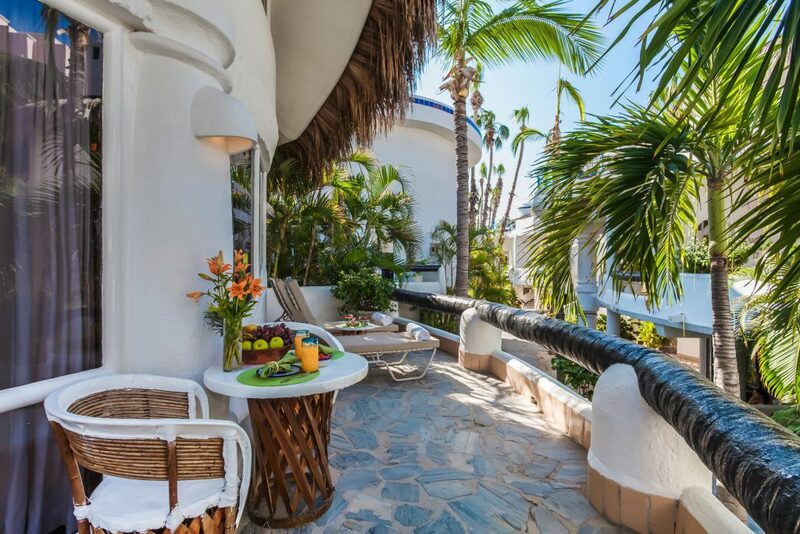 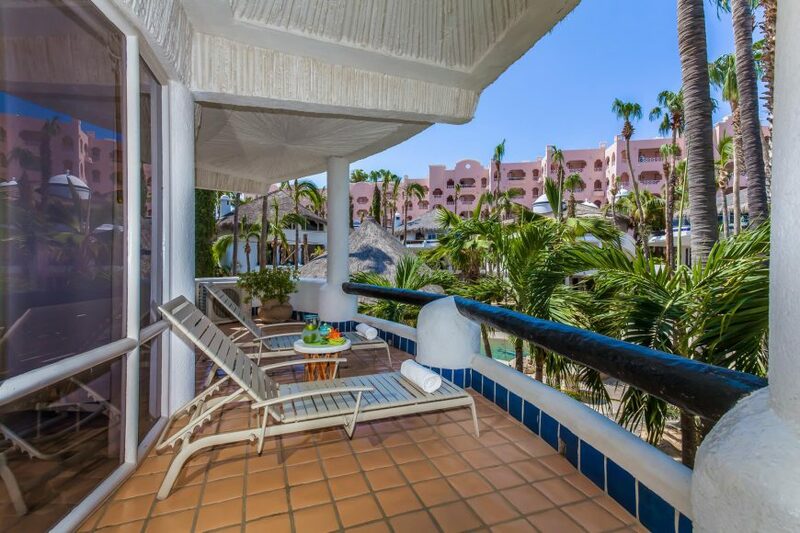 Two story unit with three bedrooms including an oceanfront master suite, beach front living and dining area with terraces and a large sundeck, private elevator and ocean view palapa bar. 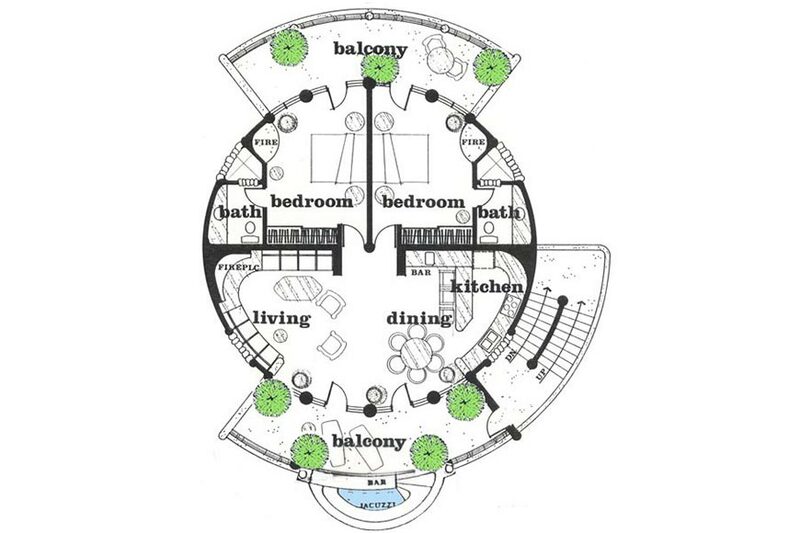 Two story unit with two bedrooms. 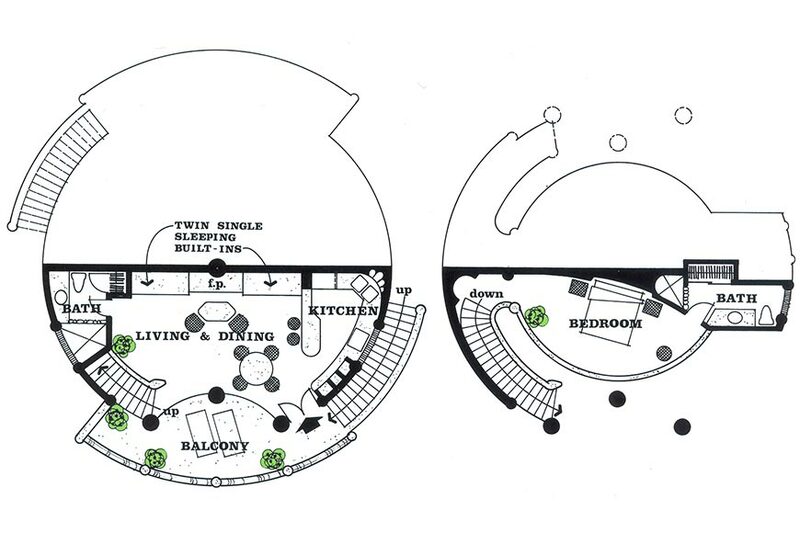 Located in building 18 on the second and third level.